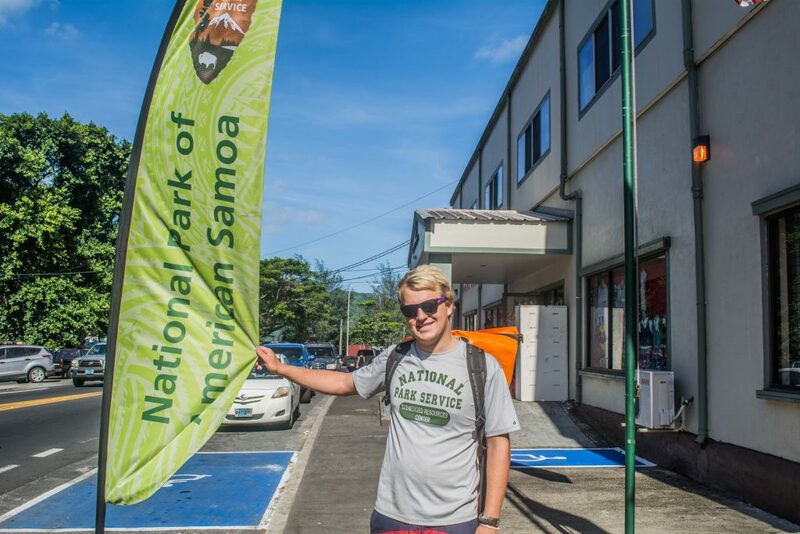 The last stop on my whirlwind adventure of an internship was American Samoa. 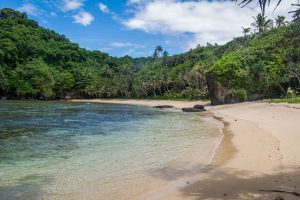 Prior to booking the flights, I didn’t even know where American Samoa was, let alone anything about the island that awaited me on the other side of the 6-hour flight. I didn’t even know who was meeting me at the airport! 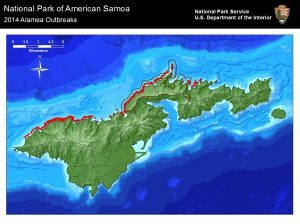 Fortunately, when I landed in American Samoa the night of Friday, September 9th and made my way out of the airport, I looked so lost that I was approached by two strangers who turned out to be Biological Science Technicians Michele Felberg (the 2015 OWUSS North American Rolex Scholar!) and Paolo Marra-Biggs. While I was ecstatic that I was finally here – I have heard so many wonderful things about American Samoa throughout my journey – I was also exhausted from the long day of travel. As we drove to the village of Utulei, where I would be staying with Michele, darkness hid the island from view. Yet still, the sound of the waves hitting the shore along the coastal road and the palm trees faintly lit by the occasional streetlight seemed to taunt me in my tired and sleepy state. The village of Utulei during the day. The orange trim of my house for the month is barely visible above the trees. The next morning I woke up to the smell of Michele cooking a Welcome brunch for me. Soon Paolo, fellow park service employee Ian Moffit, and his girlfriend Nerelle, came over, donning me with a lei as they walked in. It was quite the welcome party! Following brunch, Paolo and Michele took me on a grocery run and gave me a brief introduction to the island. 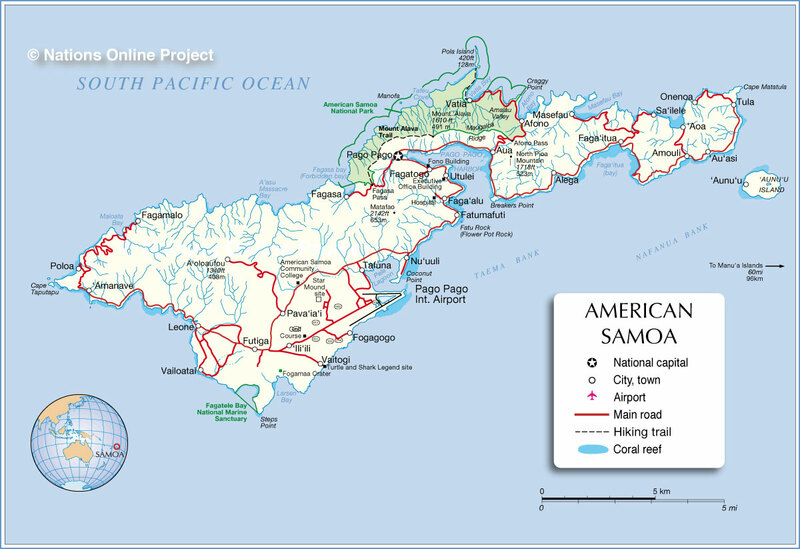 American Samoa is the southernmost territory of the US at 14° south of the Equator, and it consists of five main islands and two coral atolls. 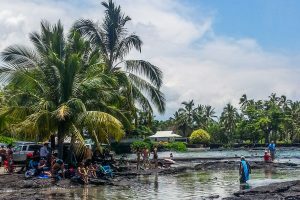 Boasting a population of around 60,000, the big island of Tutuila is only slightly larger than Washington DC. Here, there is only one main road and it runs east-west along the length of the island, hugging the dramatic southern coastline. 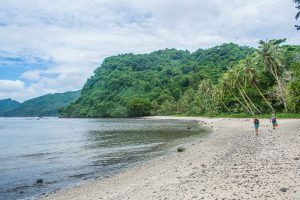 As we drove through what seemed to be taken from the pages of a travel magazine, beautiful blue water gave way to long stretches of sandy beaches on our left, while we passed by mountains flaunting lush green rainforests and towering over quaint villages on our right. 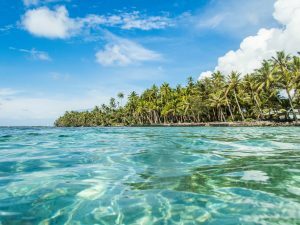 The rest of the weekend was a blur of sensory overload as I took in the pristine natural beauty of my new island home, from wading in the shallow lagoon at Coconut Point to looking out over the village lights at night from atop Aoloau. 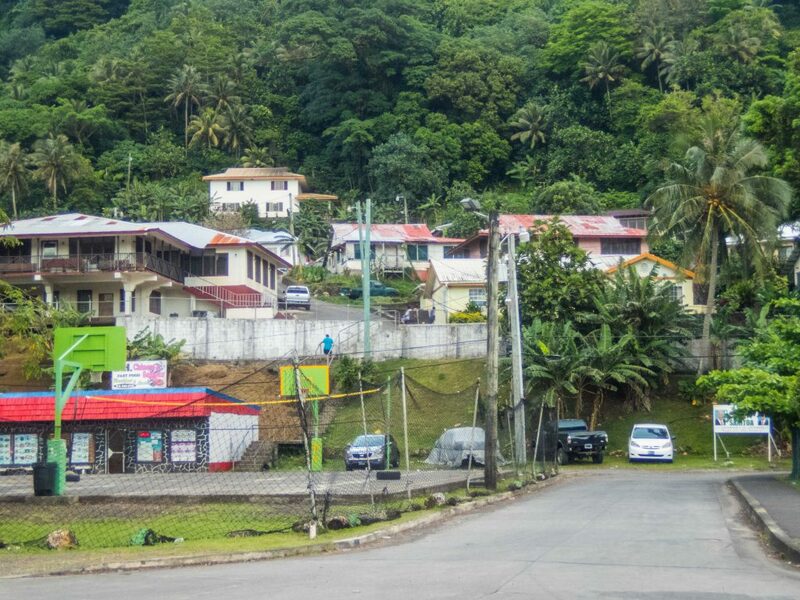 When I arrived at Park Headquarters in Pago Pago for my first day, we got straight to work. 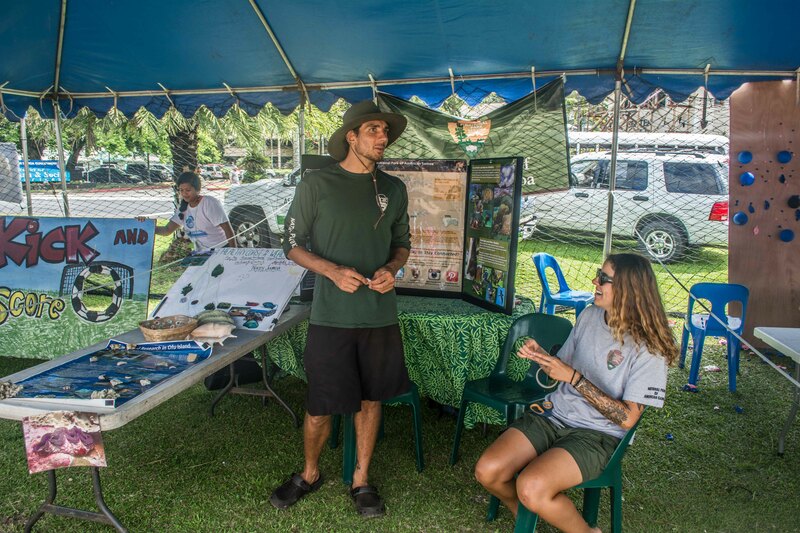 The National Park of American Samoa (NPSA) encompasses over 13,000 acres, of which, about a third are marine, which means the marine team is kept very busy! To start us off, Marine Ecologist, Tim Clark, called a morning meeting to discuss the weather forecast and to go over the plans for the week ahead. 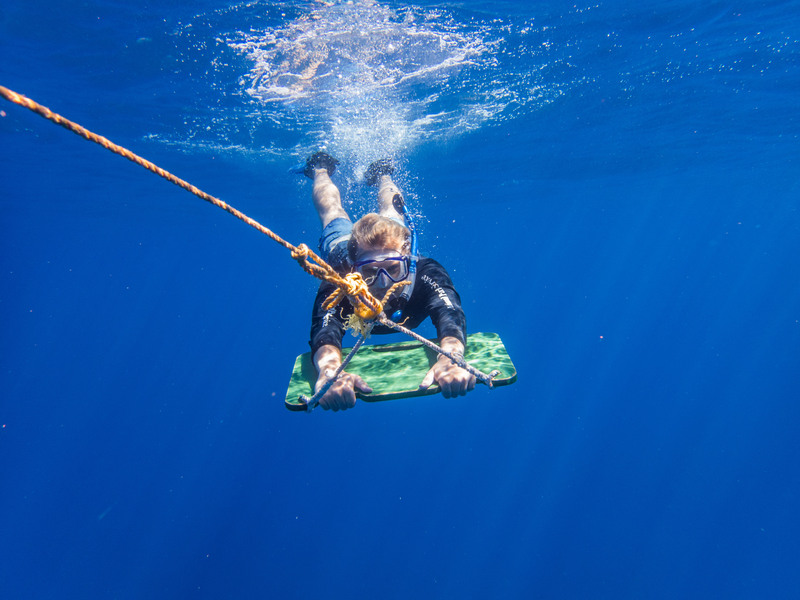 With the wind and waves holding steady over the next few days, our goal for the week was to tow-board the entire north side of the island looking for outbreaks of crown-of-thorns sea stars (COTS), a voracious echinoderm that feeds on corals. For the past few years, the NPSA marine team has been monitoring a large-scale COT outbreak on the northern coast of the island. 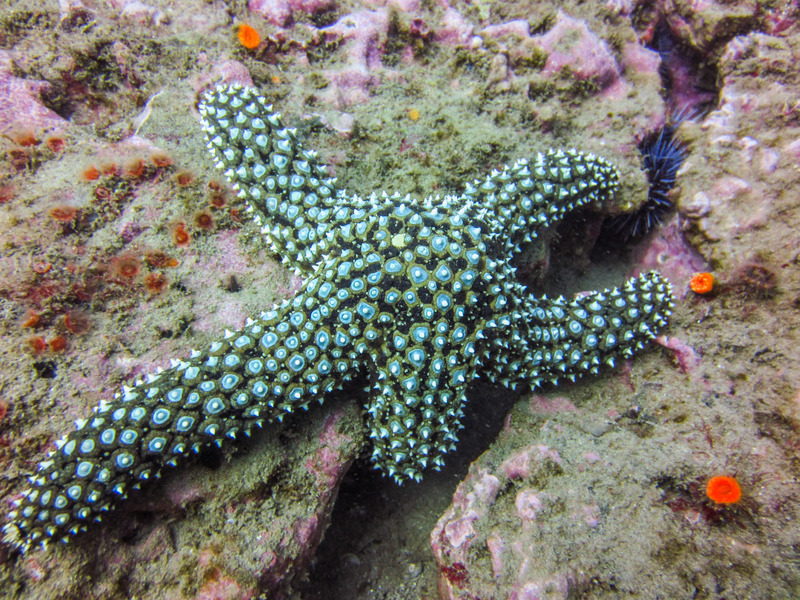 Although these sea stars are native to the Indo-Pacific, because they prey upon living corals, population surges can overwhelm and often decimate an entire reef. Thus, in an attempt to rescue the reefs here, the Park Service has undergone eradication efforts to control the population and return it to a natural level. 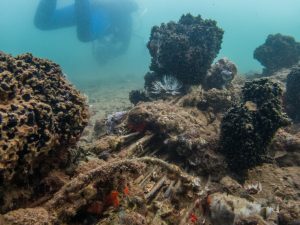 They have gone on hundreds of eradication dives and killed thousands of COTS, all in hopes of restoring balance to the reef. So, our mission for the week was to determine the current status of the outbreak by locating and documenting the individual COT outbreaks along the coast. After putting together a Float Plan, a document detailing our plan for the day as well as any and all complications that could arise, we headed to the warehouse to grab the boat and gather the gear. Within the hour we were on the water, launching out of Fagasa, and ready to towboard. Towboarding is a survey technique where two people are towed behind a boat while looking down at the reef. In this case, we were looking for signs of COT outbreaks. Paolo and Michele being towed behind the RV Poge. 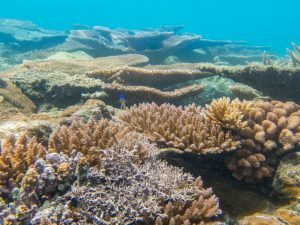 Traditionally, in an area with a COT, one will see a gradient of discoloration on a stretch of reef, ranging from bone-white, where the most recent meal was, to a faded yellow, where algae has begun to grow overtop of the dead coral skeleton. However, this can be hard to spot from 60 feet above the reef and it took me awhile to develop a search image. 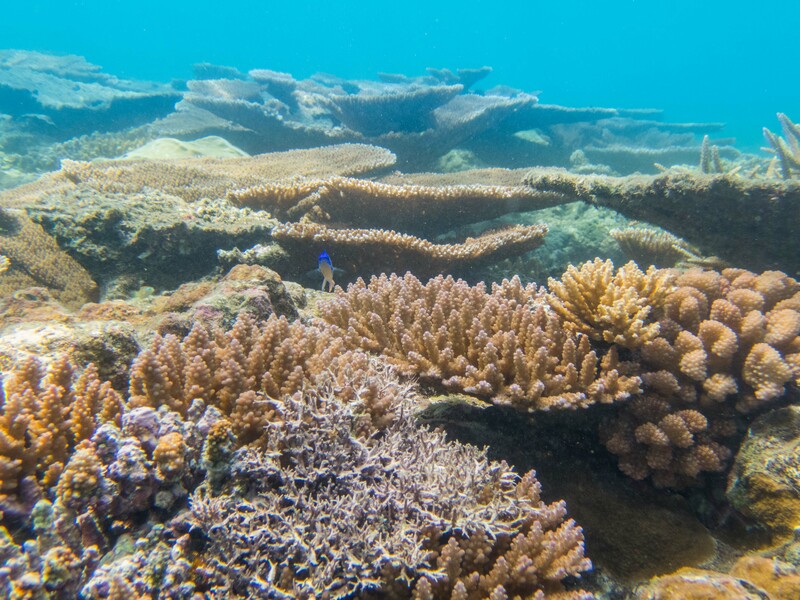 Not every patch of bright white on a reef indicates the presence of a COT, as both coral bleaching and coral disease often leave behind a white coral as well. So, for the first few outbreaks, Michele would signal the boat to stop so that I could get a closer look and begin to distinguish COT scarring from bleaching and disease. In some instances, the outbreaks were worse than others and could last a few hundred yards or so, indicating the presence of multiple COTS. Soon enough, I began to recognize COT outbreaks and even found a few of my own! 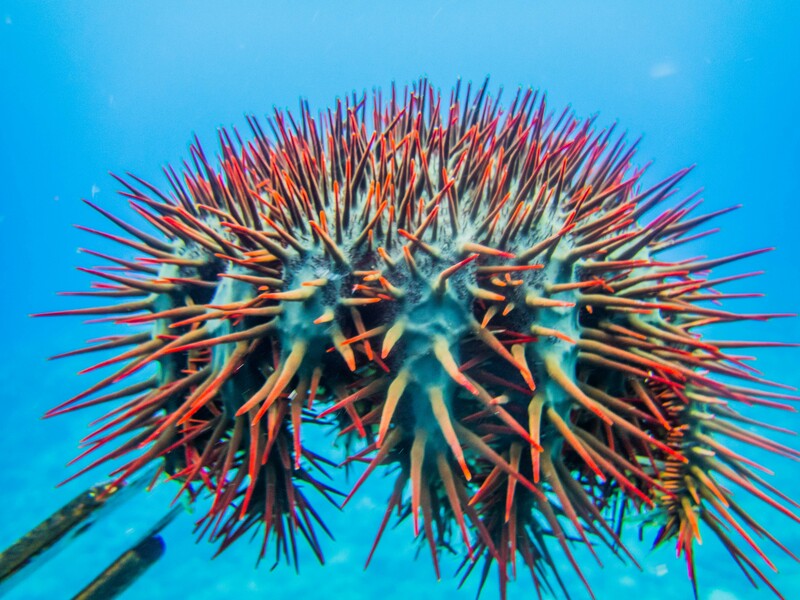 Typical scarring from a crown-of-thorns seastar. Notice the gradient from bone-white to faded yellow. When I wasn’t in the water, I was sitting on the back of the RV Poge, the park’s 28 ft Boston Whaler, and recording the data. Any time an outbreak was found, the towboarders would signal me to take a GPS point to mark the location of the outbreak while writing down both the depth and the intensity of scarring. While still keeping an eye on the towboarders, I couldn’t help but take in the spectacular views! 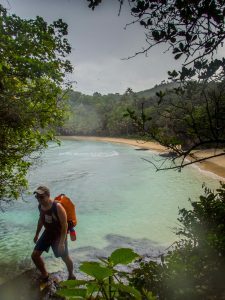 Over the course of the first week, we towboarded the entire north coast (over 30 miles! ), both in and out of the park boundaries. You might think that staring at the ocean floor while being towed behind a boat for 8 hours a day, multiple days in a row, would get old, but it was possibly the best way to be introduced to the reefs of American Samoa! Through this process I was able to get a spectacular bird’s eye view of the vibrant reef and I was absolutely blown away by what I saw. 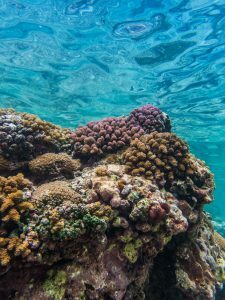 Plate corals and fuzzy tabletop corals formed intricate multi-level terraces on the steep reef slope, while boulder corals the size of minivans loomed over small pink cauliflower corals, humorously juxtaposed. 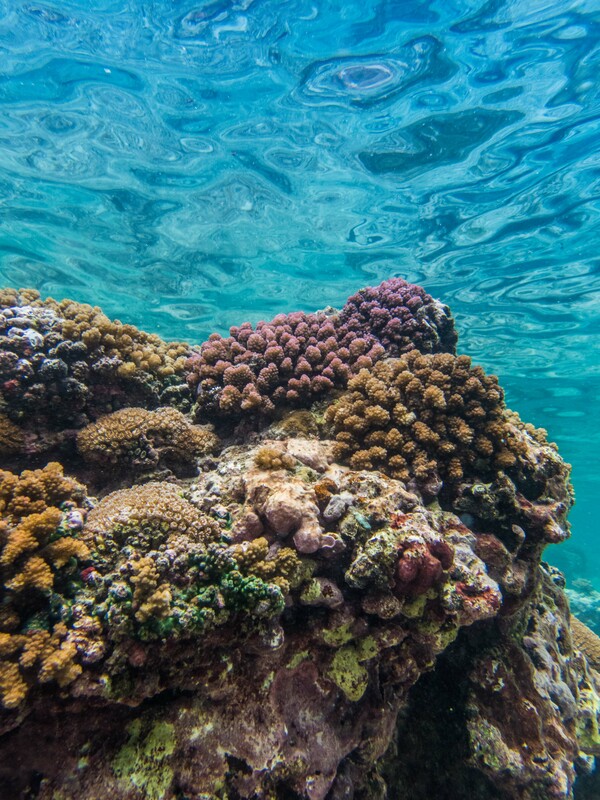 Home to over 250 species, the reef was alive with every combination of color, shape, and size of coral imaginable. 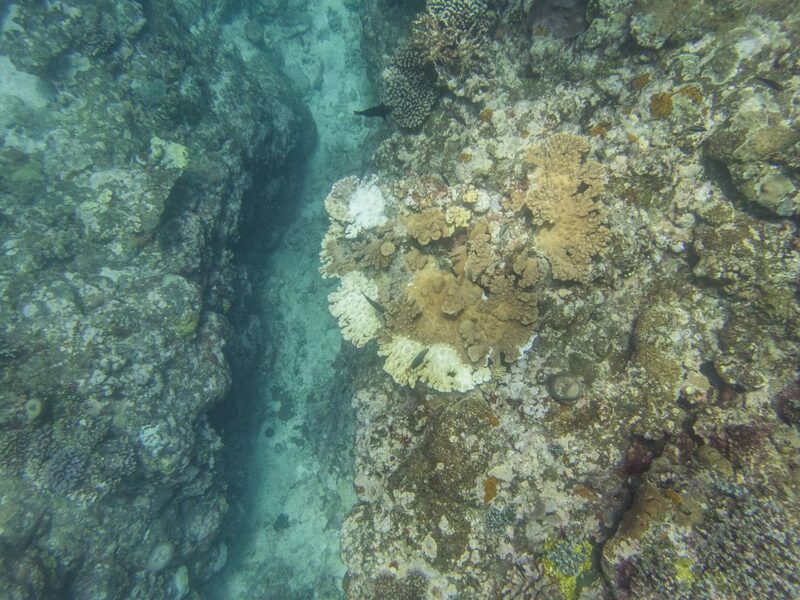 Never before in my life had I seen such massive and diverse corals! And as an added bonus, while we were towboarding I got to see some charismatic megafauna, including countless green sea turtles, a pod of dolphins, and my first-ever blacktip reef sharks! After we completed the towboarding, the next task was to take all of the data and compile it into a map so that we could visualize where the outbreaks were along the coast. After receiving a quick lesson from Paolo on how to import the data from the GPS into ArcGIS, Michele and I worked on creating a map of the towboard data. 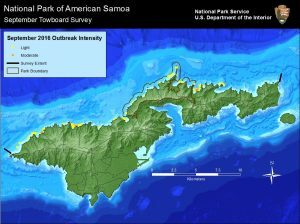 Once it was finished and we compared it to the map with previous years, it was evident that the number of outbreaks had significantly decreased. When we showed Tim, we discussed the next step and whether or not we needed to go on any eradication dives. 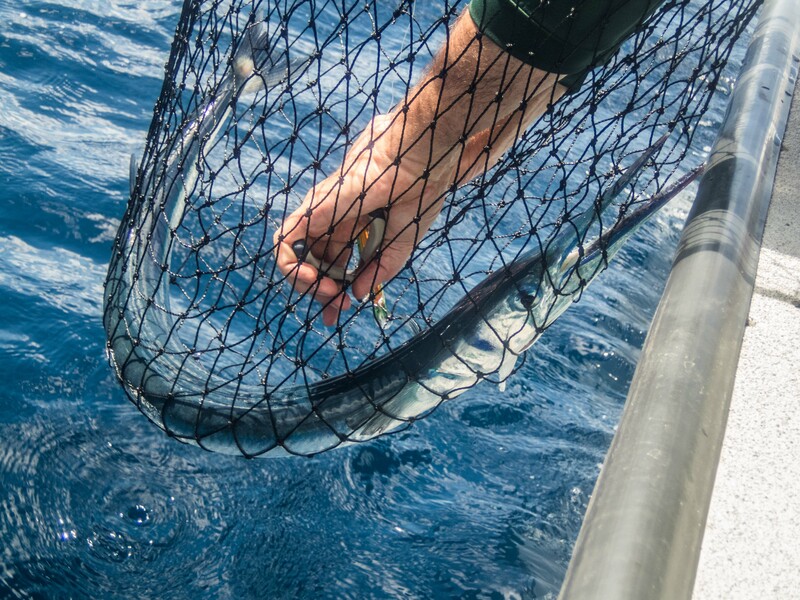 Since the goal of the program is to return the COT populations to their natural levels and not eradicate them completely, we decided to forego eradication dives for now. 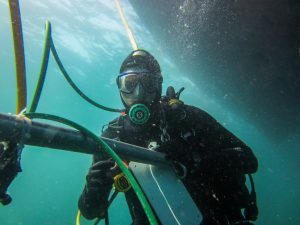 Instead, Tim suggested we go on a few GSI collection dives to take care of the one or two larger sections of outbreaks. COTS Outbreaks, 2014. Courtesy of the NPS. COTS Outbreaks, Sept 2016. Courtesy of the NPS. GSI stands for gonadosomatic index. It is a measure of gonad mass as a proportion of total body mass and is used in many different species as way to determine sexual maturity. 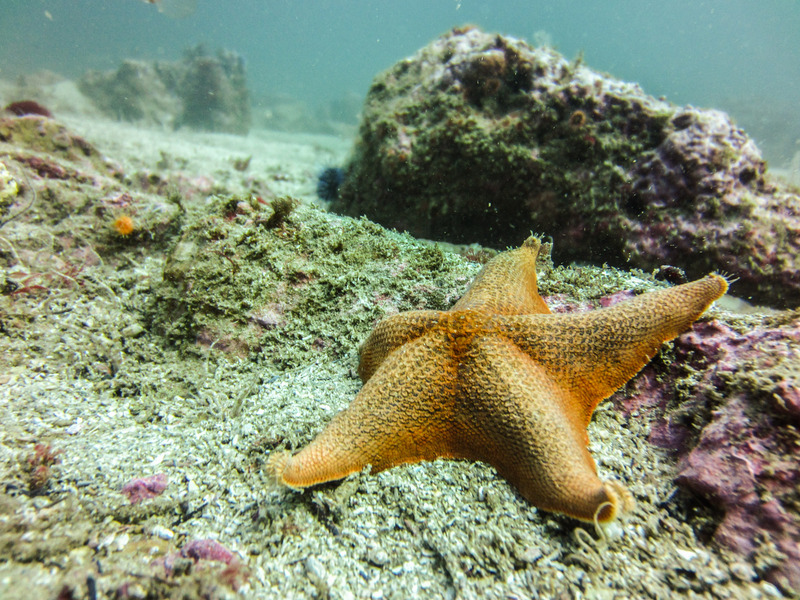 So, in addition to monitoring and controlling the COT outbreak, the NPSA marine team has begun collecting GSI data on the seastars in an effort to track their spawning cycle. But first we needed some COTS! 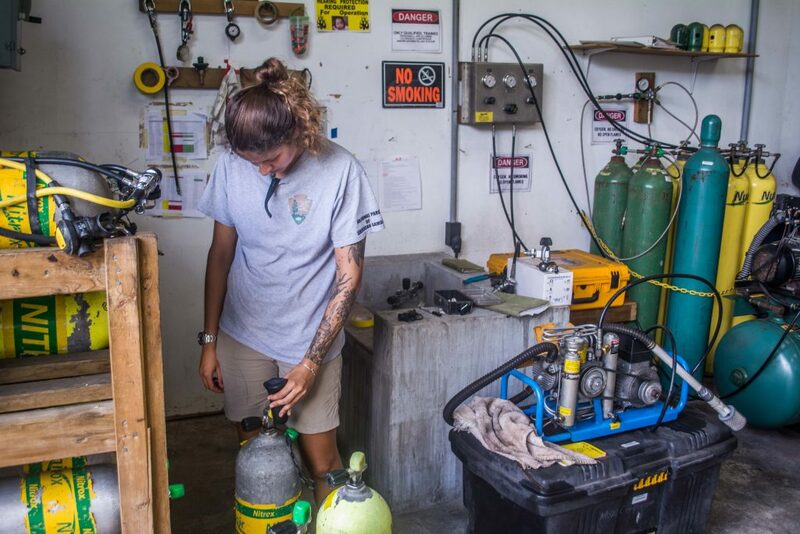 Michele checking the pO2 on our tanks before heading out into the field. With our new mission in hand, we headed into the field to collect a dozen COTS for GSI. With Ian captaining the RV Poge, we sped off to Fagamalo, an area with a concentrated outbreak. Paolo, Michele, and I excitedly assembled our rigs and geared up for the getting in the water. 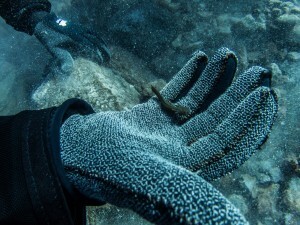 Because COTS are covered in long, poisonous spines, we wore protective gloves and wielded barbeque tongs on our dive in order to protect ourselves when removing the COTS from the reef. 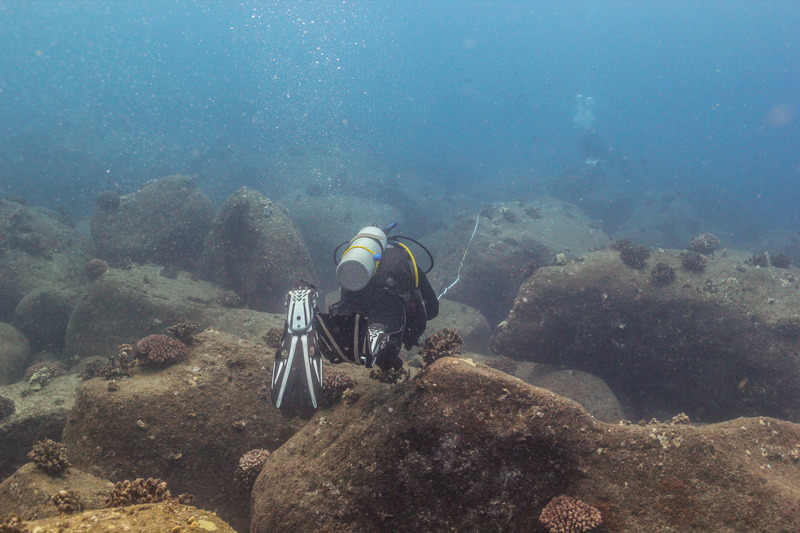 Once we splashed, we searched for a patch of reef with heavy scarring, indicating the presence of multiple COTS, and then descended, tongs at the ready. 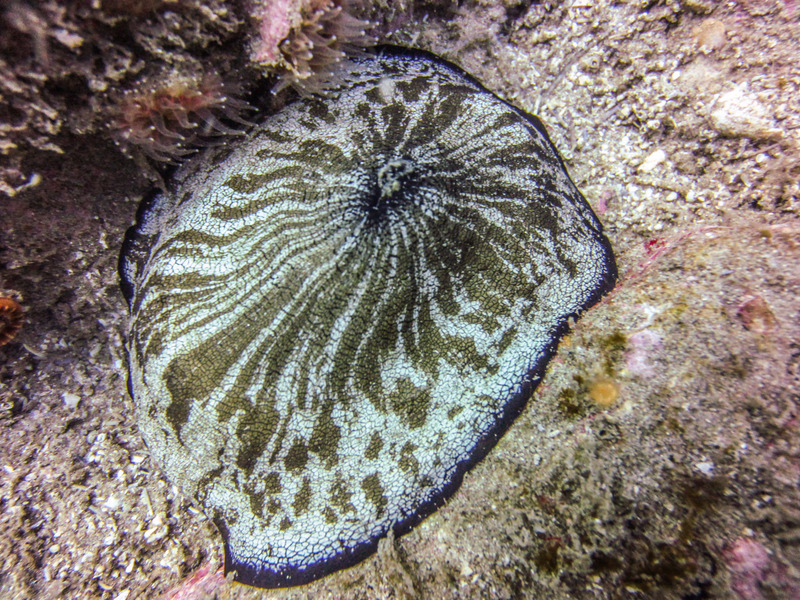 Not wanting to be vulnerable and exposed when predators are out, the nocturnal seastars tuck away in the cracks and crevices of the reef during the day. However, despite the COTS’s best efforts to hide, Paolo and Michele were pros at this and had gathered half of what we needed before I had even finished checking under my first rock. It only took a few more minutes for us to fill the collection bag with a dozen of the little buggers, two of which I collected on my own! Paolo, Michele, and I ready to dive in! Michele inspects the full collection bag on our safety stop. Making sure to keep them submerged in seawater, we brought the COTS back to the warehouse in order to take the GSI measurements. Wet weight, number of arms, and average diameter were all recorded before cutting each COT open. Then came the tedious task of sorting the red-orange tissues of the digestive glands from the paler yellow-orange tissues of the gonads using a pair of tweezers. Once the gonads were completely removed from the COT, they were weighed as well. Finally, before finishing up with a COT it was sexed by looking at the gonads under a microscope. On average, the whole process took about 40 minutes per COT, but the more fecund ones took a bit longer on account of the sheer amount of gonads needing to be separated (over 200g!). Unfortunately, during my second week, the wind and waves picked up and kept us out of the field. However, there was plenty of work to be done back on land. While, Michele and Paolo planned for an upcoming outreach event at Coast Week, Ian and I kept busy at the warehouse as a lot of things needed maintenance. The backup compressor needed fixing, the boat trailer needed new brake pads, the RV Malie’s engine needed rebuilding, etc. Together, Ian and I checked each item off one-by-one. When we got to the engine, though, there was not much I could do to help, so I sat and watched Ian take the engine apart as I spliced lines to be used for moorings. My first ever splicing job! 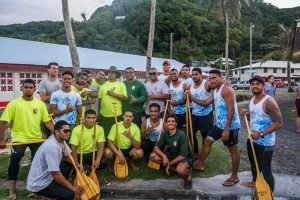 As the week rounded out, the wind and waves died down just in time for the culminating festival for American Samoa’s annual Coast Week. 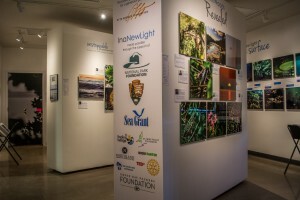 With the motto “A healthy coast is a wealthy coast”, the event is aimed at raising awareness for the natural resources the island has to offer and the environmental issues impacting those resources. 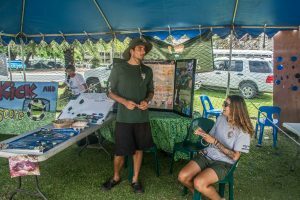 The NPS, along with other government agencies and local businesses, ran educational tables as vendors sold food, village youth groups put on traditional performances, and South Pacific Watersports hosted competitive outrigger canoe races. With so much to do, the event was bustling the entire day. It was amazing to see the community come together to support the cause and have fun while learning about the environment! Paolo and Michele running the educational NPS table at Coast Week. 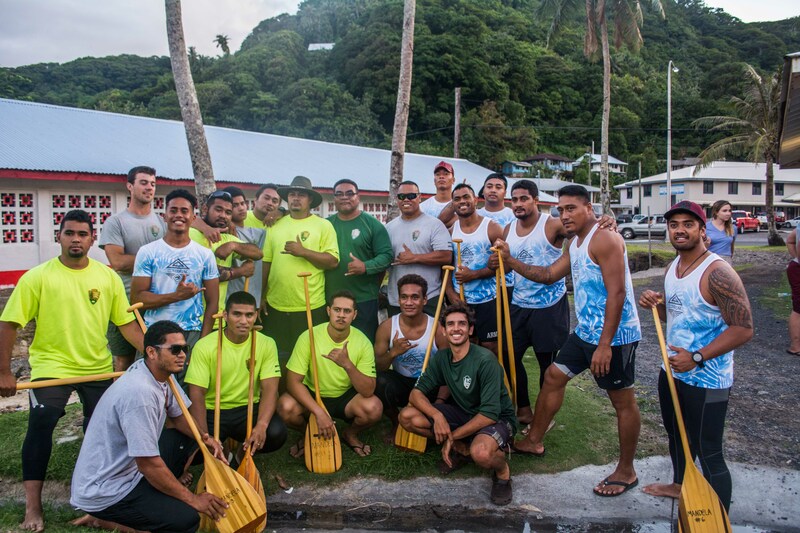 The NPS team took home the trophy at this year’s Coast Week outrigger canoe races. 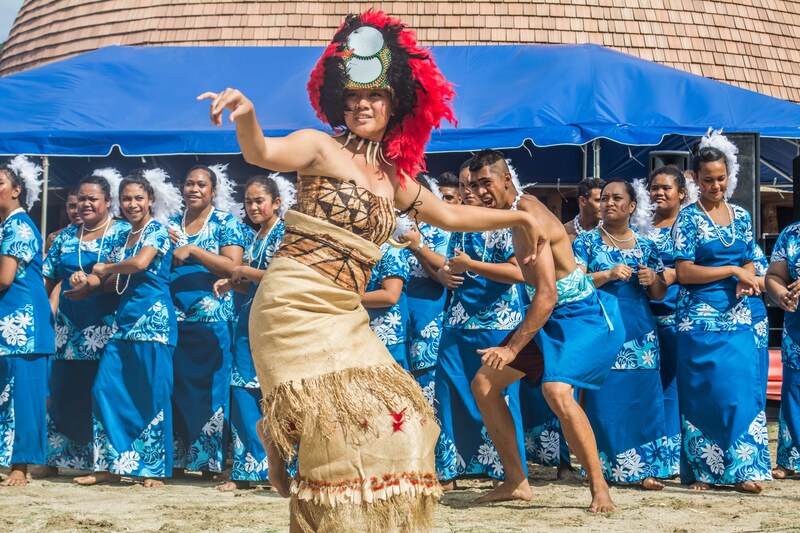 The taupou, the daughter of the village chief, performs the sacred Samoan dance, the Taualaga. The Utulei youth group performs a traditional dance with coconut shells. At work the next week, we switched gears to fish-tracking. 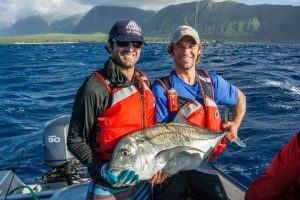 Much like the work being done in Kalaupapa, the project here at NPSA is also tracking fish with the use of acoustic tags and receivers. 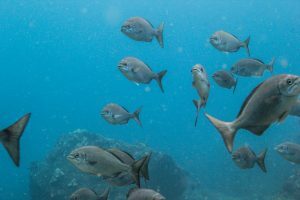 However, the NPSA marine program’s goal is to try to locate the spawning sites of large snappers and groupers that have been severely overfished, in order to inform policies to better protect them. Preliminary work in the park has been promising, so the project was beginning to pick up steam. At our Monday morning meeting, Tim set the mission for the week – expand the receiver array by installing 4 more receivers and tag more fish. In order to prepare for the next few days in the field, I checked to make sure that all of the acoustic tags were still working, inventoried the receivers, and set them up to start collecting data. With the receivers launched and ready to go and plenty of mooring lines already spliced, we were all set for installation. With a preliminary receiver array already in place, we were aiming to fill in the gaps and expand the study area with these installation dives. 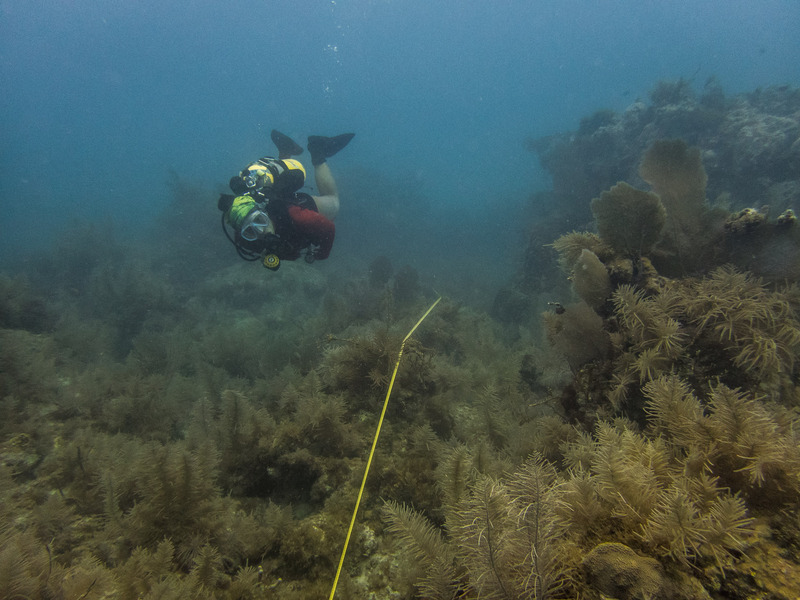 When we got to a site, Tim and Michele would drop down with a mooring line and find a large, sturdy reef structure at about 80 feet. Once they did, Paolo and I would descend, guiding down a subsurface mooring buoy. This proved to be a difficult task as you can imagine due to the float’s buoyancy, but with the help of some heavy linked chain, we managed to swim it down gently. 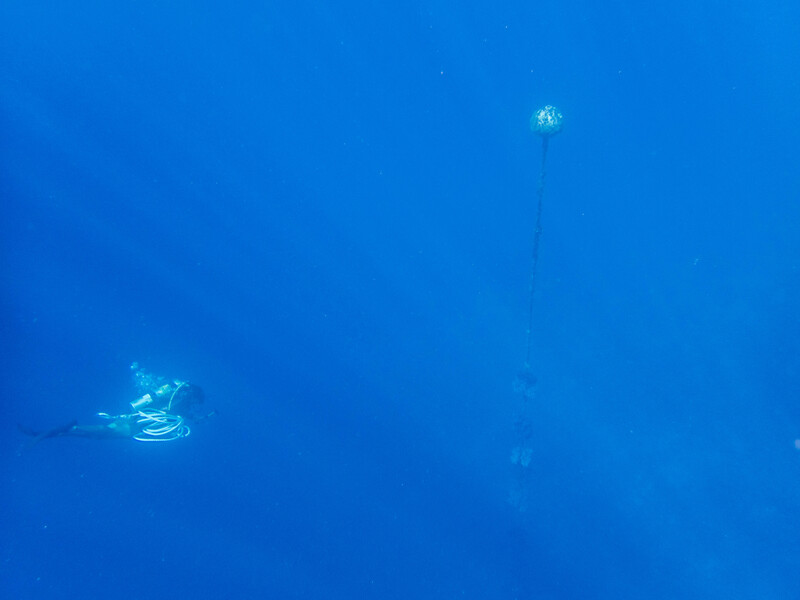 From there, we secured the line to the bottom and then to the buoy before releasing the chain, sending the buoy shooting into the water column. 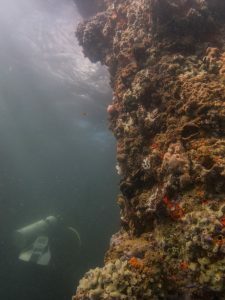 Since the study was intended to track benthic fish species, the receiver was placed at 40 feet off the reef and aimed down, hence the need for the buoy. Over the next two days, we installed 3 new moorings, replaced one that was fraying, and deployed 4 new receivers. 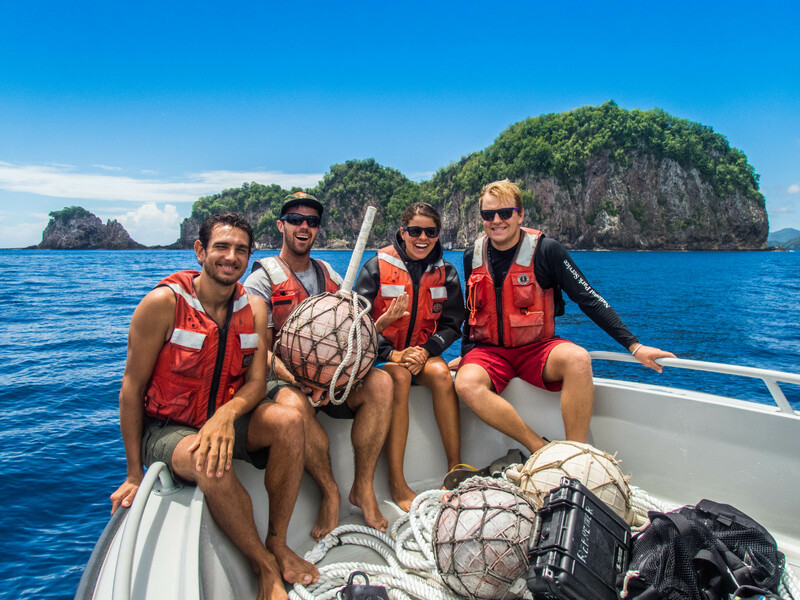 Paolo, Ian, Michele, and I pose for a picture in front of Pola Island before our receiver installation dives. Red-footed boobies fly overhead as Tim surfaces from the dive in front of Pola Island. 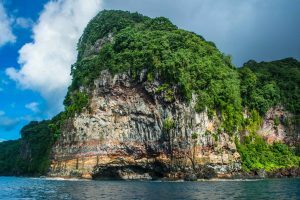 With that done, we spent the next day fishing for the groupers and snappers the study was targeting – specifically, the yellow-edged lyretail, Variola louti, and the two-spot red snapper, Lutjanus bohar. We started off in Tāfeu Cove, a protected bay in the Park where both species have been known to hang out. 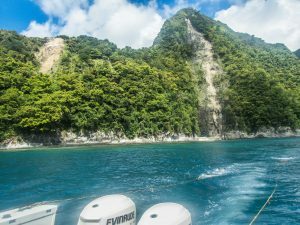 After an unsuccessful morning, with the only catch being a small untaggable parrotfish, we decided to head around to the other side of Pola Island where known feeding grounds are located. As we rounded the Pola, I got a bite. Following a bit of a fight, with an incision wound to show for it, I finally reeled in the feisty barracuda! While we ended the day empty handed, I was pretty stoked about reeling in both of the catches of the day, even if they weren’t what we were looking for. 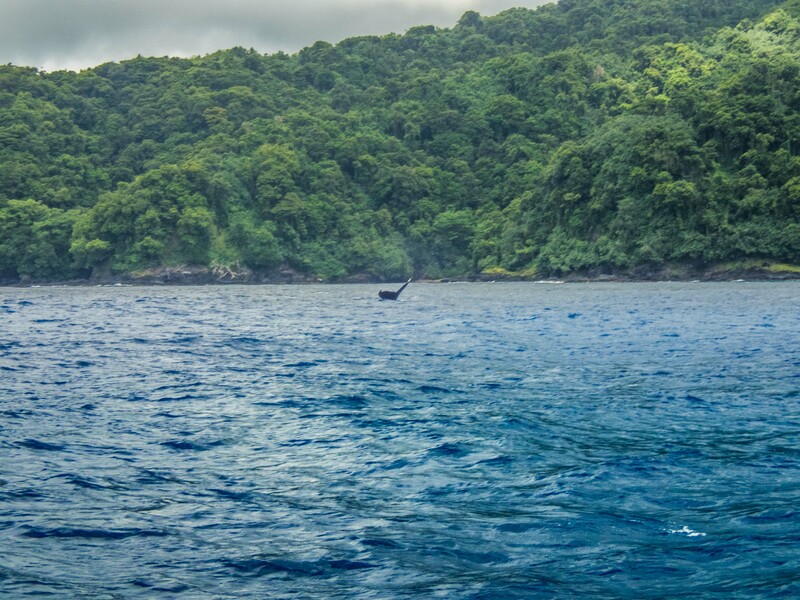 On our way back to Fagasa to take the boat out of the water, Tim noticed the classic arched back of a humpback whale. We immediately stopped the boat to watch. A few hundred yards away, what looked like two or three whales were hanging out on the surface preparing for a dive. Just after they disappeared under the surface, a humpback majestically breached out of the water and landed with a spectacular splash. Our jaws dropped. I have never seen a whale breach before in real life and it was perhaps the most regal thing I have ever seen in the wild! Unfortunately, I was not camera ready, but I did manage to get a picture of one of the whale’s flukes to prove that we did in fact see whales. The fluke of a humpback whale emerges as it dives down into the ocean. On the weekends, when we weren’t working, Ian, Paolo, and Michele took care to show me a good time around the island. 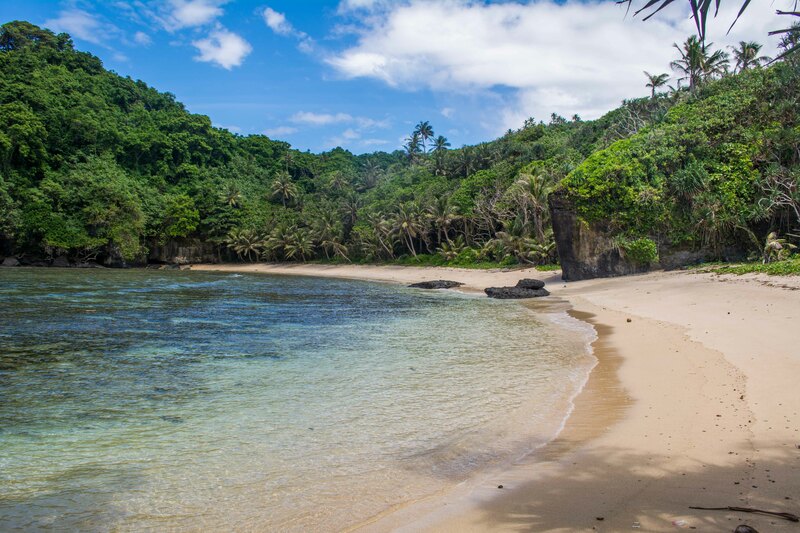 One weekend, we hung out on the secluded Larsen’s beach. 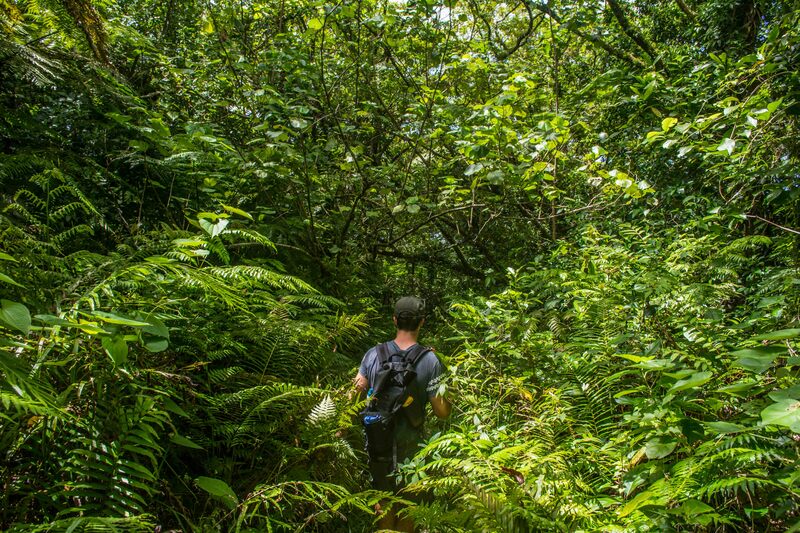 The next weekend, we went on a hike through the rainforest in order to get to Massacre Bay, the site of a massacre that occurred when the French explorer LaPerouse landed there in 1787. Another time, we even got to take Ian’s sailboat out for a spin. Every weekend was a new adventure! I could tell you more, but I think the pictures speak for themselves. The hike down to Massacre Bay. 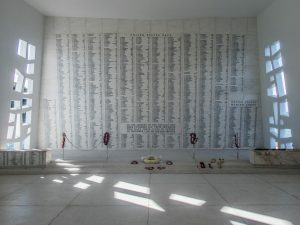 The memorial at Massacre Bay. 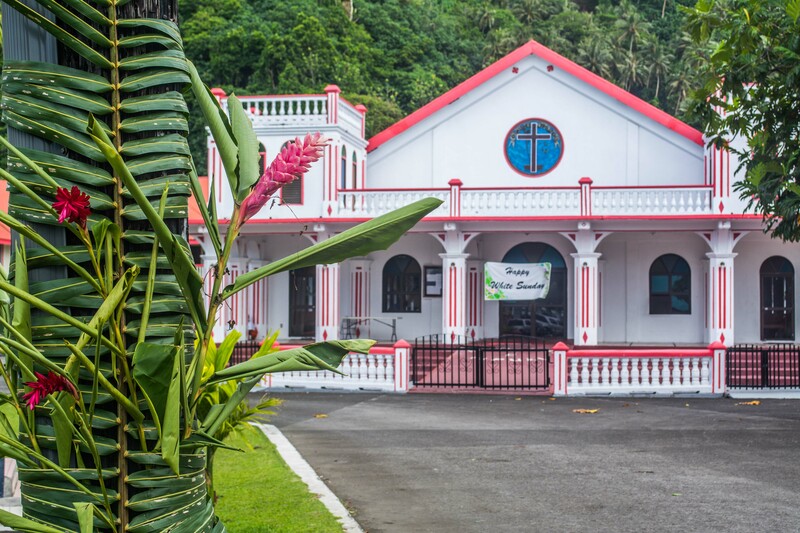 On my final weekend in American Samoa, I was excited to get to experience the traditional cultural holiday known as White Sunday. 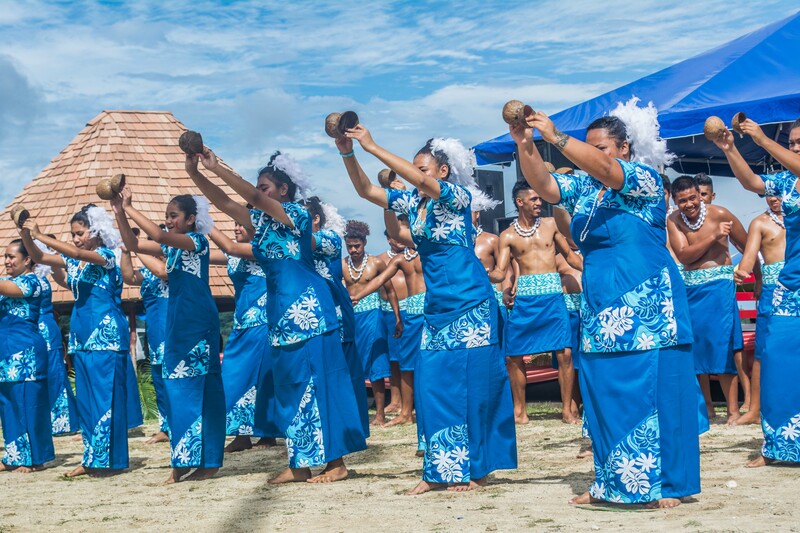 Over the course of my month stay I have come to learn that, like many other Polynesian cultures, the Samoan people have at their core faith, family, and music. 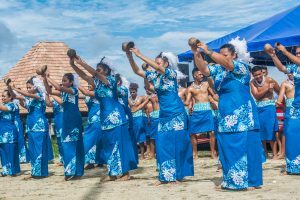 These traditional values are evident in many aspects of their life – from the period of daily afternoon prayer, called sa, to every Sunday being dedicated to spending time with the family, going to church, and preparing the traditional ground oven or umu. However, this Sunday was special. 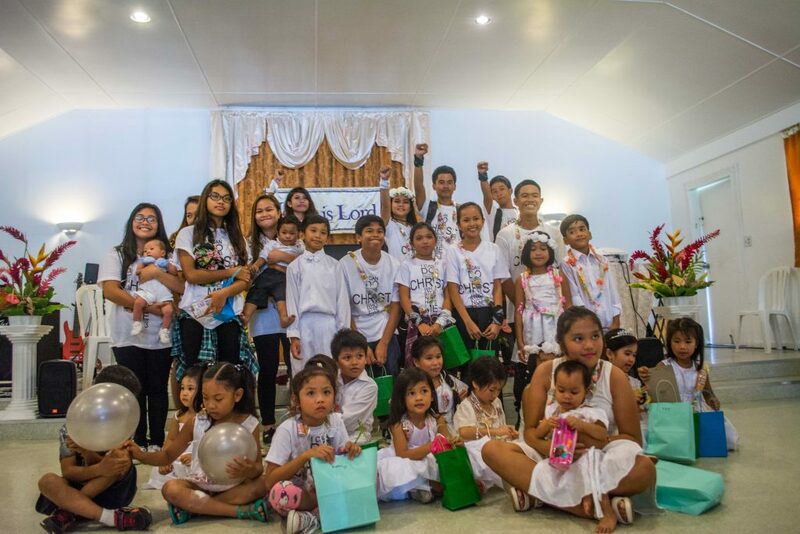 Akin to a Mother’s Day or a Father’s Day, White Sunday is a day dedicated to honoring children. As the name implies, all the kids wear white and some even get special outfits sewn for the occasion. The children posing after putting on a beautiful White Sunday celebration. 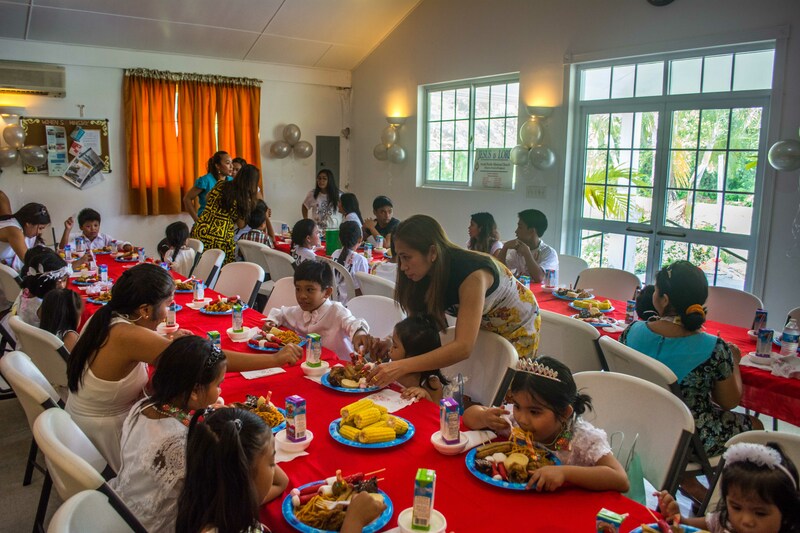 A potluck was served after mass for the children. A Church prepared for White Sunday. I accompanied Nerelle and Ian to church that day and had an amazing time. I was immediately welcomed by the close-knit congregation and invited to celebrate the holiday with them. 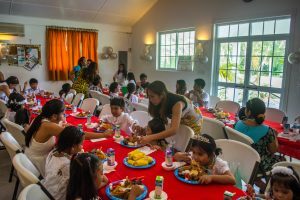 In true White Sunday fashion, the celebration was led by the children and featured all kinds of performances put on by the kids. It was a delightful way to end my last weekend in American Samoa! Find your Park. I know I did. I would like to extend the sincerest of thank you’s to everyone who made my month in American Samoa so fun and memorable! Tim for providing the opportunity to come work for your beautiful park and for inviting me to join the marine team. Paolo, Michele, Ian and Nerelle for welcoming me with open arms and sharing with me your adventures and your homes. Adam, Shivaun, Alan, Sabrina, and Bob for the talks on the beach and the hikes through the rainforest. 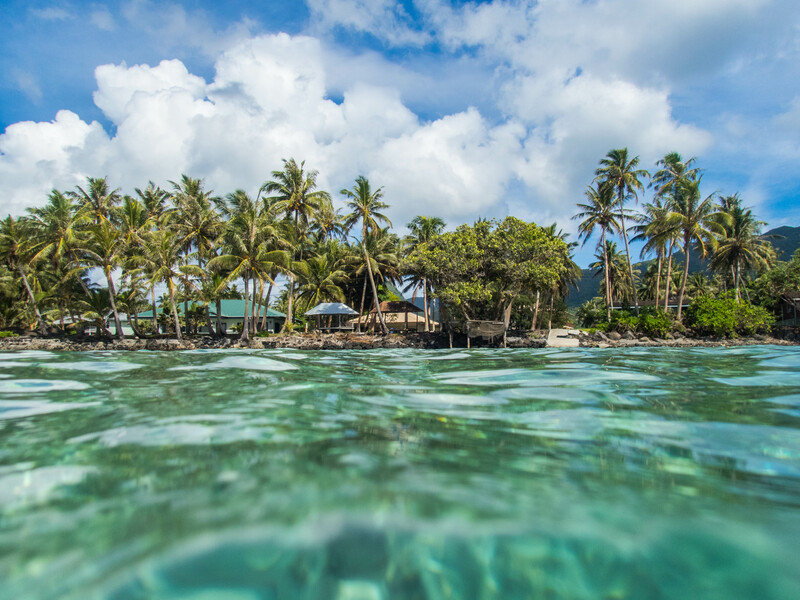 And last, but not least, Alex for sharing with me your friendship and showing me your take on American Samoa. You all made this experience something I won’t ever forget. This entry was posted in 2016 National Park Service, Current Internships on November 5, 2016 by Garrett Fundakowski. 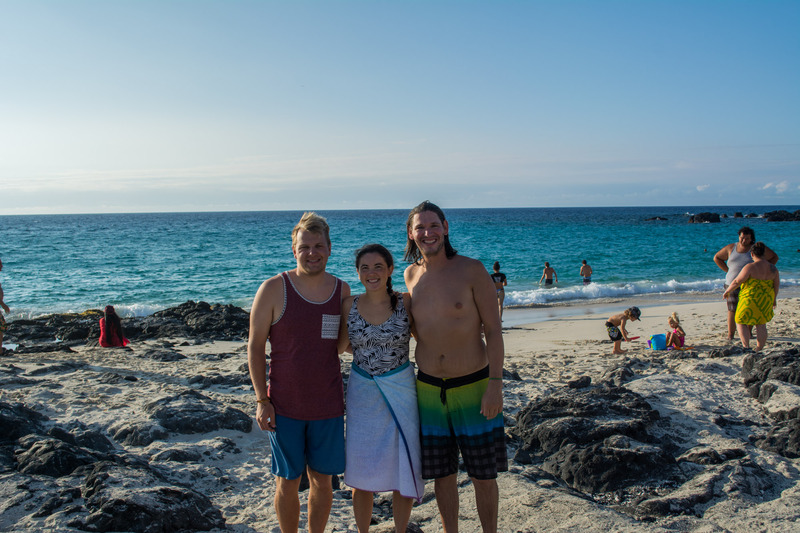 On my way to Kalaupapa, I made a pit stop in Kona on the Big Island of Hawai’i to visit my cousin, David, and his wife, Katie. 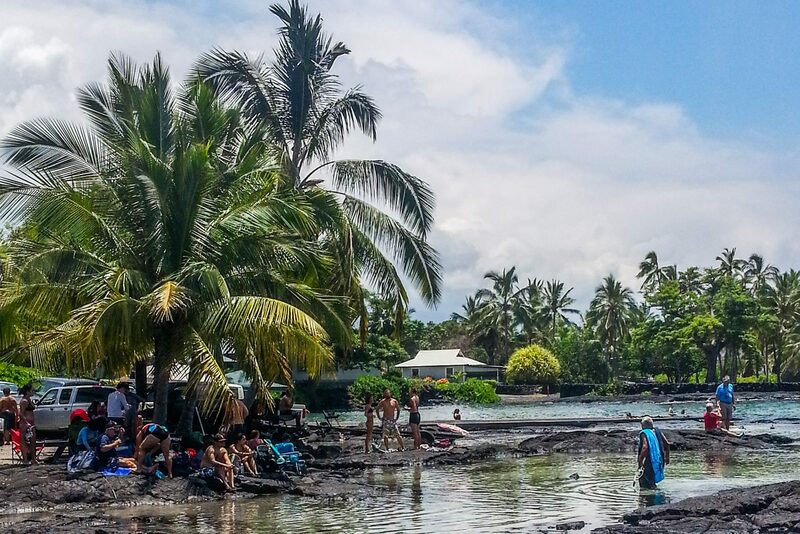 Though my stay was brief, I very much enjoyed a relaxing afternoon at the beach and a morning swim at popular snorkel site Honaunau Bay (aka Two-Step) with my family. Thanks guys for welcoming me to Hawai’i and taking me in for a night! 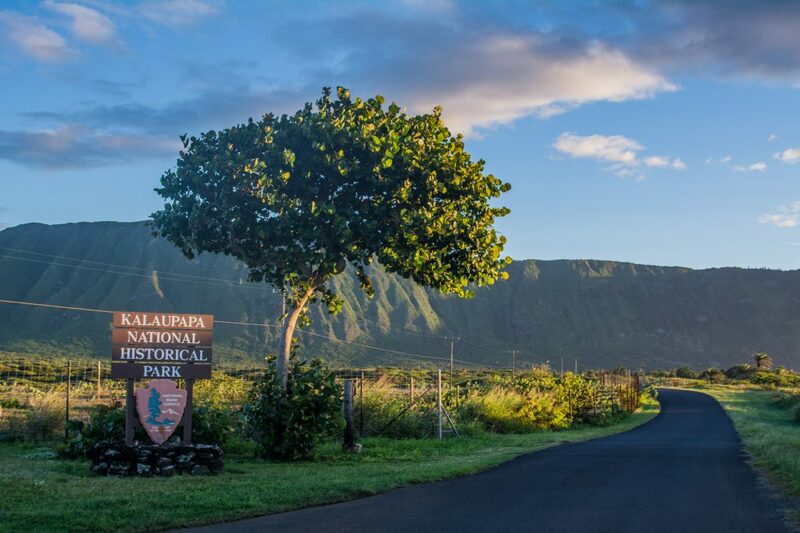 But after spending just over 24 hours in Kona it was time to make moves towards Kalaupapa National Historical Park. The 8-passenger, propeller plane left from Oahu just before sunrise. With just a half hour flight, we left behind the hustle and bustle of early morning Honolulu and entered a completely different realm. 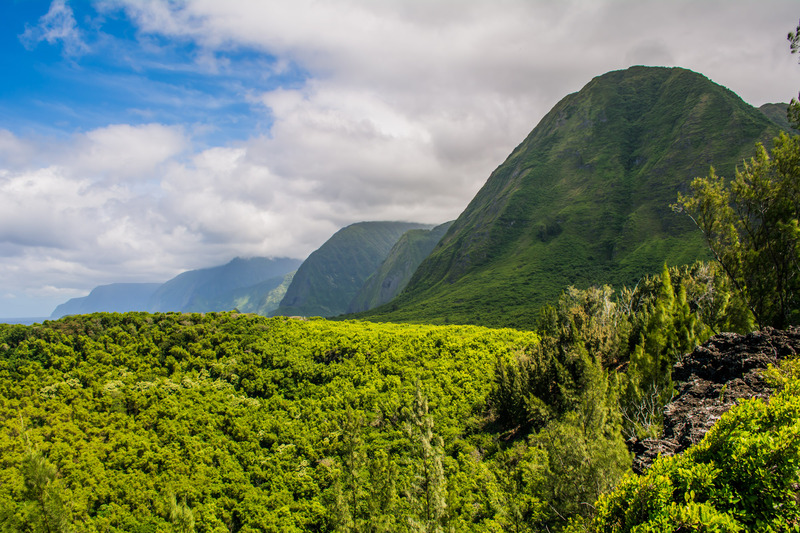 The park is located on the remote Kalaupapa Peninsula on the north side of the Hawaiian island of Moloka’i. Sea cliffs, the tallest in the world at over 3,000 feet, and the surrounding ocean isolate the peninsula from the rest of the island, a fact that played an important role in its history. 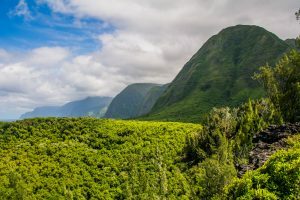 Today, visitors to the park, like myself, must either walk down a trail along the cliff face from topside Moloka’i or fly in directly on a small, chartered plane operated by Makani Kai Airlines. 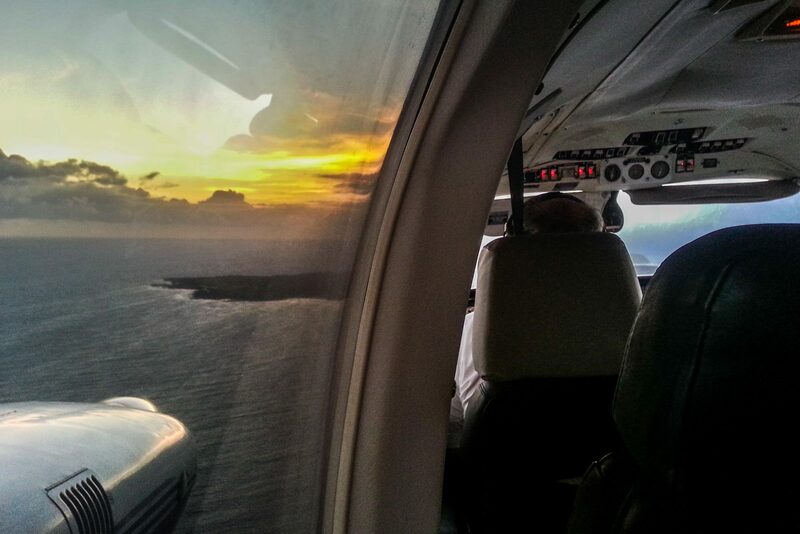 As the sun rises, Kalaupapa emerges into view on the horizon aboard the Makani Kai flight. 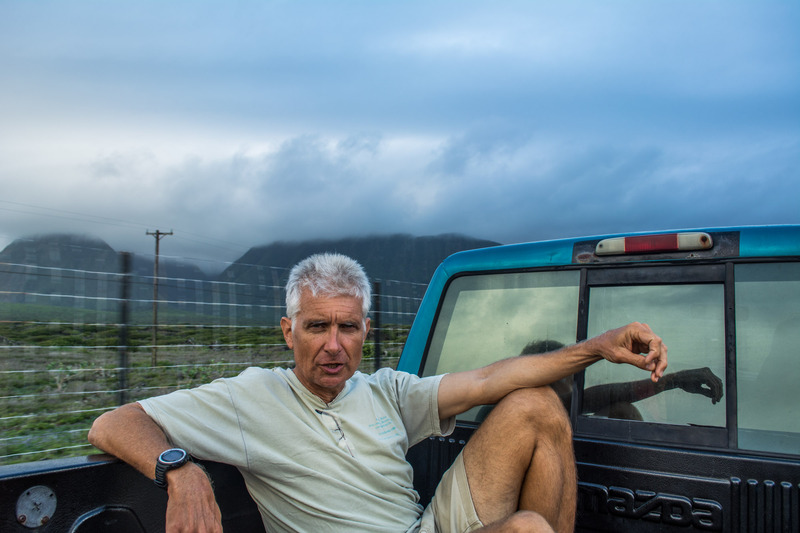 At the airstrip, I was greeted with an aloha by Marine Ecologist and Park Dive Officer, Eric Brown. After showing me to the historic Nurse’s quarters, my home for the next two weeks, Eric took me on a quick tour of the park, educating me on the extraordinary history of the peninsula. In the mid-1800’s, Hansen’s disease, more commonly known as leprosy, began to sweep its way across the Hawaiian Islands. With no known cure and little knowledge of the disease itself, King Kamehameha V became fearful of the consequences of such an epidemic and exiled those afflicted with the disease to the Kalaupapa peninsula in 1865. 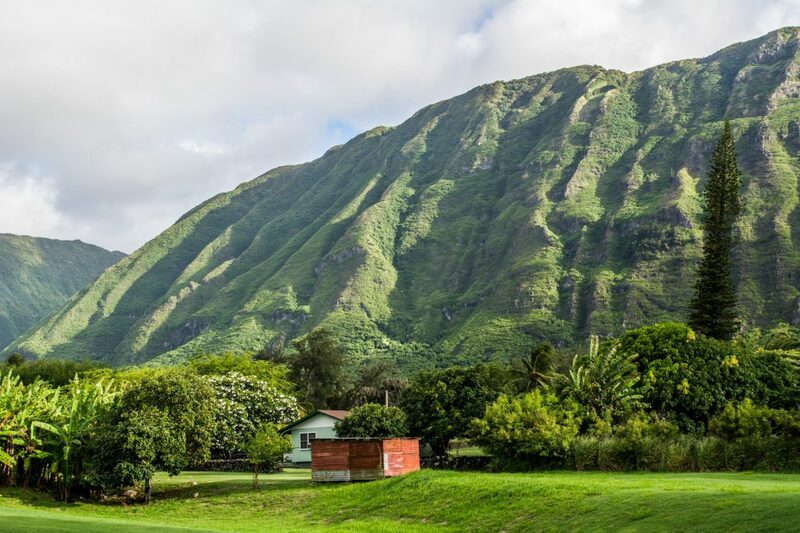 Over the next hundred years, more than 8,000 patients with Hansen’s disease were torn away from their families and forcibly quarantined in the settlement on Kalaupapa under the Segregation Act. Early patients suffered not only from disease and the sorrow of separation, but also from food shortages, inadequate shelter, and a complete lack of medical care. 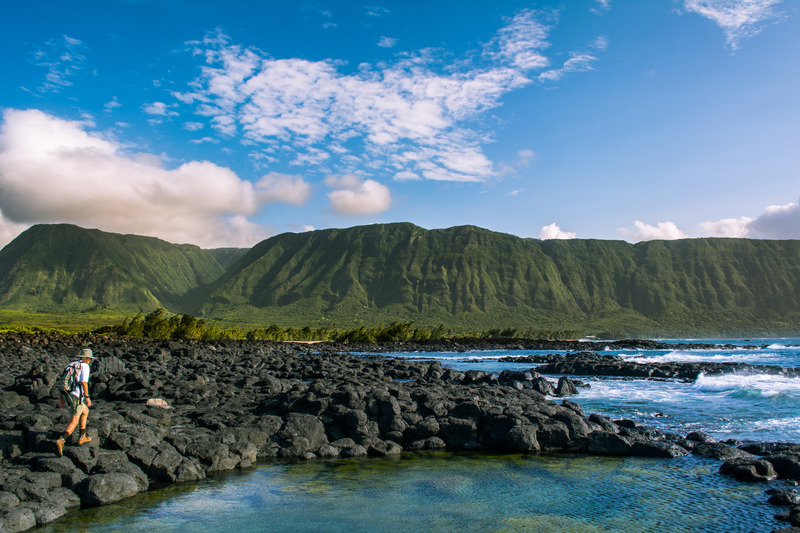 Eventually, the generosity, charity, and effort of individuals, like Father Damien and Mother Marianne, brought major improvements to the lives of the patients. 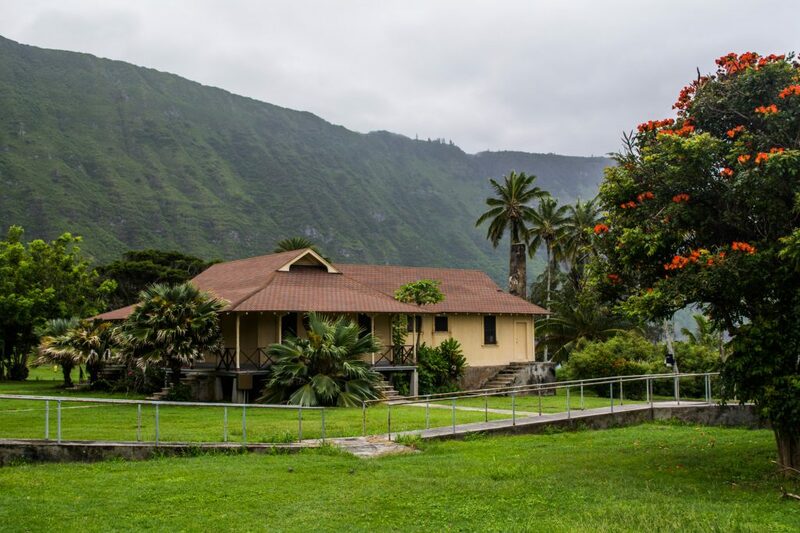 In the late 1940’s, the discovery of sulfone drugs brought about a cure for Hansen’s disease and the number of patients at Kalaupapa began to decrease as a result of the treatment. Finally, in 1969, the century-old Segregation Act was officially abolished. Today, about a dozen cured patients have chosen to remain in the settlement and are allowed to come and go as they please. Here, they are continually cared for by staff from the Hawai’i Department of Health and members of their families. 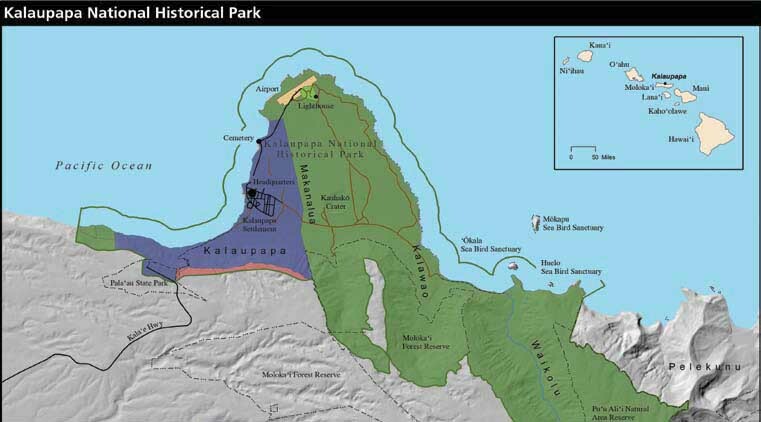 With a mission to preserve this solemn narrative for future generations, as well as protect the plethora of cultural and natural resources on the peninsula, Kalaupapa was established as a National Historical Park in 1980 and nowadays Park Service staff rounds out the population in the settlement at just under 100 people. As Eric’s tour progressed it became increasingly evident that the community here at Kalaupapa is extremely close-knit. Having been on the peninsula for less than an hour, Eric had already introduced me to about twenty residents! If this was any indication of how the next two weeks were going to go, I was excited to become a part of the Kalaupapa community! 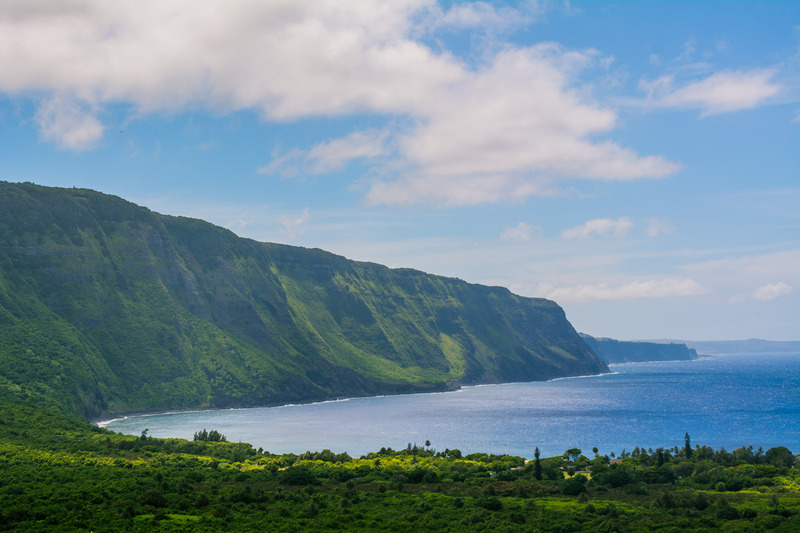 A resident’s home sits in front of a backdrop of Kalaupapa’s infamous sea cliffs. 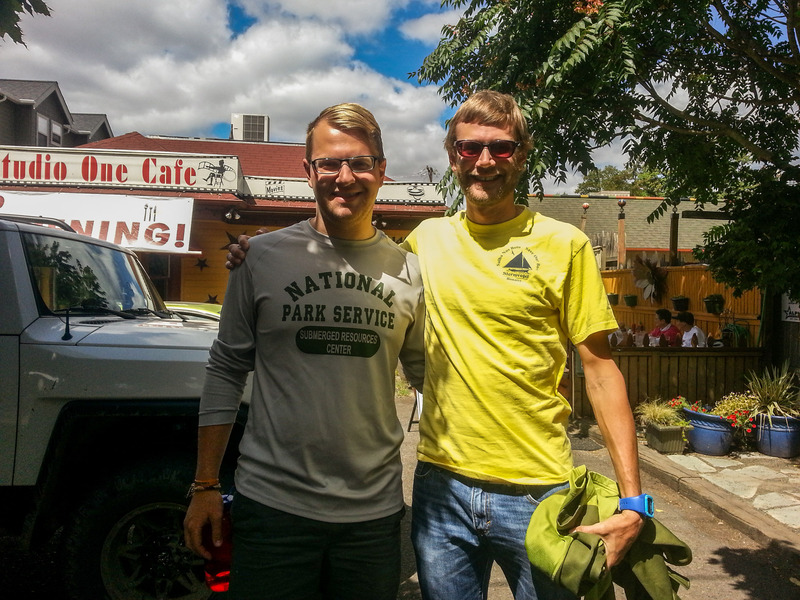 Eric and I ended our tour at the Natural Resource Management Office just in time for the workday to begin. Here I was introduced to the rest of the Marine team – Maintenance Mechanic, Randall Watanuki, and Biological Science Technician, Sinefa Annandale. Together, we had a meeting to discuss the plans for my time here at Kalaupapa. This was my longest stay in a park to date and I was excited to get to experience multiple weeks of park operations at a single park. The first week of my visit, we would be finishing up the benthic marine monitoring surveys the team had started the previous week. And for the second week, visiting researchers from the University of Hawai’i were coming for a shark-tagging project! But first, there was one last freshwater site to be completed for annual water quality monitoring. Without knowing quite what to expect, I hopped in the truck with Eric and Sinefa and we drove off to the eastern side of the peninsula. 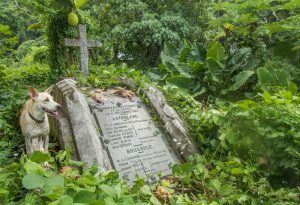 At a certain point the paved road of the settlement gave way to faint tire-tracks running through a meadow and leading up to the edge of a tropical rainforest. 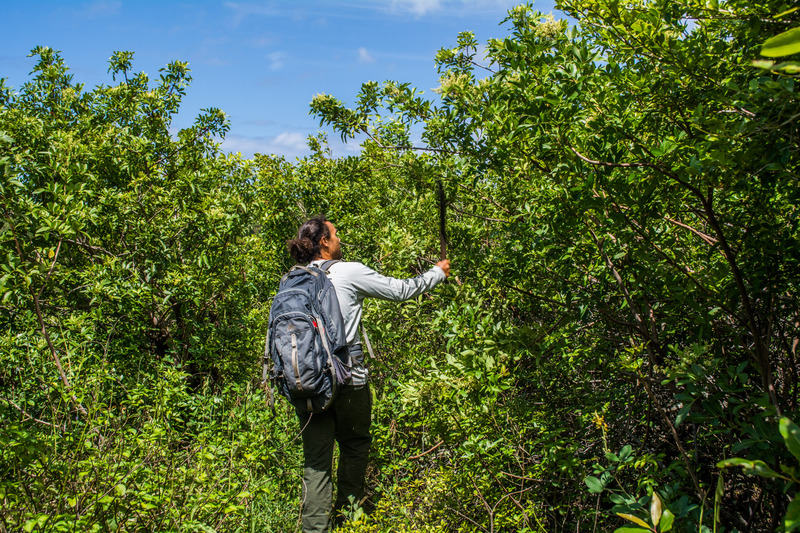 Machete in hand, Sinefa led the way into the dense growth. I followed behind Sinefa as he hacked away at sinewy vines and low tree branches. 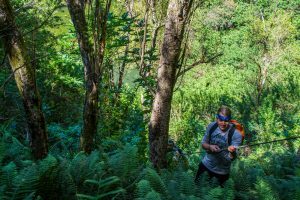 By far the coolest hike I’ve ever done, we trekked through the underbrush, blazing our own trail, and descended down 1,000 feet into Kauhako crater toward the freshwater lake sitting at the bottom. 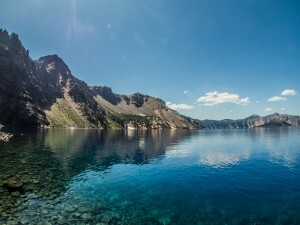 Though barely 300 feet across, the lake bottoms out at over 800 feet deep, making it, according to Eric, the deepest lake in the world for its surface area. As I collected and filtered water samples for lab analysis, Sinefa tested the water quality with a Sonde. The whole process only took 10 minutes and then we made our way back up the caldera walls, having to make use of ropes for the steeper parts of the ascent. View from the start of our hike down into the Kauhako Crater. Sinefa hacks at the shrubbery clearing a path. Sinefa operates the sonde while I filter water samples from the lake. 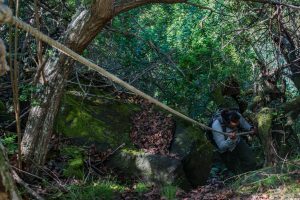 We used ropes for the steeper parts of the ascent. Back at the office, Eric decided to make use of the last hour or so of the workday by performing my checkout dive. While it can get repetitive to prove my skills to each new park, it is crucial that these checkout dives be performed so that the park divers are aware of my composure and comfort-level underwater and I am aware of theirs. After going over the basic mask clearing and buddy-breathing skills, we had time for a quick lap around the dock. 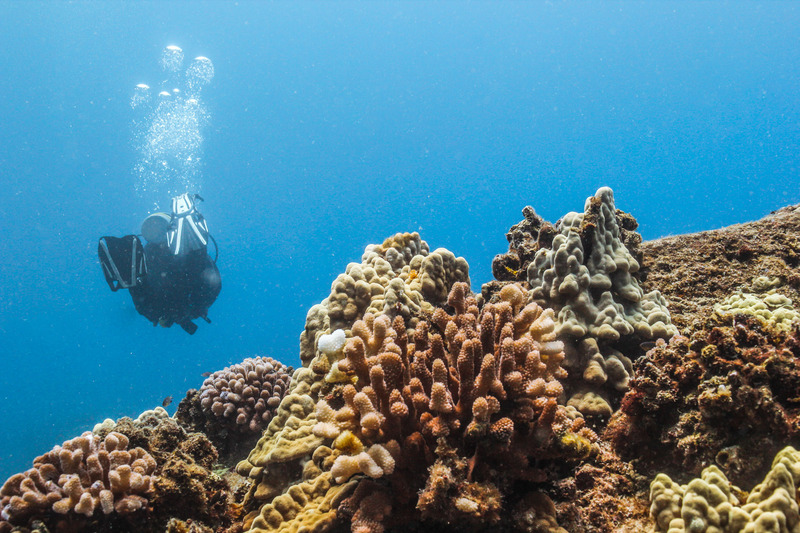 Beautiful corals speckle the volcanic rocks of Kalaupapa’s reef. 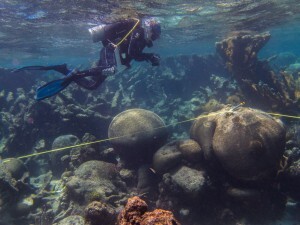 Kalaupapa’s underwater resources are vastly different from those I have seen so far on my trip. 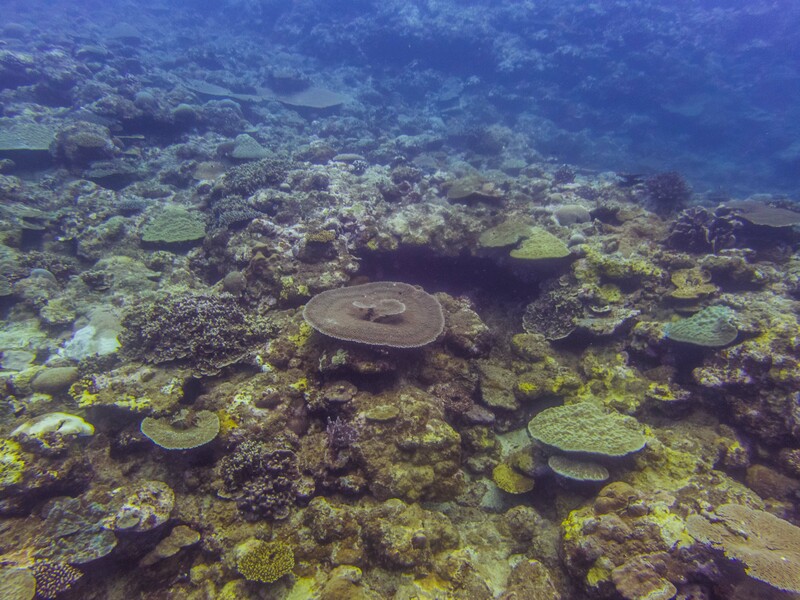 Large volcanic boulders scattered the reef slope, each with one or two individual coral heads growing on top. 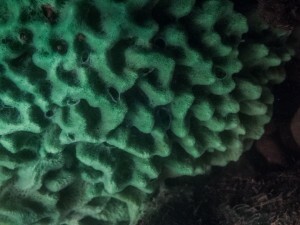 Compared to other reef communities I’ve seen where encrusting corals, sponges, or algae will fill in any and all exposed substrate on a reef, there appeared to be a considerable amount of open space just waiting to be occupied. 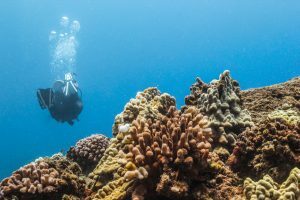 However, while Kalaupapa’s percent coral cover and coral species diversity seemed relatively low, the community of fish that call these reefs home was vibrant and flourishing. 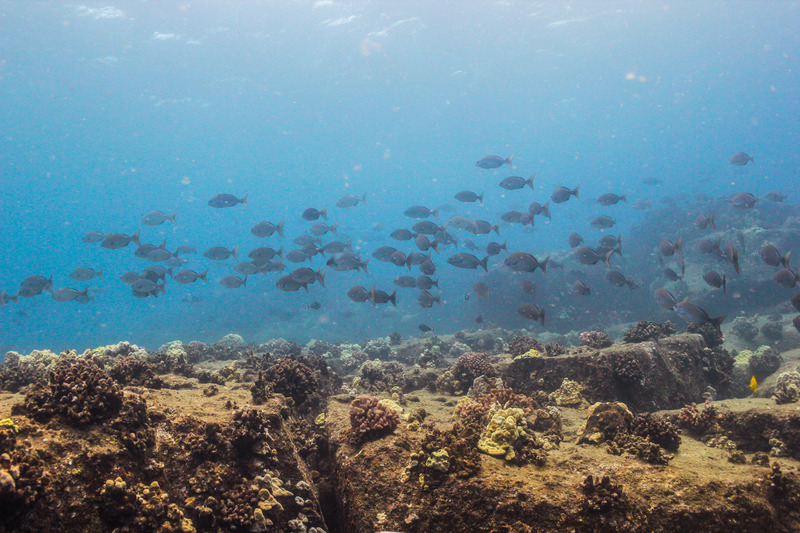 Everywhere I looked – in the coral heads, under the rocks, up in the water column – I saw hundreds of fish. Huge schools of surgeonfish, unicornfish, and chubs swam alongside us, only to panic and swim away as a large barracuda came into view. 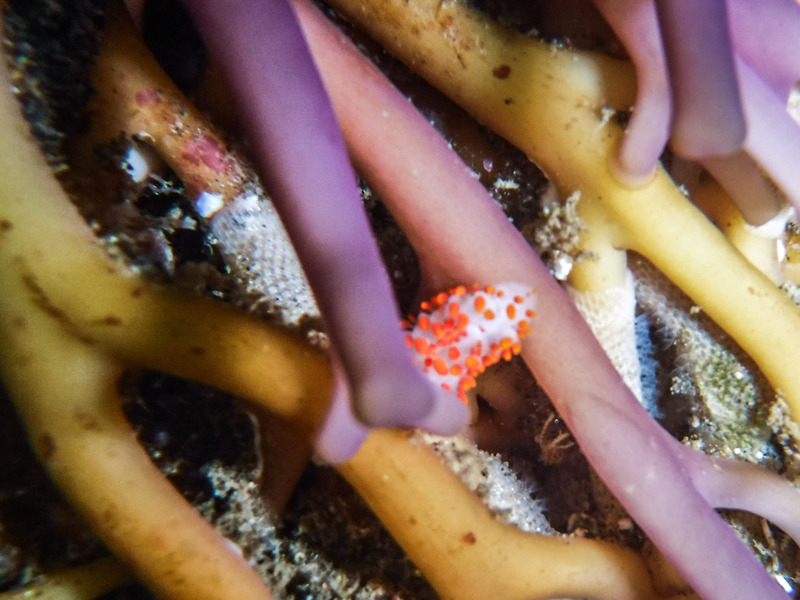 Eric swims over a collection of vibrant corals. 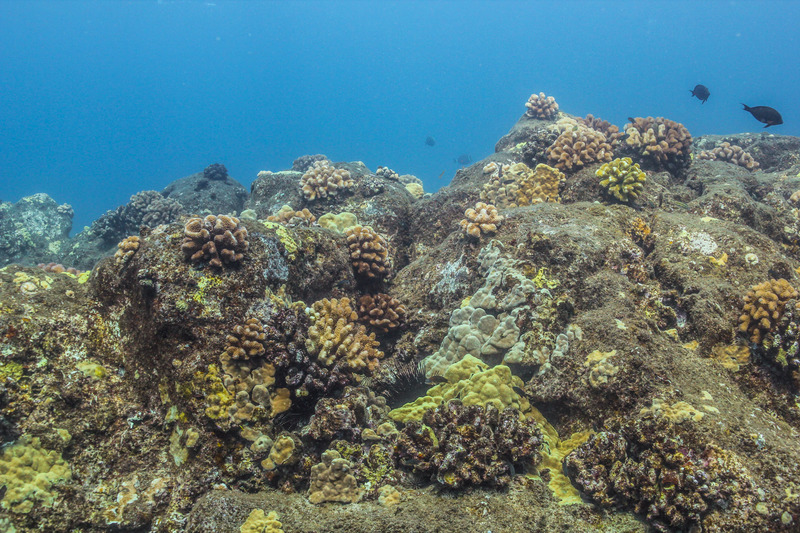 Corals speckle the large volcanic boulders of the reef. A school of chubs swims alongside of us. The chubs panic and split as a barracuda looms nearby. Over the course of the next two days, Eric, Randall, Sinefa, and I went out on the boat and completed the last remaining sites for the benthic marine monitoring program. Every year, the Marine team visits a total of 30 sites around the peninsula and gathers data on coral cover, rugosity, and fish species. 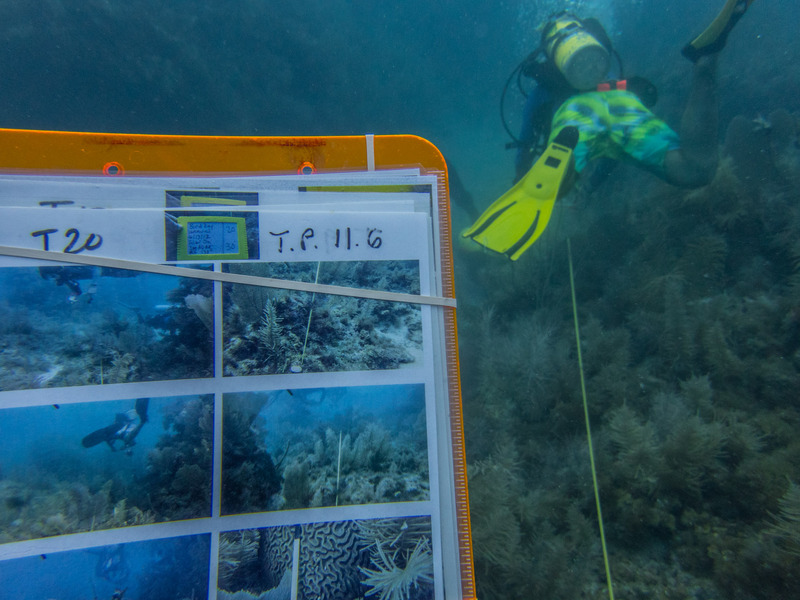 On each dive, Eric would lay down the 25m transect tape and perform a fish count, while Sinefa or Randall (whoever wasn’t on the boat) would follow behind and take photographs of the substrate at every meter, which be analyzed later for percent cover data. Finally, Eric and I would round up the dive, teaming up to take a rugosity measurement. Randall swims the transect tape taking photographs of the substrate. Eric can be seen in the distance doing his fish count. Note the vast amount of bare substrate. However, the work week was cut short due to incoming storms Hurricane Lester and Hurrican Madeline. 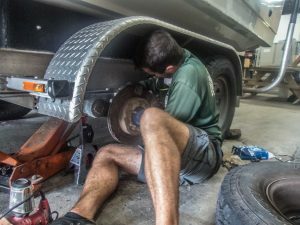 On Thursday, the park service and the state employees had the day off in order to prepare for the storms. In the morning, everyone gathered at the town hall to hear from the Emergency Preparedness team about what to expect for the weekend. 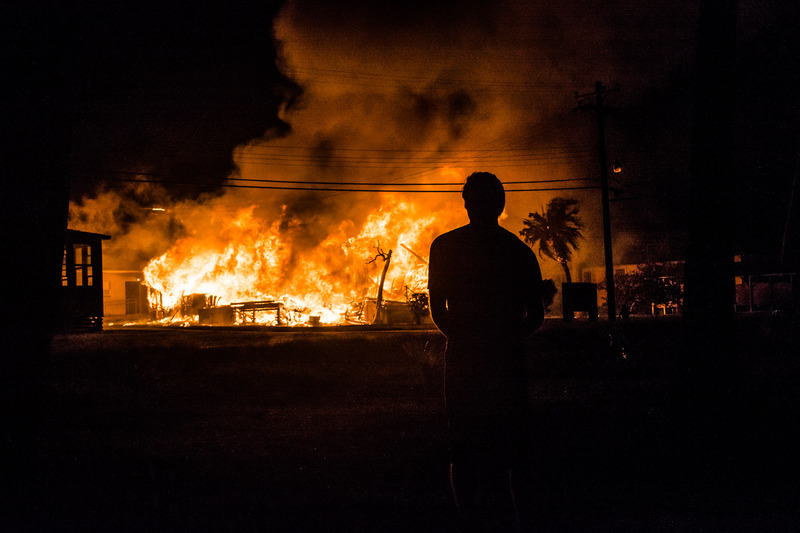 With Lester set on a B-line for the entire Hawaiian archipelago and winds estimated to be over 100mph when it reached Moloka’i, the settlement went into lockdown mode. The trail to topside Moloka’i was closed, in addition to all flights out being suspended for the next few days. Additionally, a storm shelter was being set up in the town hall for those who experienced any damage or power outage during the storms and needed food or shelter. With this in mind, Eric and I spent the day batting down the hatches at the office. 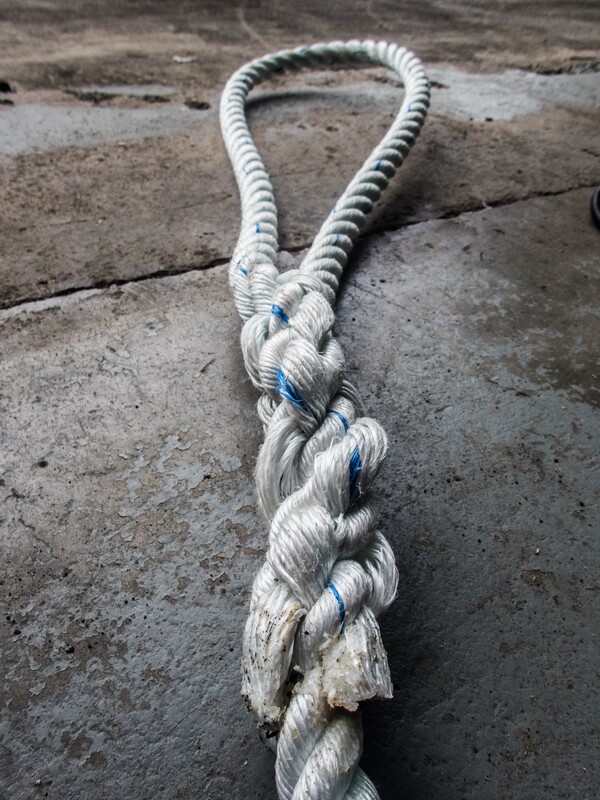 We also moved the boat to a more secure mooring offshore and added extra lines for security. We debated moving the boat to the harbor on the other side of the island, but with the trail closed, Eric decided to play it by ear and make the decision as the storm got closer and its path became clearer. Overnight, Madeline had stirred up the wind and dumped some heavy rains, the only damage being a small landslide and downed tree on the trail. The good news was that the Friday morning weather update showed Lester taking a more northerly route. While we were longer in the direct path, Moloka’i was placed under a Hurricane watch for high winds and rains throughout the weekend. So in anticipation of being locked up in our houses for the next two days, Tim Richmond, the Food Services Supervisor for the settlement, invited a bunch of people over for a potluck movie night. We watched Young Frankenstein as we indulged on a delicious dinner of spaghetti and Eric’s vegan meatballs. All in all, it was a fun bonding activity that made me really feel like a part of the Kalaupapa family. Hurricane Lester veers away from the archipelago. The weekend passed by extremely uneventfully. For all of the hectic preparations, not a drop of rain or the slightest breeze made an appearance on Saturday or Sunday. So on Sunday, the trail opened back up and activity resumed in the settlement. That Monday, Labor Day, was relatively quite in the settlement. 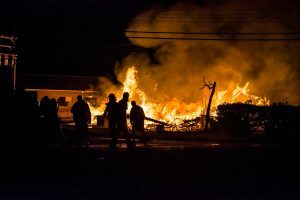 I was used to pool parties, fireworks, and BBQs, which is why I didn’t initially question the bonfire-esque smell coming into my room at 1:30 in the morning. But at 2:00, I rolled over and immediately knew I was in trouble. The building, not 20 yards out my window was on fire. Screaming came from the adjacent rooms and it was evident Kylie, Jake, and Susan had awoken to the blaze out their window as well. Kylie ran to sound the settlement alarm as Jake radioed it in to the park Emergency Services. Together, we all ran from our building into the street. 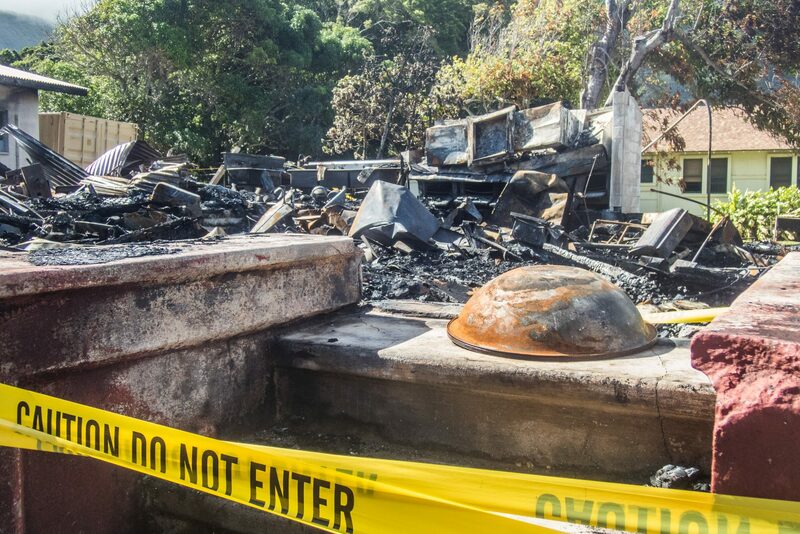 All we could do was watch as the kitchen burned. Soon everyone from the community was outside watching with us as others from the community fought the fire from two fronts. By the time we had noticed the fire, it was too late to save the state dining hall and the majority of the effort was spent controlling the fire and preventing it from spreading to other buildings or into the open field across the street. We were extremely lucky it had rained not an hour before and the grass was still wet. A resident watches the historic building collapse. 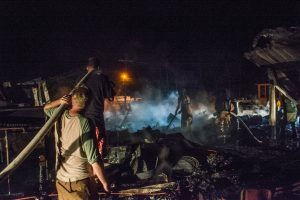 Volunteer forces mobilizing to fight the fire. While devastating to watch, it was amazing to witness an entire community come together in the face of this disaster. Everyone helped out, whether it was turning the hydrant on or getting water bottles to the firefighters, stamping out the embers in the adjacent field or holding the high-pressure hose. Just as the sun peaked over the horizon, the last ember went out. The next 24 hours was an emotional time in the settlement as everyone tried to go back to his or her daily schedules. 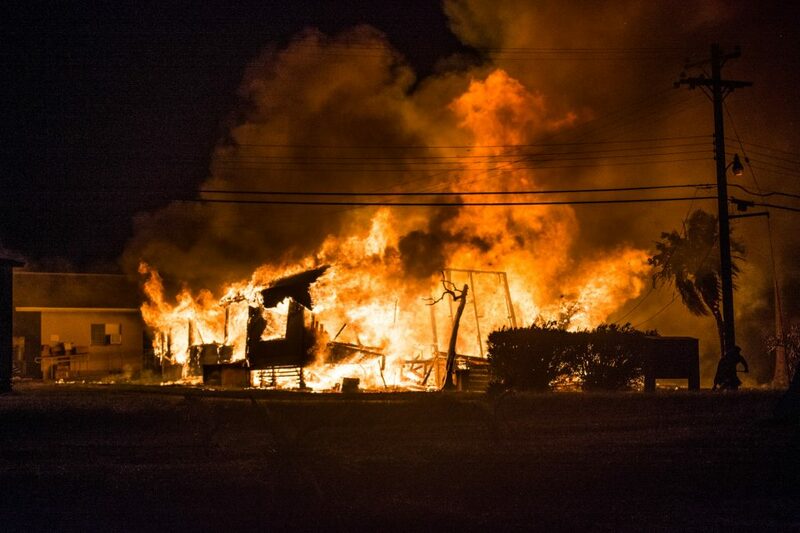 I have to commend all of the brave souls who helped fight the fire and supported their fellow community members through this tragedy that destroyed such a historic building and a vital cornerstone for the settlement. 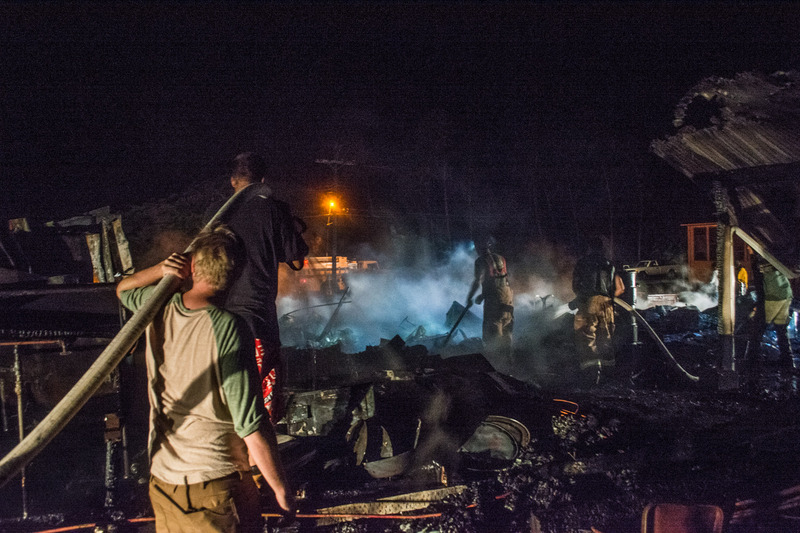 Volunteers fight the fire well into the night. Fighting the fire was a community effort. A pan sits on the steps leading up to the remains of the historic state kitchen. 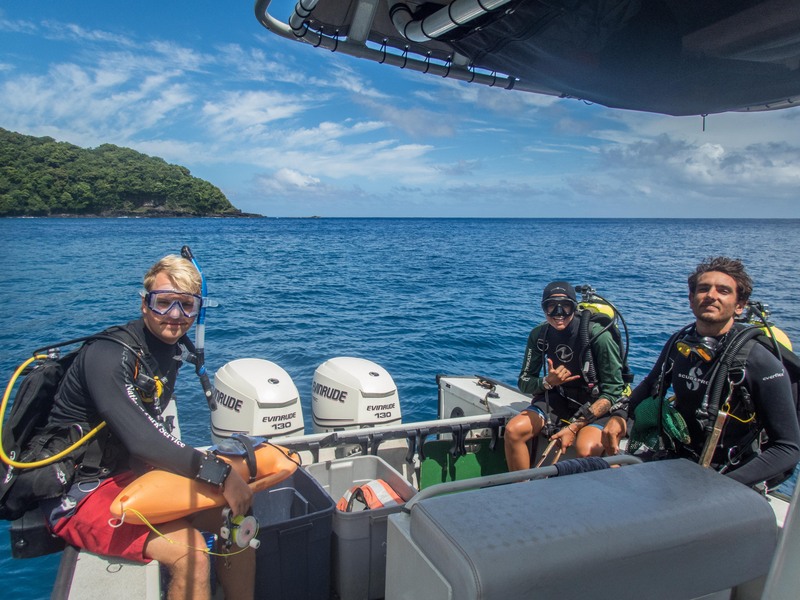 After an exciting night started off my second week in Kalaupapa, two visiting researchers from the University of Hawai’i, Kosta Stamoulis and Alex Filous, flew in to continue work on a shark-tagging project. In order to track sharks, and other apex predators, acoustic transmitters are implanted into a cavity on the underside of the fish and a plastic tag is attached at the base of the dorsal fin. 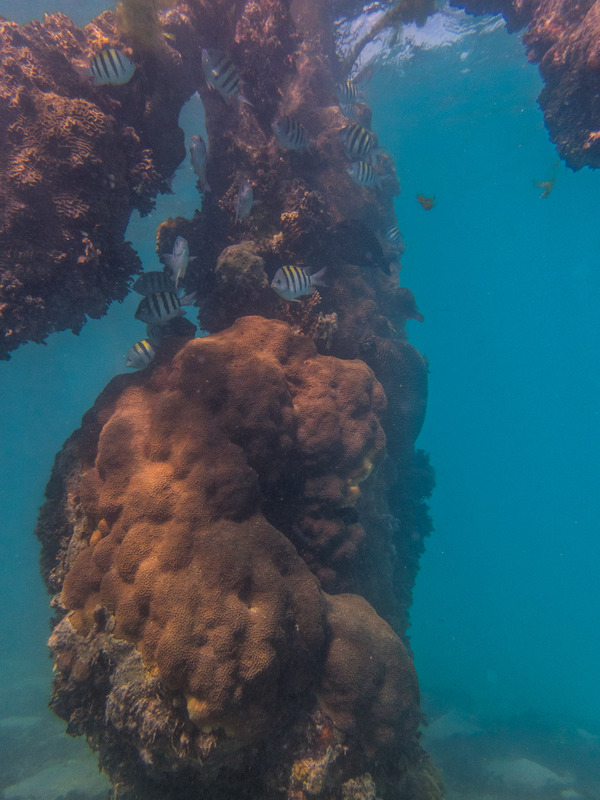 These transmitters emit a coded series of pings that are then picked up and recorded by acoustic receivers that are placed strategically around the reef. 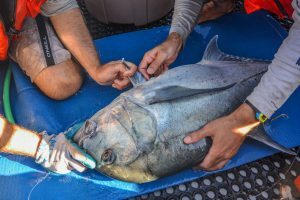 The array of receivers allows for the researcher to track the movement of the tagged fish as well as the time stamps of the movement. When compiled, this information can be used to identify feeding grounds, spawning sites, and habitat ranges. 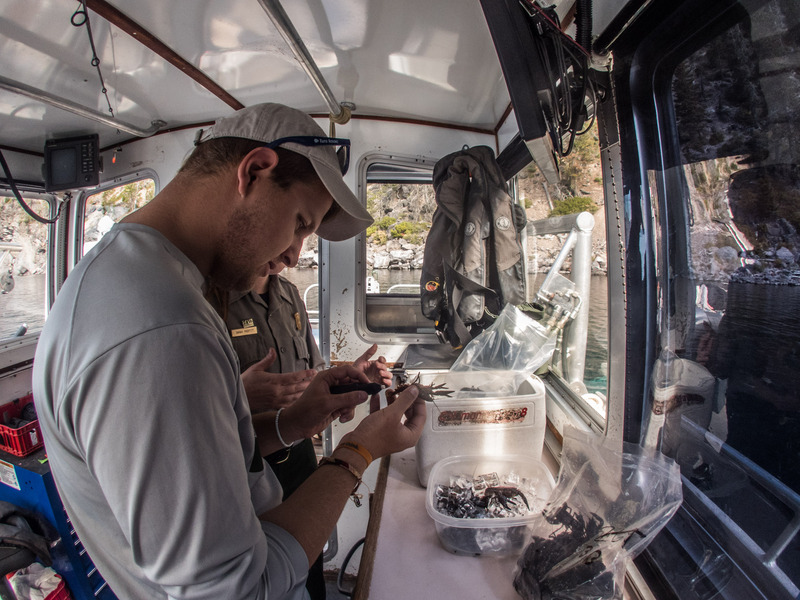 Before we could get around to tagging any new fish, we had to collect the receivers and download the data from the last 6 months. 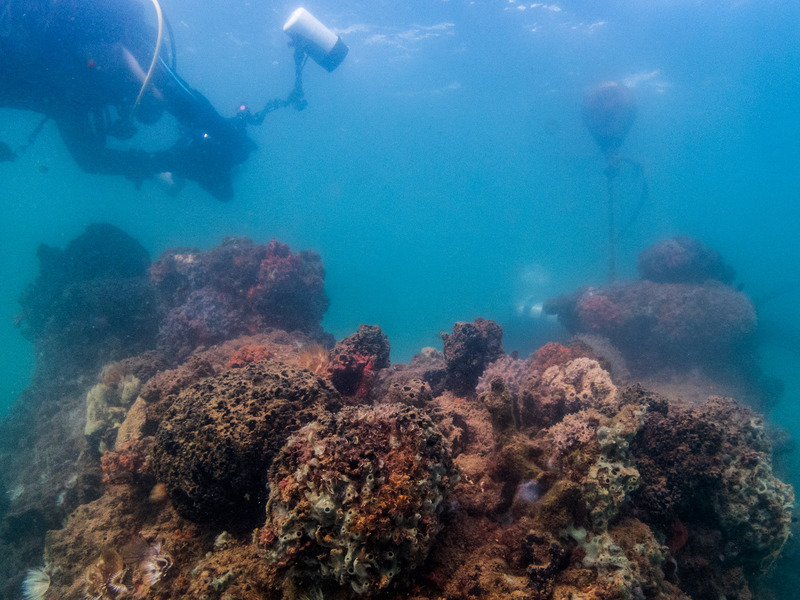 We spent the next day and a half collecting receivers located all around the peninsula – even venturing over to the breathtaking eastern side of the peninsula! Some were located just offshore in a shallow, meter-deep lagoon where blacktip reef sharks have been known to hang out, while some were located 500 meters offshore at a depth of 70 feet. We were able to retrieve all but Receiver #7, which had broken off of its mooring presumably during a strong swell event and, after a 50 minute search effort, we determined that it was lost to the sea. The eastern side of the peninsula had breathtaking views. 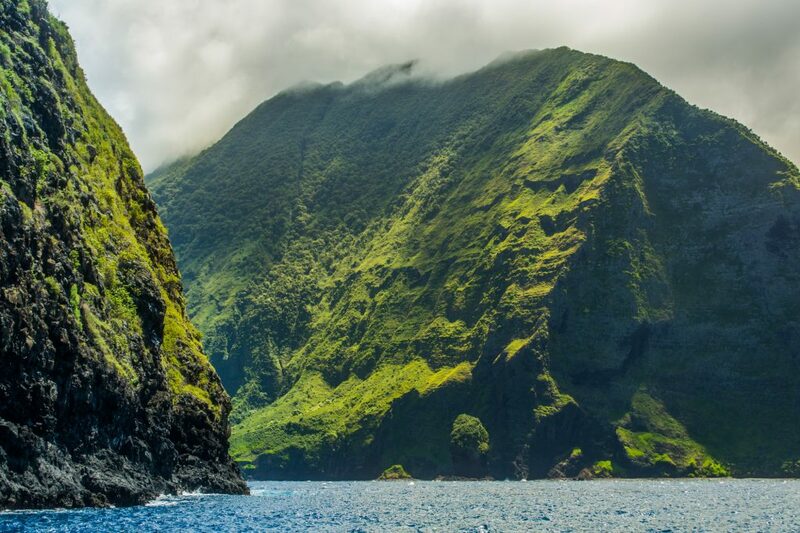 You might recognize the sea cliffs of Kalaupapa from the original Jurassic Park movie! Once all the receivers were collected, the mornings were spent underwater redeploying the downloaded receivers and the evenings were spent on the boat fishing. This was by far the biggest fishing endeavor I have ever been on, as I’ve only ever fished in lakes, so I was a bit overwhelmed at first. We had bait rods and game rods; we were using live bait, so we had a flow-through bait tank to keep the bait alive in the back of the boat; and, not to mention, we had all of the equipment and gear to do the tagging. Baitfish seemed to be the limiting factor for all of our outings. Oftentimes it took us a while to locate the ‘opelu (mackerel scad) or akule (big-eye scad), but once we saw a huge school on the fish finder we would drop the lines, jig them up, and reel in the bait. 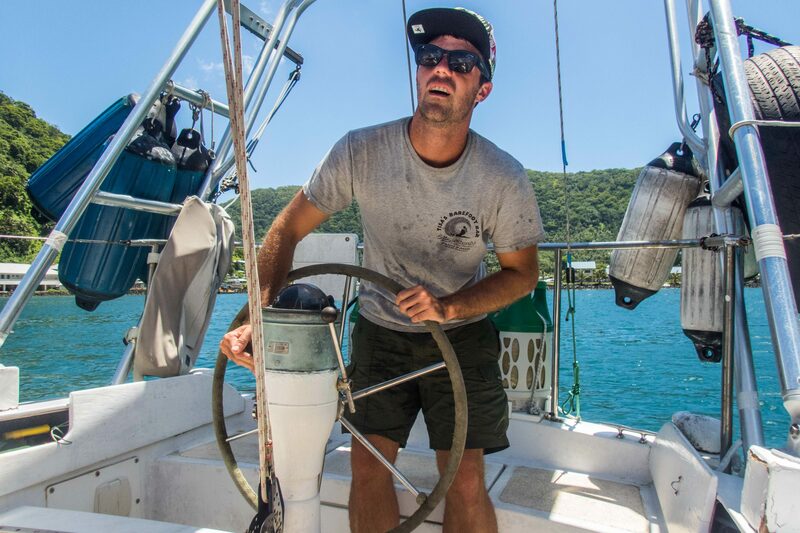 Our fearless captain, Randall, leads us on a quest to find bait. After stockpiling up some bait, Randall would drive us offshore a bit where Kosta and Alex would toss in their lines with the live bait thrashing about and wait. Sometimes they would bring up their lines only to find that a predator had taken a huge chunk out of the baitfish without their knowing. Other times the predators would make it known and put up a fight before somehow managing to get off the hook; they were taunting us. 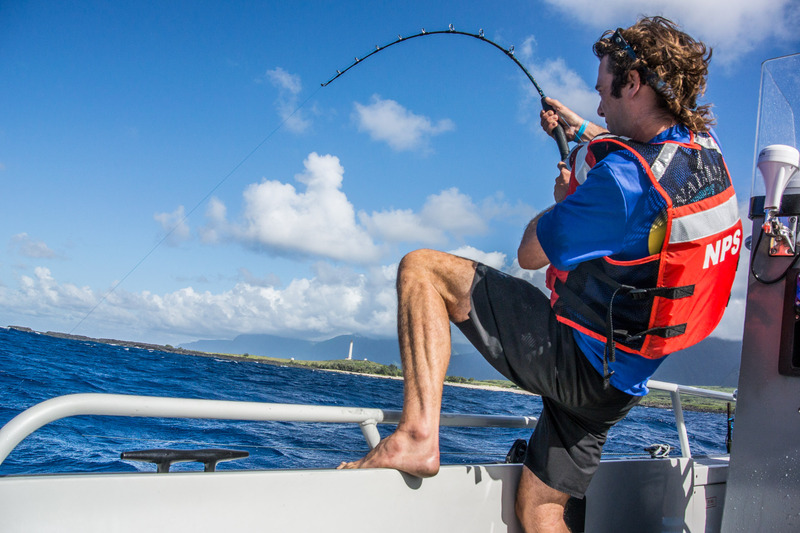 But by the end of the week, Alex and Kosta had reeled in four sizeable fish – unfortunately, none of them were sharks. Alex and Kosta each caught one ‘omilu (Bluefin trevally, Caranx melampygus) and one ulua (Giant trevally, Caranx ignobilis). Once they brought the fish on board, we would run a hose over the gills as they measured its size and inserted the two tags. And of course, we grabbed a picture before putting it back in the water. I didn’t catch any taggable fish. Instead my biggest accomplishment of the fishing trips was catching 3 ‘opelu on one line to save the day and allow the guys to keep fishing for a bit longer. Alex struggles to reel in a big one! Inserting the acoustic tag into the ulua. 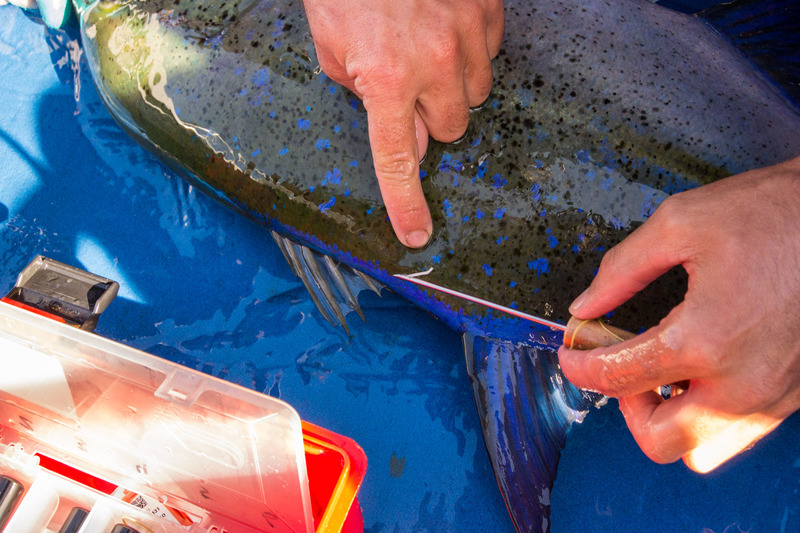 Tagging the dorsal fin of an ‘omilu with a plastic tag. 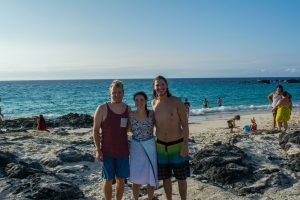 The day before I left, Eric came over and invited Jake, a visiting archaeologist for Cultural Resources, and I along for a monk seal survey. 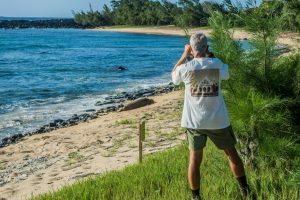 Beginning at the northernmost tip of the peninsula, we walked along the rocky western shoreline in the hopes of observing monk seal activity. 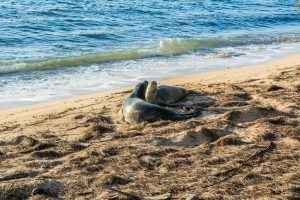 Hawaiian monk seals are one of the most critically endangered marine mammals in the world with fewer than 1,000 individuals left in the wild. The park has been monitoring their behaviour and tagging individuals to help track the population as well as determine habitat preference and seasonal behavioural dynamics. About an hour into our walk, we spotted two subadult monk seals basking on the sandy beach. Jake and I ducked into the tree line while Eric quietly approached to observe them and identify them based on their tags. It was amazing to get to see these endangered animals up close and know that the park is doing what it can to help document their behaviour and protect their habitat. And as if the two weren’t enough, we spotted and identified another two individuals, potentially a mating pair, hanging out just up the beach! 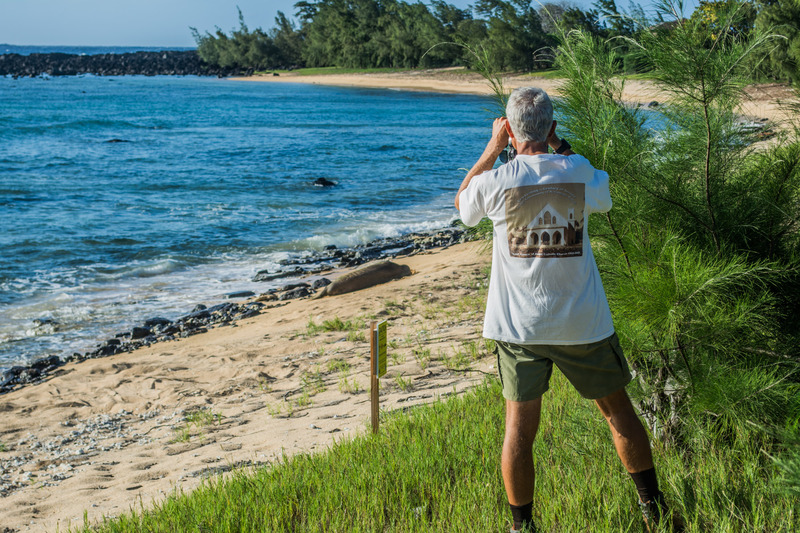 Eric walks the rocky western shoreline of the peninsula on our monk seal survey. Eric tries to identify the individuals without disturbing their day in the sun. 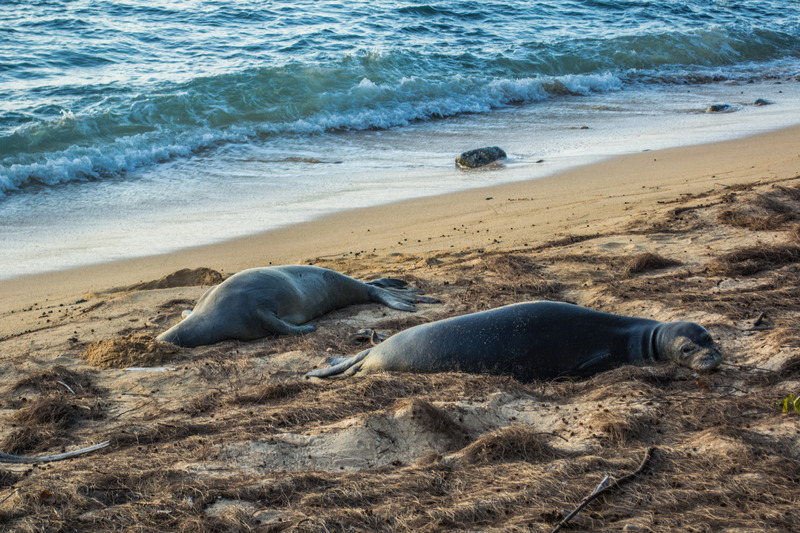 Monk seals basking in the sun on the beaches of Kalaupapa. 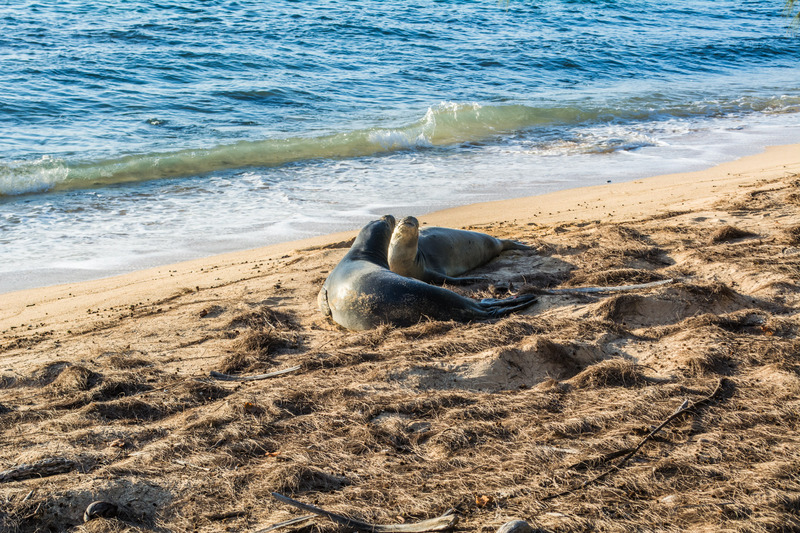 Two monk seals playing in the sand. Jake and Eric pause to record the monk seal IDs. Overall, the two weeks I spent at Kalaupapa were quite eventful. Kalaupapa is unlike any park I have been to as of yet. With a tragic narrative set at the base of majestic sea cliffs, Kalaupapa is truly a park of endurance and beauty. Its storied history has shaped the settlement into the quaint, close-knit family it is today and its isolation has helped preserve its wonderful natural resources from the vibrant fish communities to the fertile jungles. I am so grateful for having had the opportunity to experience all it has come to be. 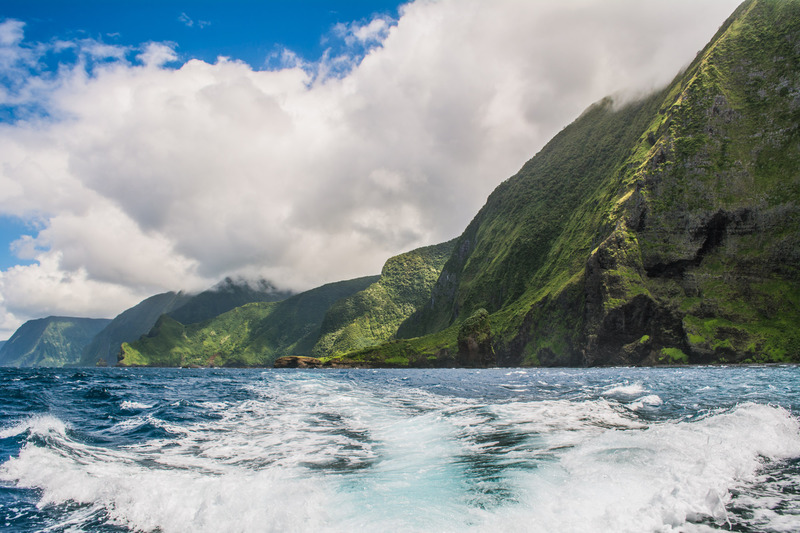 I would like to extend a huge thank you to Eric, Randall, and Sinefa for making me an honorary member of the Kalaupapa Marine crew and allowing me to explore your beautiful park through a variety of experiences! Thanks to Kosta and Alex for imparting me with your wisdom and teaching me how to fish. 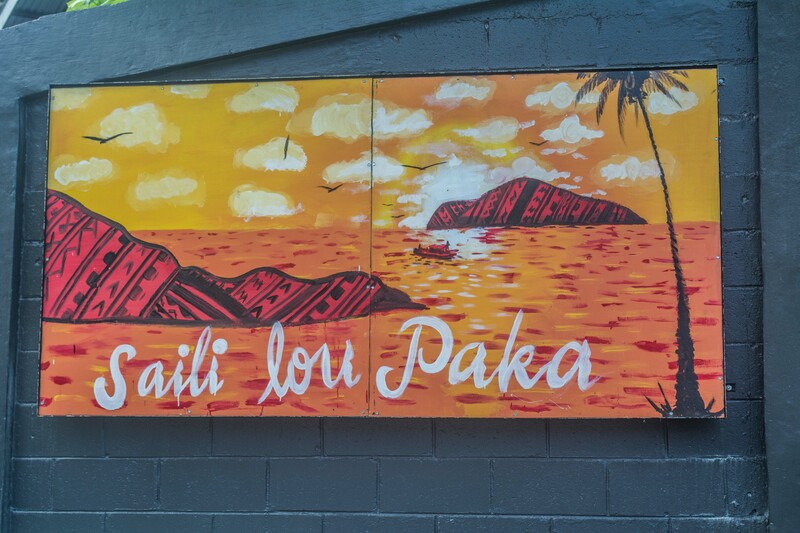 And a big thank you to Tim, Jake, Kylie, Susan, Julia, Ryan, Emily, Claire, Meli, and the rest of the wonderful people at Kalaupapa who welcomed me with open arms into your community and into your family. Until next time! This entry was posted in 2016 National Park Service, Current Internships on October 20, 2016 by Garrett Fundakowski. On Friday, August 19th, I said goodbye to the Hawaiian Islands and hello to the California coast as I crossed back over to the mainland. I landed in LAX and caught a shuttle to Ventura Harbor where Park Headquarters is located for Channel Islands National Park. There, I was greeted by Marine Ecologist Joshua Sprague who led me to the park’s 58-foot research vessel, the Sea Ranger II, where I would be spending the weekend before joining the Kelp Forest Monitoring (KFM) team for a 5-day monitoring trip. On Monday, after a day exploring the harbor and beach for myself, I awoke to the hustle and bustle of the crew arriving bright and early to prep the boat for the week ahead. Josh introduced me to Marine Biologist and Regional Dive Officer Dave Kushner, Captain Keith Duran, and Biological Technicians Katie Grady, Parker House, Keenan Chan, and Christy Santschi. As it turned out, I wasn’t the only visitor for the week. Ian Jacobson, the Dive Program Coordinator for local nonprofit LA Waterkeeper would be joining me in helping out the KFM team. 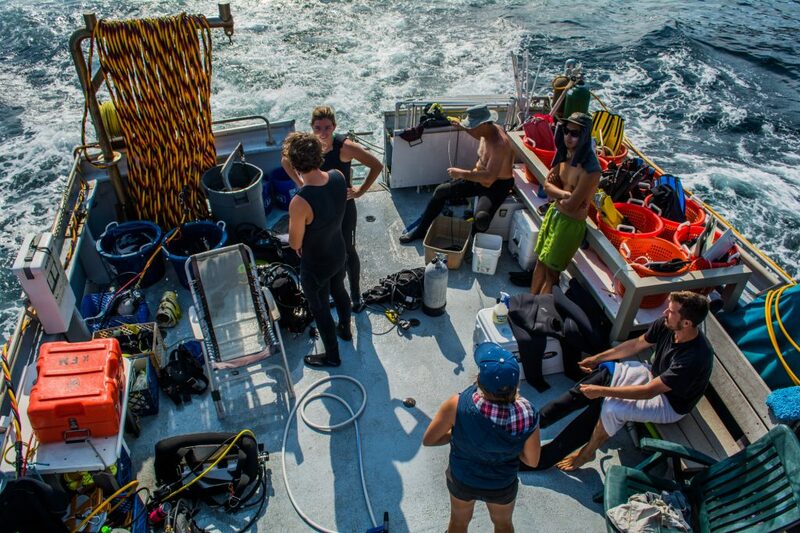 After loading dive gear, survey equipment, and enough food to feed an army onto the boat, we were off to the Channel Islands for an intensive week of diving and field surveys in the kelp forests of Southern California. As we motor out, the KFM crew prepares for the day of diving. The park itself consists of five of the eight Channel Islands – Anacapa, Santa Barbara, Santa Rosa, San Miguel, and Santa Cruz – and the water extending one mile offshore. 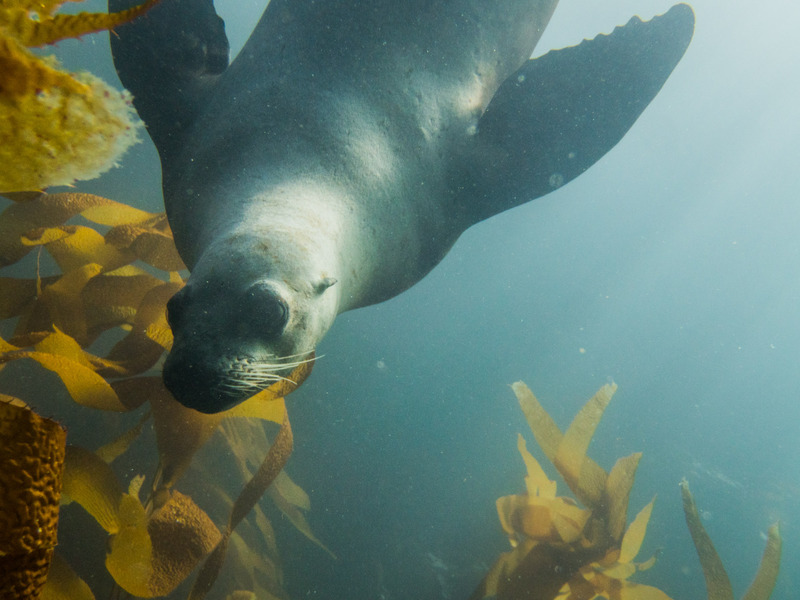 Located at the confluence of cold northern waters being carried south by the California current and the warm waters coming up along the coast from the south, the Channel Islands boasts an exceptionally diverse marine ecosystem. 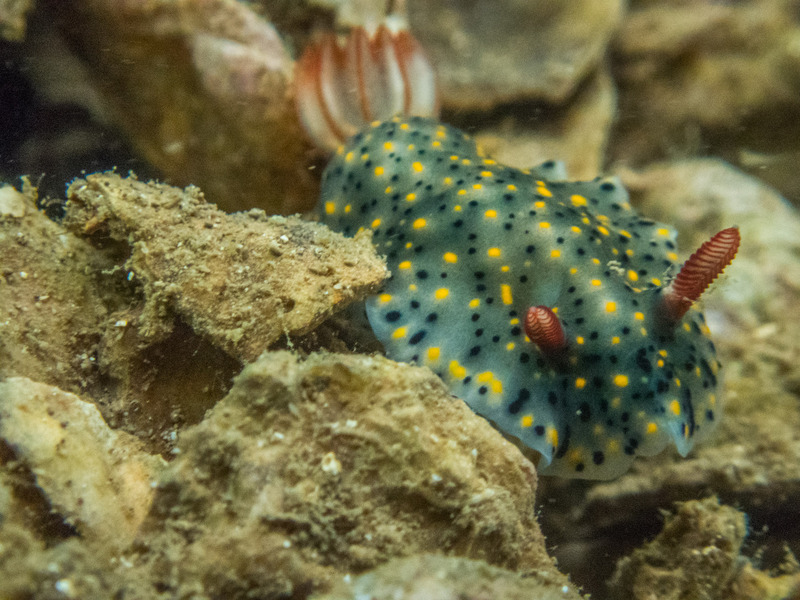 In addition to bringing together both warm- and cold-water species and yielding a high biodiversity, the currents also produce a nearly continuous upwelling phenomenon, which brings nutrient-rich water up from the deep ocean, supporting a highly productive environment. 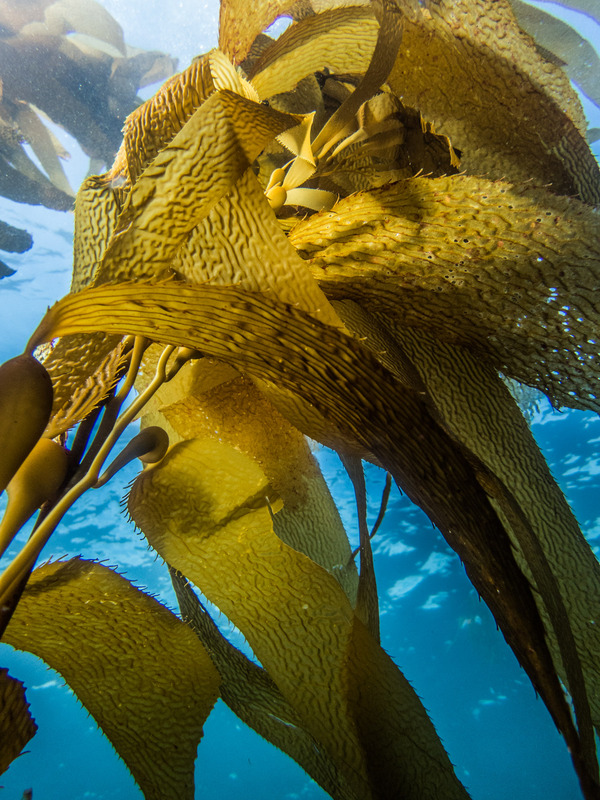 Because of this, the park boasts some of the most pristine examples of kelp forests in California. 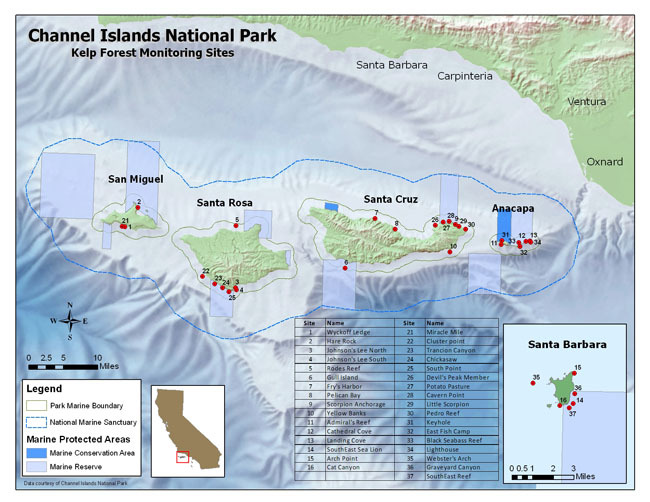 In fact, when Channel Islands National Park was created in 1980, Congress specifically noted this and highlighted the park’s scientific value as a site for long-term monitoring. 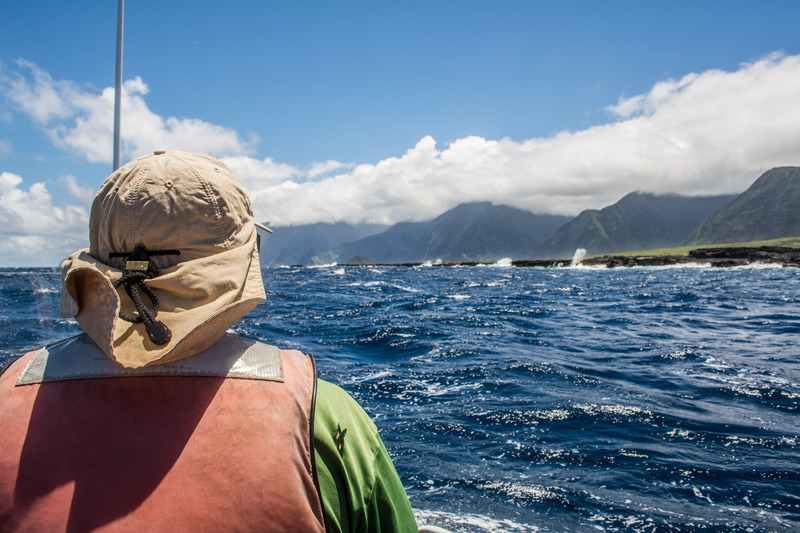 Launched in 1981, the KFM Program is the longest established marine monitoring program in the National Park Service. Now in its 35th year, the KFM Program has grown from monitoring 13 permanent sites selected at the time of its formation to the now 33 sites located throughout the park. 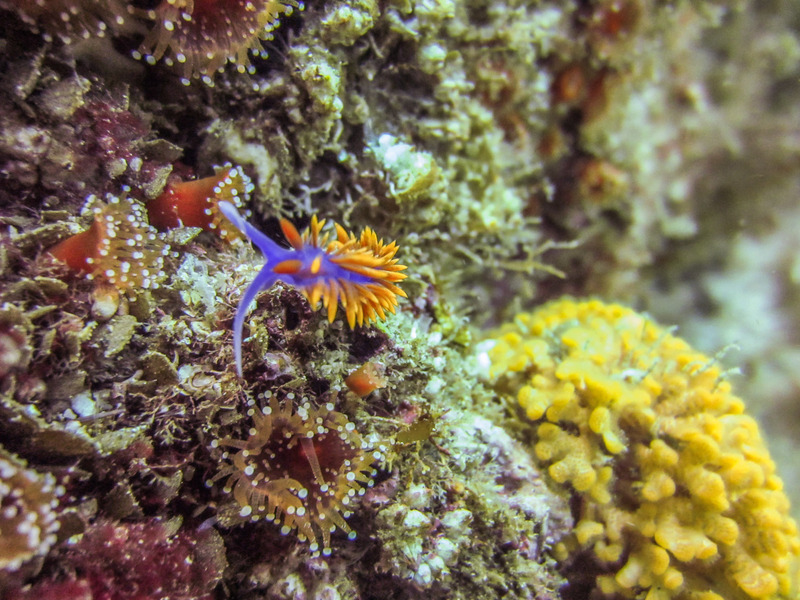 In 2005, the program doubled when 16 sites were added to better monitor the newly established Marine Reserves and to assess the efficacy of these reserves over time. Every year, each site is surveyed following the same detailed protocol and data are collected on over 70 species of algae, invertebrates, and fish. 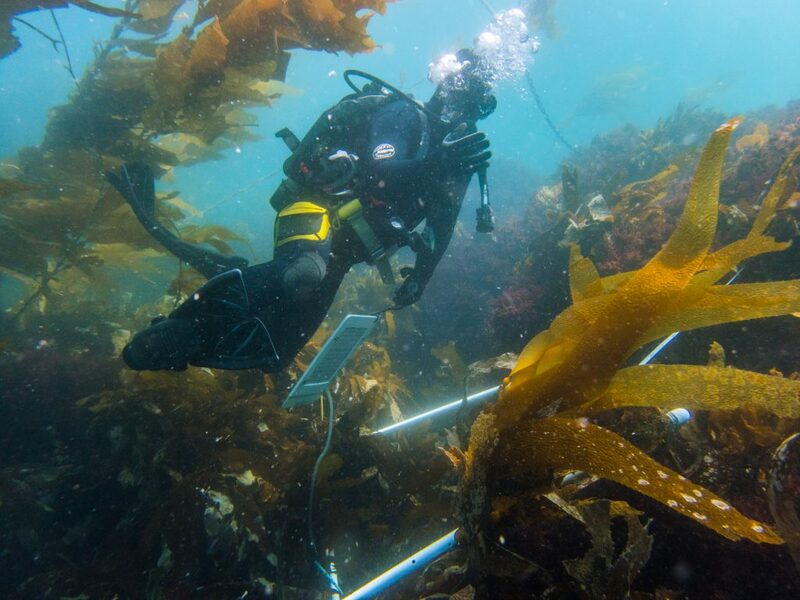 This long-term, multi-decade dataset has helped scientists understand the large-scale ecological patterns and processes at work in kelp forest communities that a five-year study would fail to detect. 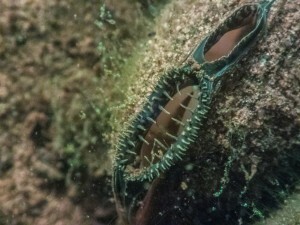 In addition, the data has allowed scientists to predict the larger trends in population dynamics of individual species and has informed various resource management strategies adopted by the state of California (including the establishment of marine reserves in 2002 and the closure of the abalone fisheries in 1997). Maintaining such an important and comprehensive dataset means that every summer, from May until October, the KFM team heads out on these 5-day monitoring trips every other week in order to complete surveys on all 33 sites. KFM Site Map. 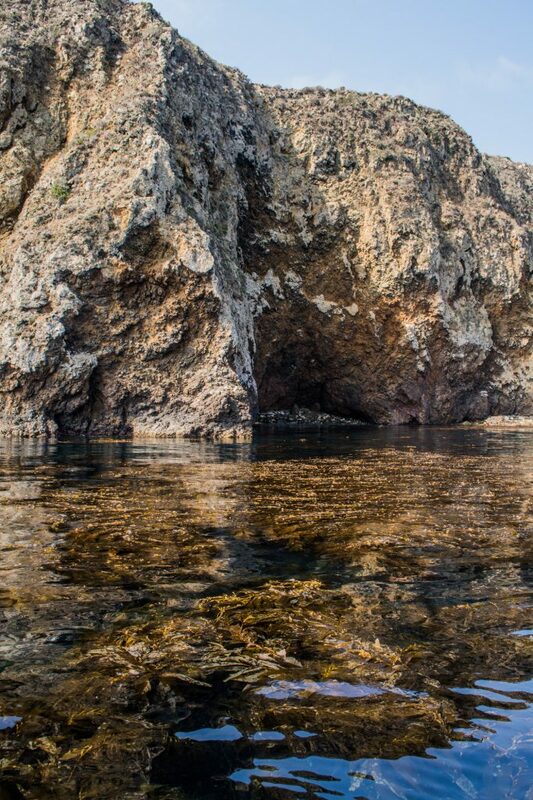 Channel Islands National Park. On the way out to our first site, Josh explained the game plan of a typical day at a monitoring site. 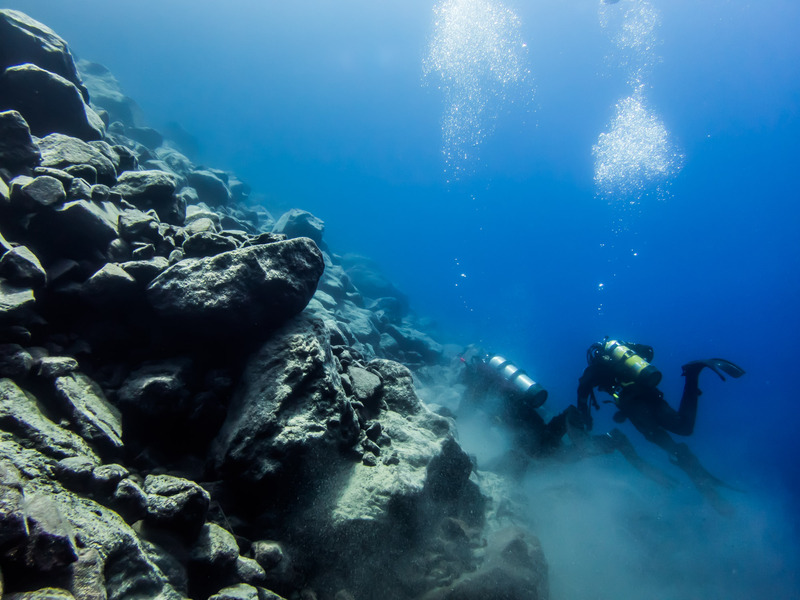 With a total of 12 different sampling techniques to perform and a massive amount of data to collect, each site typically requires 3 or 4 hour-long dives. Per person! 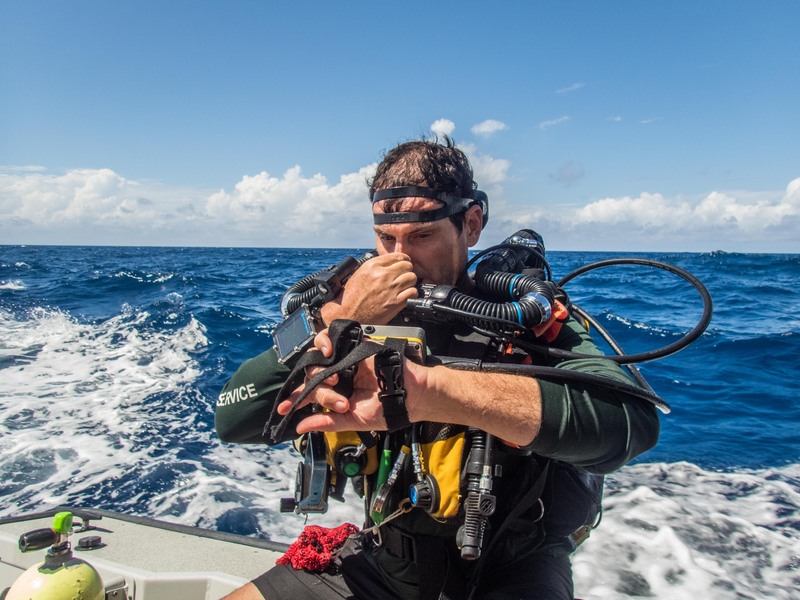 And with a total of eight divers on board, there were a lot of moving parts to keep track of, especially with two of us being new to the program and the protocols. However, having done this countless times before, the KFM team ran like a well-oiled machine. 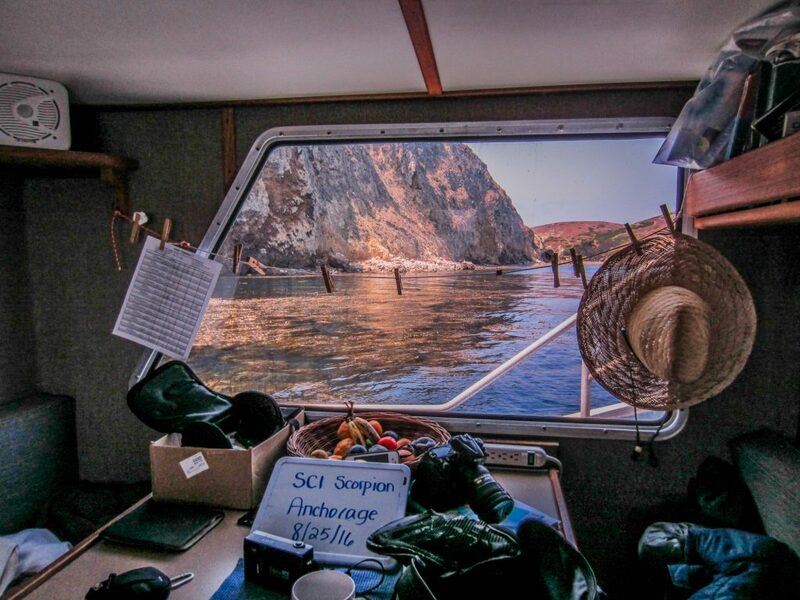 When we pulled up to Anacapa Island at Site #13, Landing Cove, as soon as the anchor dropped, a team of divers entered the water. 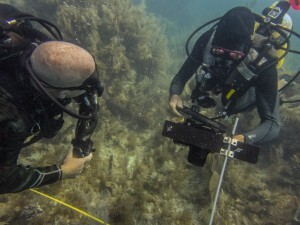 Their job was to lay the 100-meter baseline transect and take a video of the site. Once that was done, it was time for everyone else to hop in. 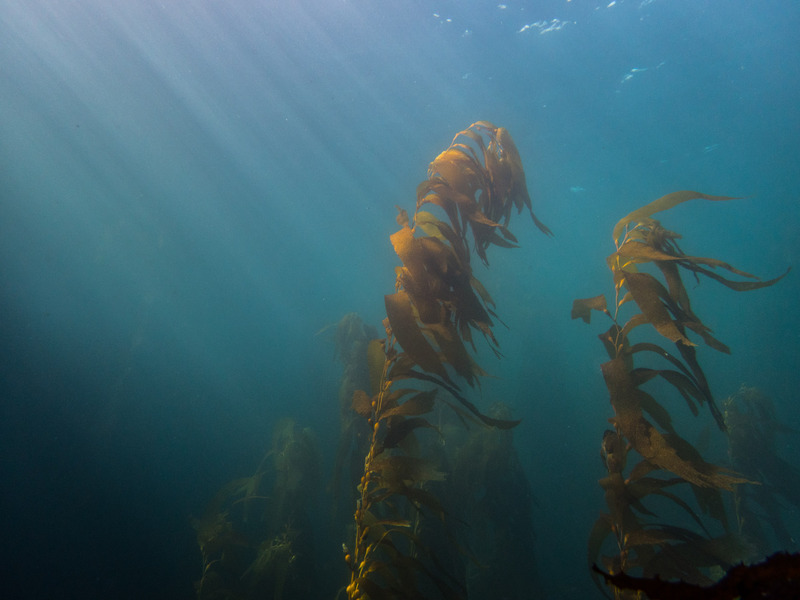 A view of the kelp forest from the surface. 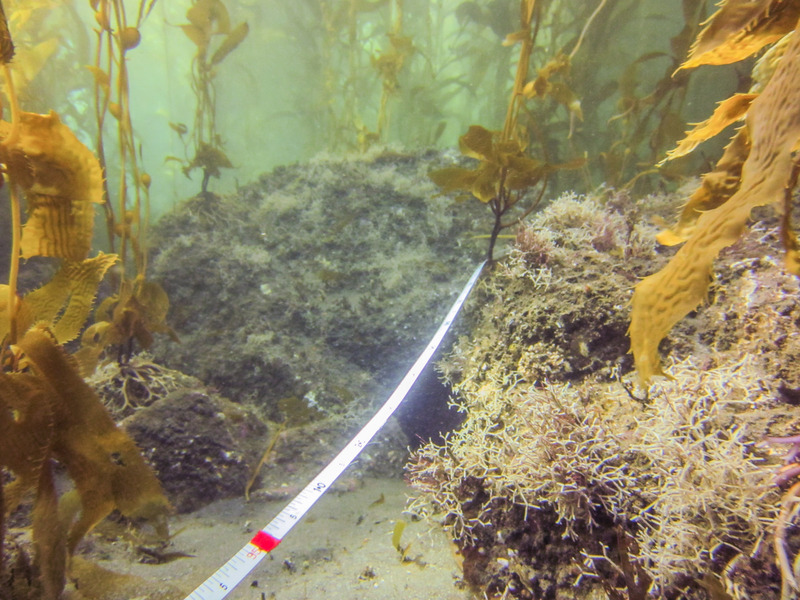 Looking down the 100-meter baseline transect as it disappears into the dense kelp forest. Not only was I new to the program and the protocols, but this was also my first dive ever in the California environment, let alone a thriving kelp forest biome. So all of the organisms were new to me. As such, I was paired with Dave Kushner for the day and told to just take in the ecosystem and observe the site while being his dive buddy. 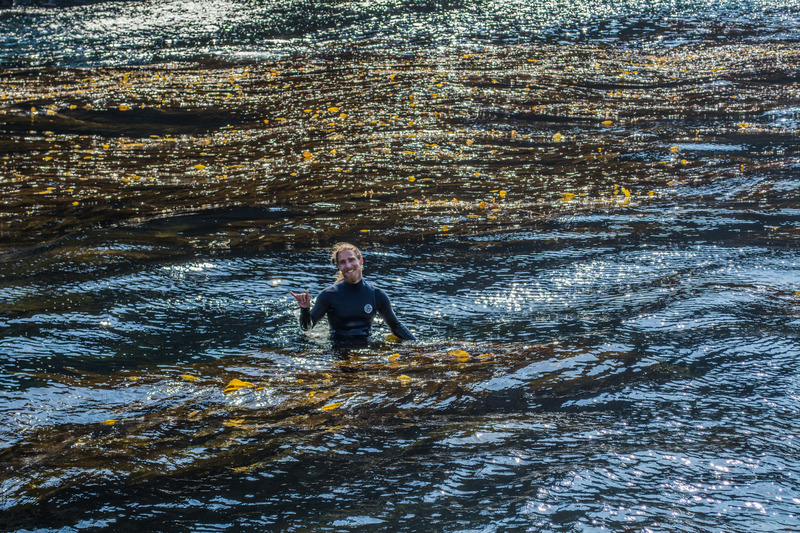 Dave Kushner motions for me to follow him into the kelp forest. 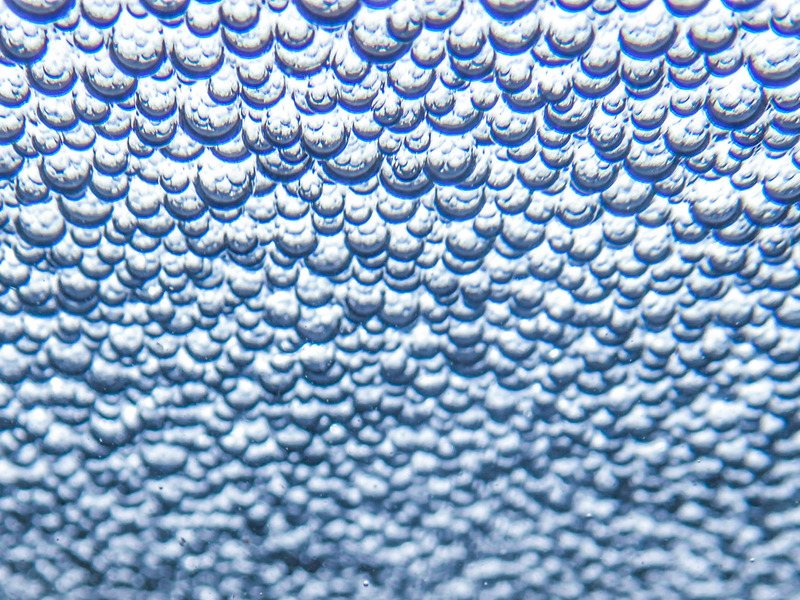 When I first splashed into the water, I was immediately taken aback. I was not quite sure what I was expecting, but it was nothing in comparison to what I saw. I was surrounded by Giant Kelp (Macrocystis pyrifera), some easily over 40-feet in height. It was a bit overwhelming at first, but when I paused for a second, I noticed the calming rhythym of the fronds swaying majestically in the surge. 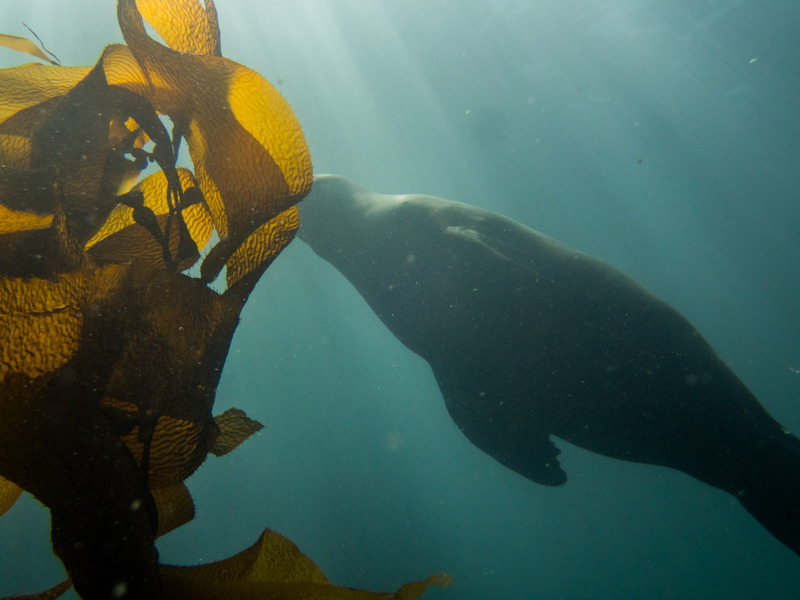 Taking a deep breath, I followed Dave into the dense maze of kelp, trying not to get entangled. 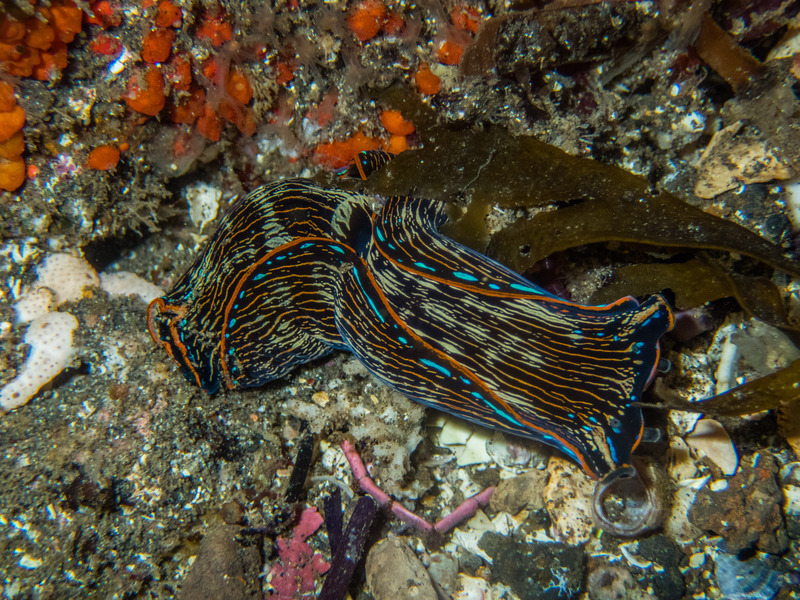 As we swam along, strange fish I had never seen before darted in between the kelp blades. 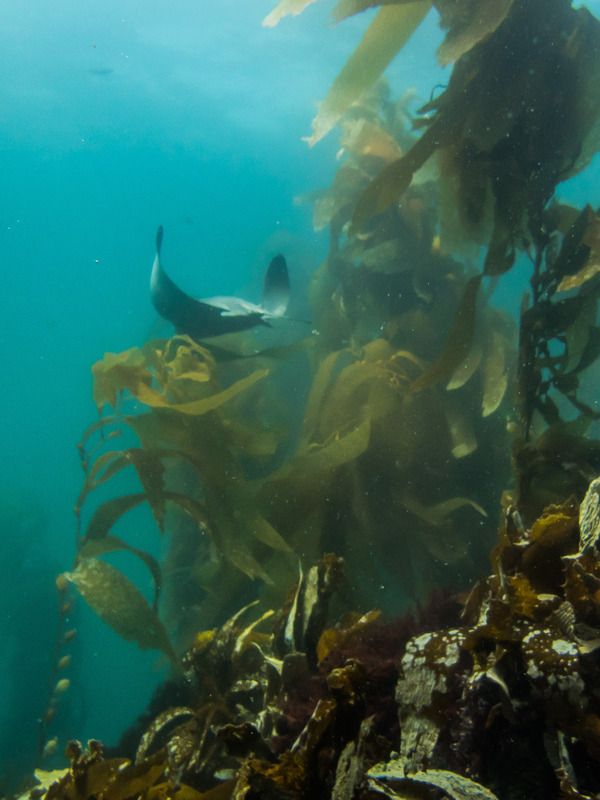 In the distance, a bat ray (Myliobatis californica) glided by in the canopy and a sea lion swam just yards away, checking us out. Compared to the showy color scheme of a Caribbean coral reef, the Californian kelp forest had a much cooler color palette, filled with earthy tones and muted hues. 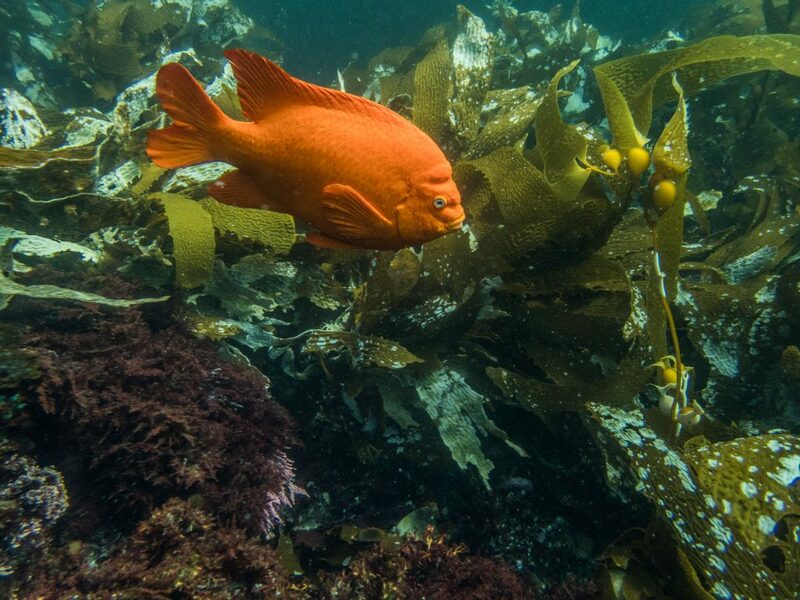 That is, except for the Garibaldi damselfish (Hypsypops rubicundus), whose burnt orange added an occassional splotch of color to the landscape. The sunlight dances as the kelp canopy sways in the surge. A sea lion comes by to check us out. He decides we’re not very fun and leaves us be. 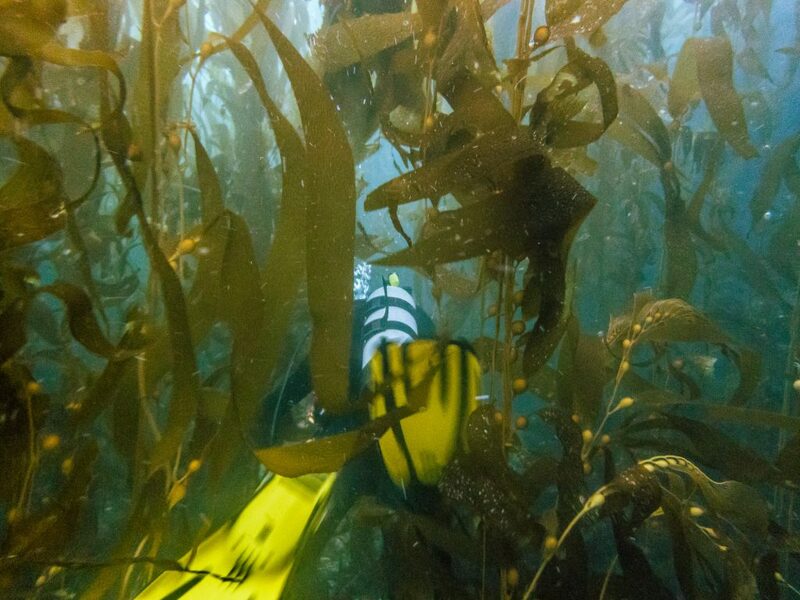 At times the kelp forest can get so dense that you can’t see more than a body length ahead of you. 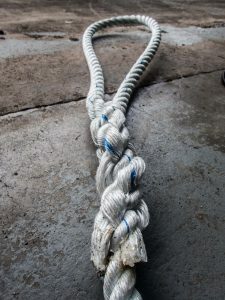 In these cases, you also need to be extra cautious about entanglement. 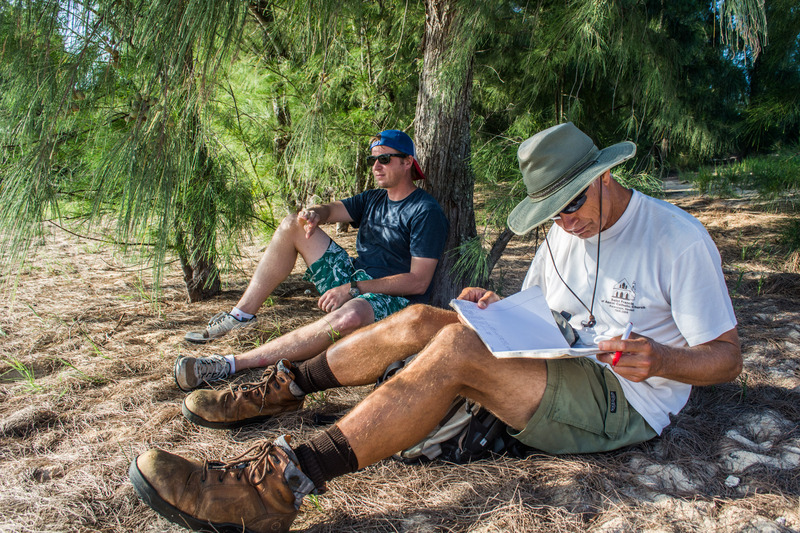 When we made it to the start of the baseline transect, Dave and I began working on 1-meter quadrat surveys. 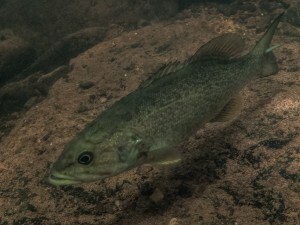 With a goal of determining abundance of certain sedentary indicator species, this sampling technique was primarily focused on algae and invertebrates. 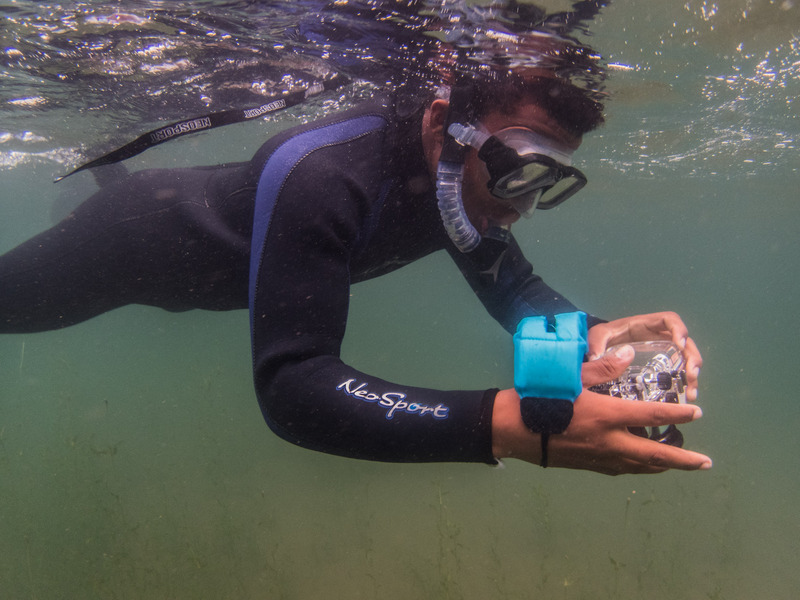 At regular intervals along the transect, I would set up two 1-by-1 meter quadrats, one on either side of the tape, and Dave would search for snails, sea stars, and other organisms within the boundaries and record the abundance. 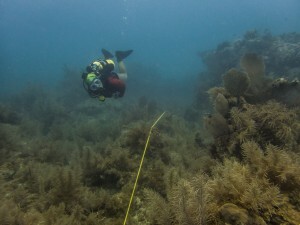 On our next two dives, Dave and I took band transects perpendicular to the baseline. Though conceptually similar to the quadrat surveys, this sampling technique was designed to determine the abundance of less common or clumped organisms, like endangered abalone species or rock scallops, and therefore encompassed a much greater search area. 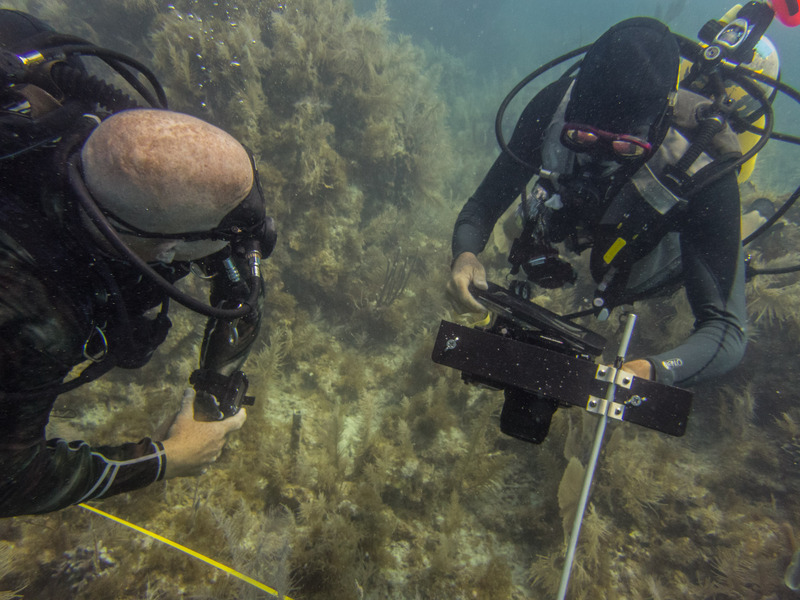 While Dave swam the 60-square meter sections collecting the data, he would point out different organisms so that I could begin to develop a search image of my own. Additionally, as he was doing the surveys, I took pictures of various fish, algae, and invertebrates so that I could look them up later and identify them for practice. As we continued our way down the baseline doing more band transects, we crossed paths with other members of the team who were busy at work. 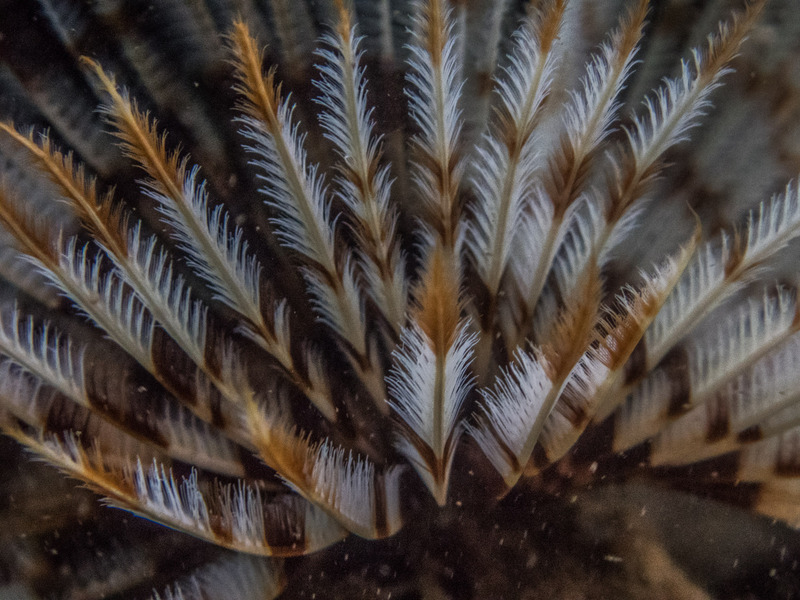 Some of them were collecting size measurements on hundreds of urchins, while others were counting the number of stipes (think stems) of individuals of Giant Kelp. Nearby, Katie, attached to a surface supply of air, could be heard calling off data points into her full-face communication system for Keenan to record topside. 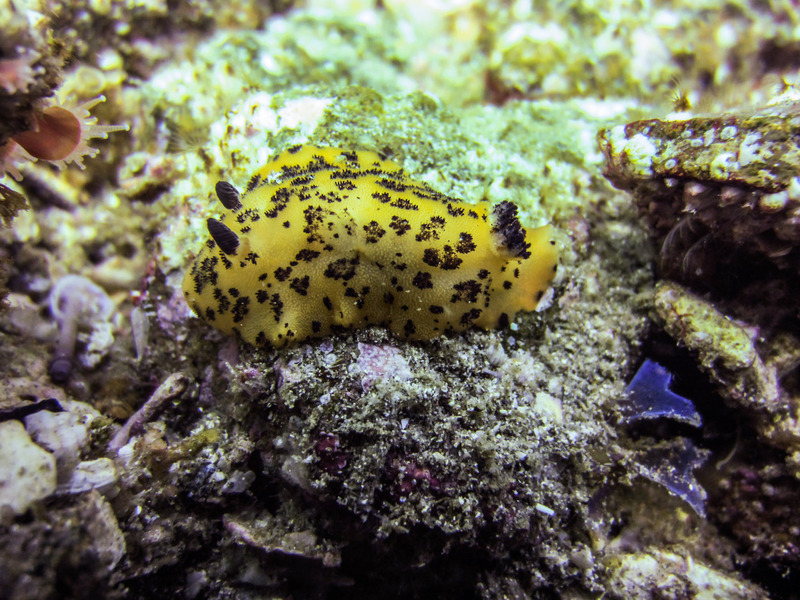 With four dive pairs operating at once, the site was alive with a suite of scientific activity! Finally, after racking up over 26 hours (yes, you read that right – 26 hours!) 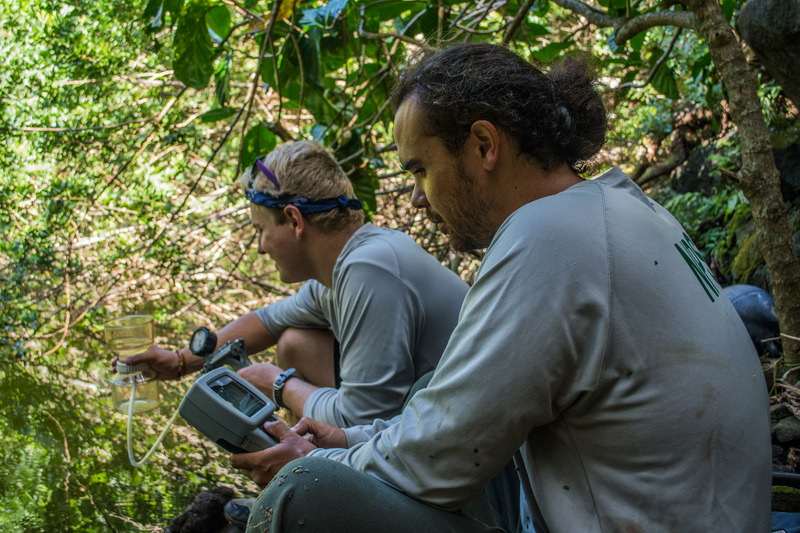 of bottom time and rigorous data collection, we had completed the first site of the trip. Hanging at 15 feet, the KFM has an oxygen bar you can breathe on for your safety stop. Definitely a treat after a long dive! Coming up from the last dive of the day. Together, we had over 26 hours of bottom time on Day 1 alone! 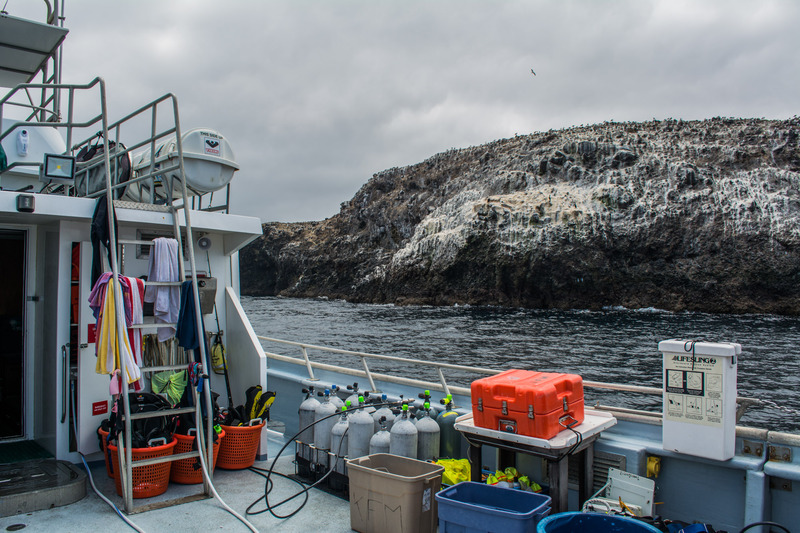 Throughout the rest of the week, we went to different spots off of Santa Cruz Island and repeated the day-long process of surveying a site. Our second site, Pedro Reef, was a stark contrast from where we were diving the day prior. 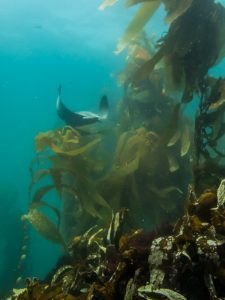 Instead of diving on a beautifully lush kelp forest, we descended on an empty and exposed urchin barren. Located outside of the Marine Reserve, Pedro Reef serves as a prime example of how overfishing can have devastating cascading impacts on a kelp forest. Fishing pressures on predators like the California sheepshead and other apex consumers, allow sea urchin populations to boom unchecked. 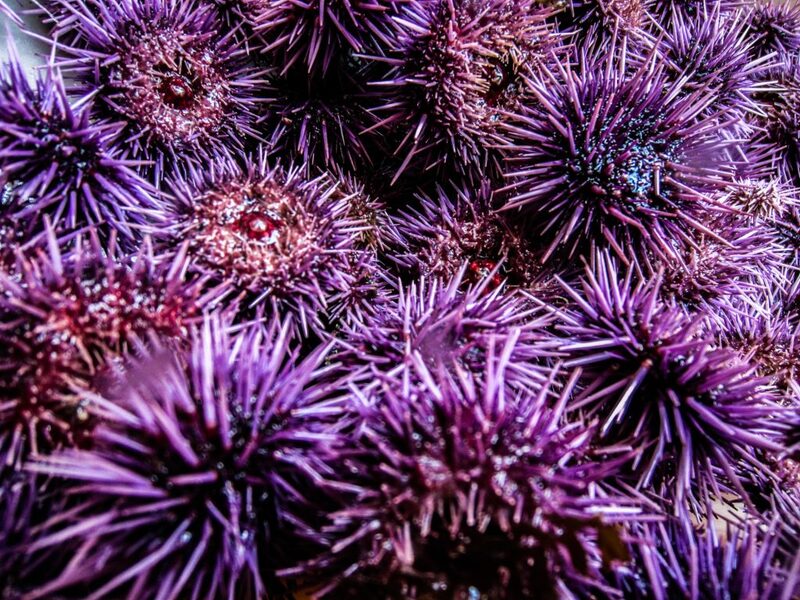 From there, elevated urchin populations graze on and mow down entire sections of kelp forests. To add insult to injury, the site saw a dramatic change from the previous year’s already dismal barren state. An invasive brown alga Sargassum horneri had taken over and covered practically every inch of available substrate. 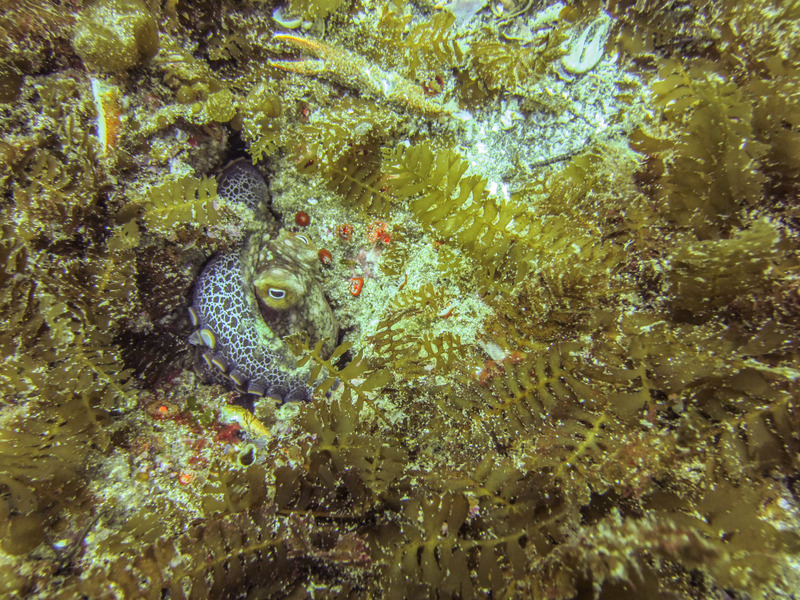 An octopus hides in a crevice, surrounded by a field of the invasive Sargassum. At Pedro Reef, I was paired up with Katie and got to switch it up and implement different sampling techniques. 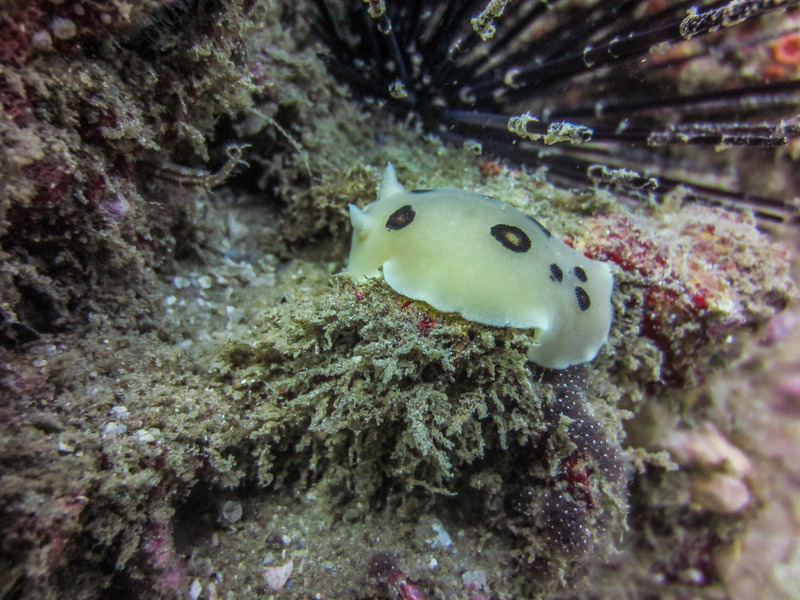 For our first dive, I got to practice identifying the various species of fish I had studied the previous night by doing a Roving Diver Fish Count with Katie. Together we dropped down, each with our own dive slates and began swimming in a lane that spanned out 10 meters on either side from the baseline transect, counting every fish we saw. 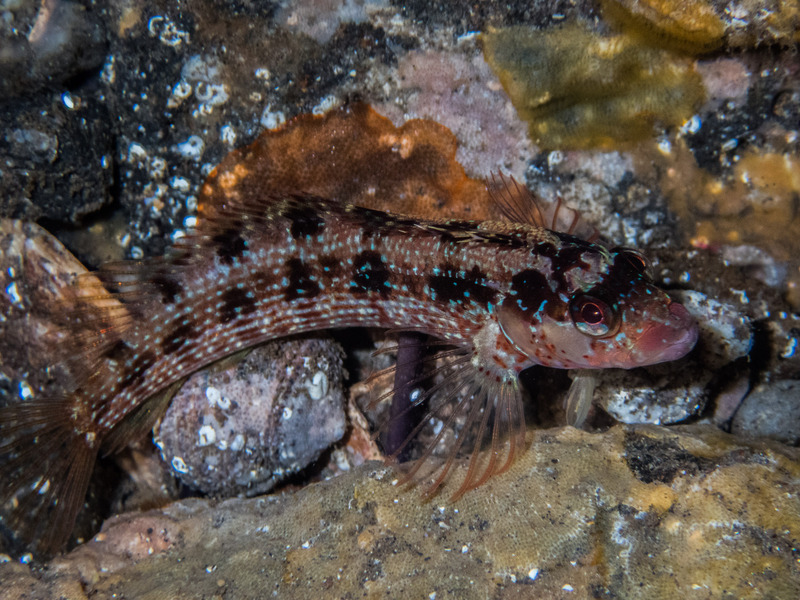 For someone who just learned about the fish of the southern California waters, I have to say that I was proud of my ability to at least identify all of the indicator species, even if I did have to write down descriptions of a few fish because I didn’t remember their names. On our second dive, Katie and I were designated to do the 5-meter quadrats. 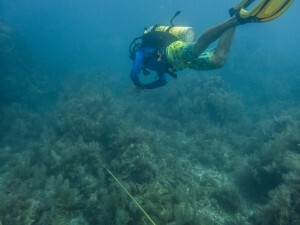 This protocol called for combing 1-by-5 meter segments on either side of the baseline and quantifying the amount of adult and juvenile Giant Kelp and Sargassum. As this site was overgrown with Sargassum, we spent well over an hour raking through the macroalgal carpet counting the individuals and determining their reproductive maturity. 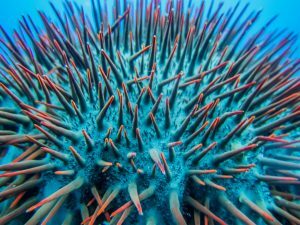 While tedious, this data will be very important for understanding long-term patterns and processes associated with urchin barrens and the cascading effects of overfishing. 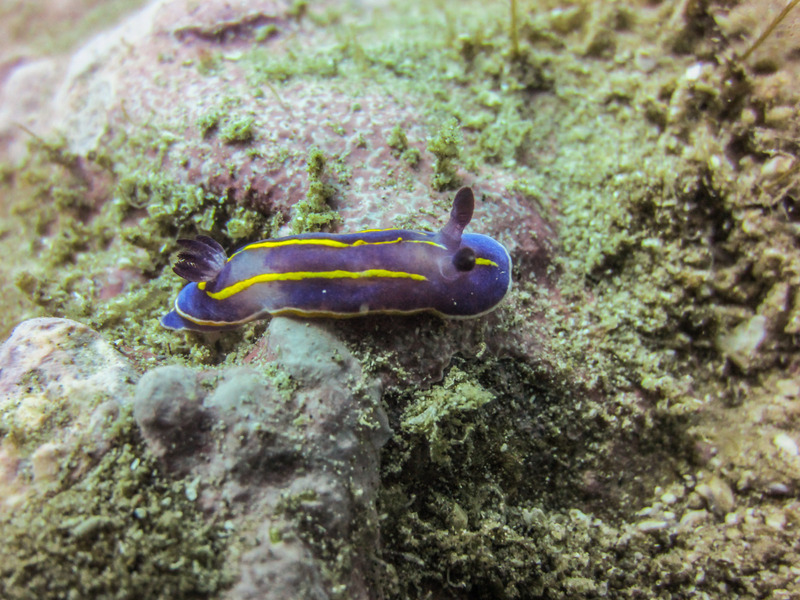 Plus, as a bonus, looking at the substrate so closely during the surveys revealed some colorful surprises! On Wednesday, we changed it up and did something a bit different. 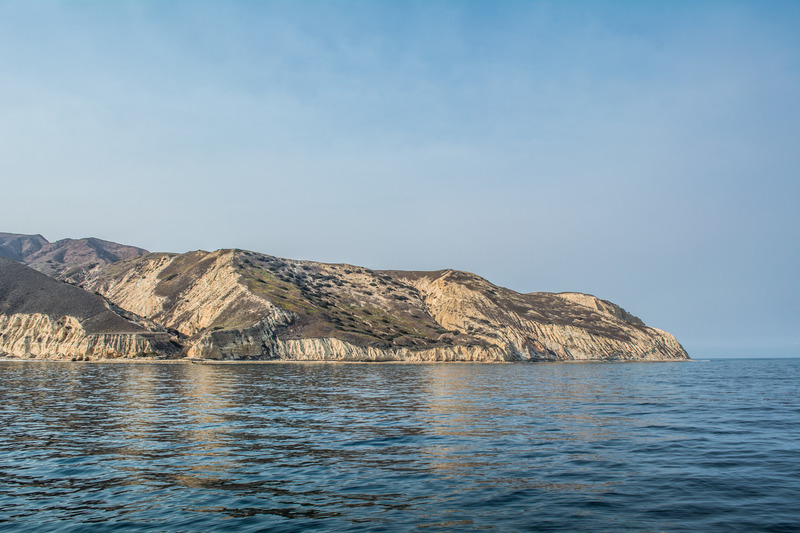 We went to the backside of Santa Cruz Island, to Yellowbanks, a site that had already been surveyed earlier in the summer. Instead of doing the normal routine, we went to check on the Artificial Recruitment Modules (ARMs). Basically just stacks of cinderblocks inside wire cages, ARMs are an important part of the KFM program. 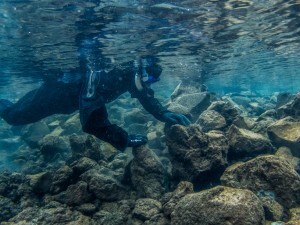 All of the other sampling techniques the program utilizes are non-intrusive, meaning divers do not turn over rocks or reach inside crevices to look for organisms. However, since many young recruits and juveniles often take shelter in those protected spaces, a large and crucial demographic of creatures are overlooked in these surveys. 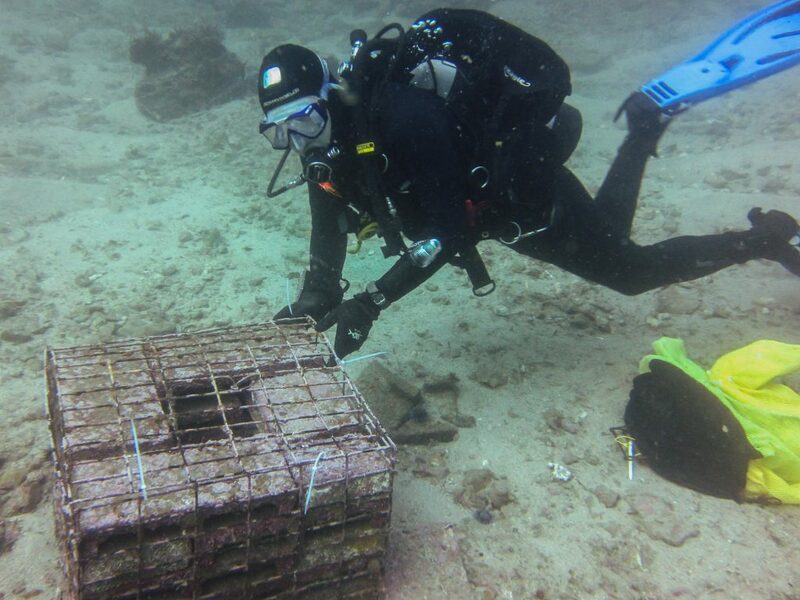 By deploying the artificial 3-dimensional structures and thus providing shelter for juvenile organisms, the KFM team has created an artificial habitat for a comprehensive intrusive survey. 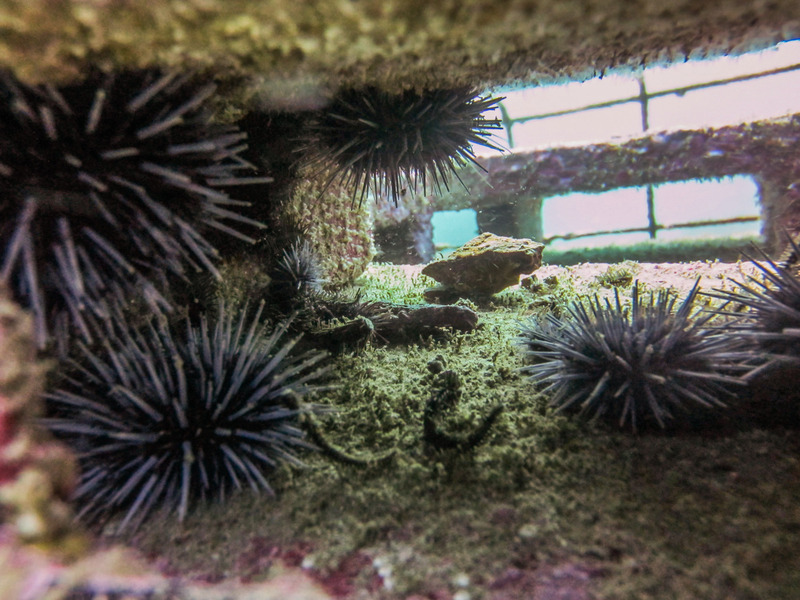 Young urchins and other juvenile organisms find shelter in an ARM. 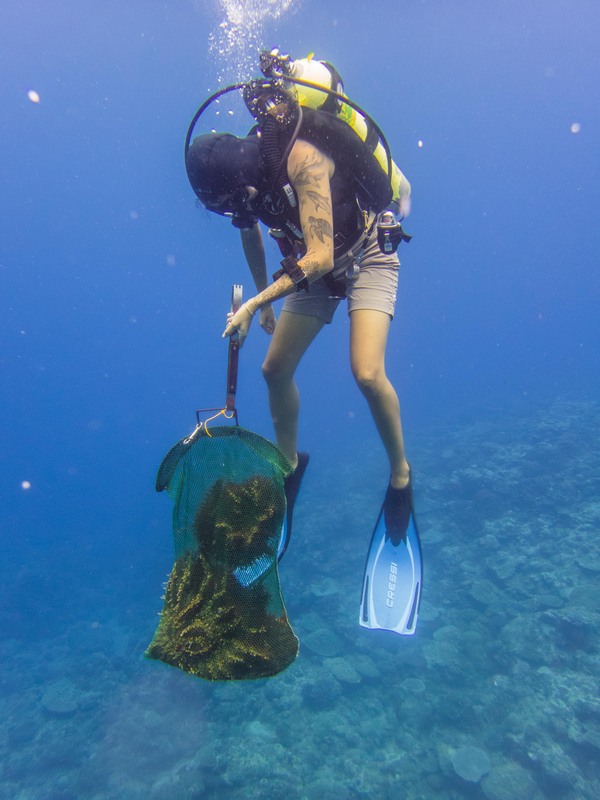 On the first dive, each person picked an ARM and disassembled it, carefully removing each cinderblock and placing all of the indicator species found on, in, or under it into a giant mesh collection bag. After an ARM was completely disassembled, the goodie bags of sea creatures were brought back to the boat where their contents would be measured. 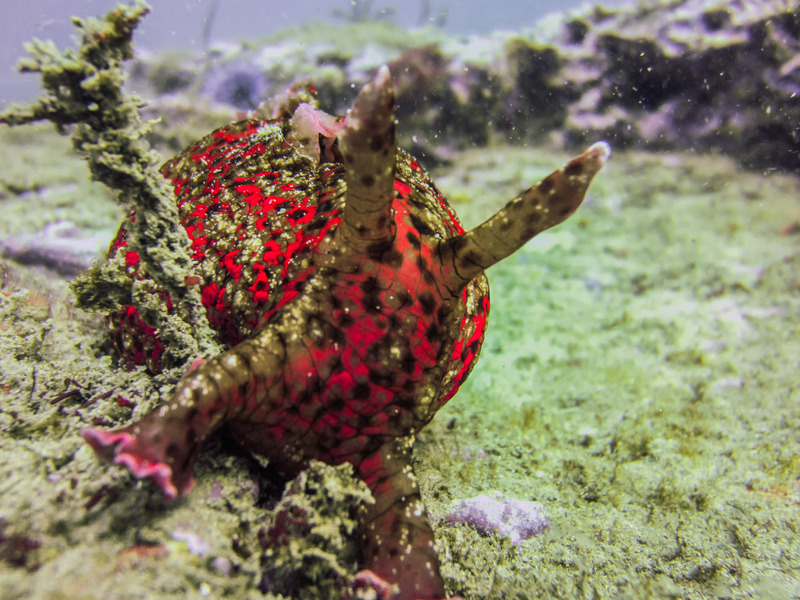 On deck, everyone gathered around the bucket of creatures with a set of calibers and called out mesurements of urchins, sea stars, cowries, and snails to a data collector. The organisms were then returned and the ARMs reassembled. The KFM program uses Artificial Recruitment Modules (ARMs) to conduct systematic intrusive surveys. With my collection bag in tow, I begin to disassemble an ARM and examine the contents. 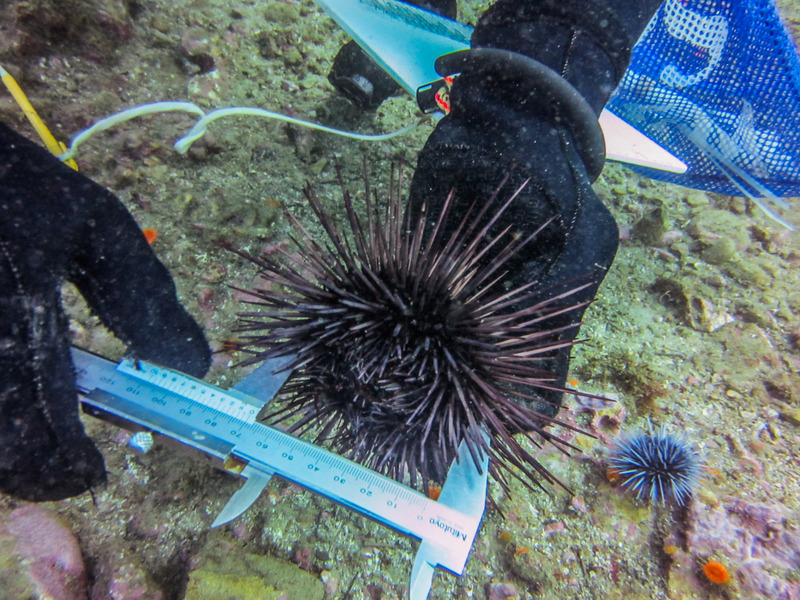 A diver measures a Crowned sea urchin (Centrostephanus coronatus) with a pair of calipers. 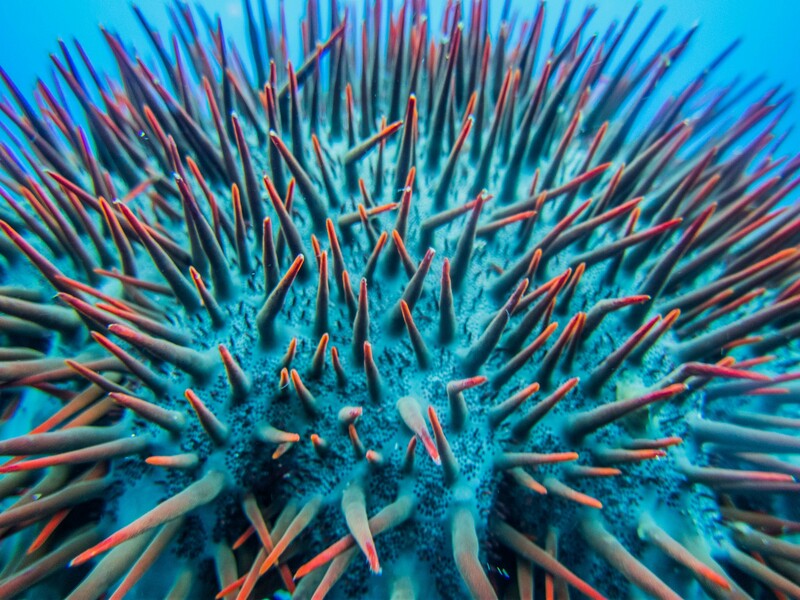 These urchins are quite fragile and are measured on the dive to avoid harming the urchin. 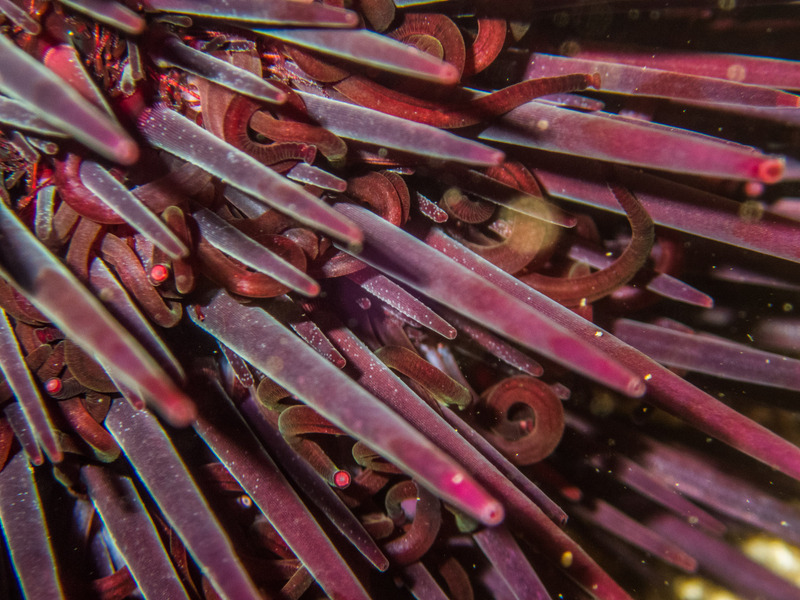 A pile of purple sea urchins (Strongylocentrotus purpuratus) that have already been measured make up just a portion of the contents of a typical ARM. 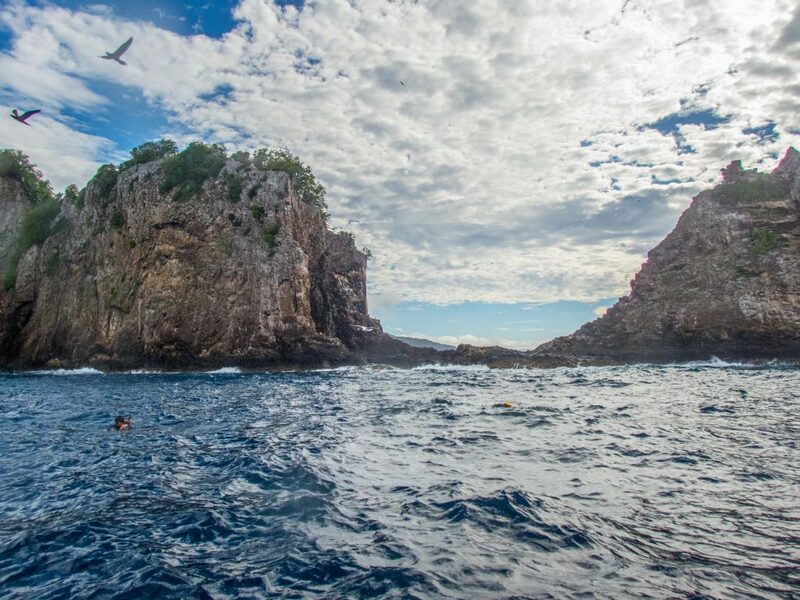 Following our long days, whether they were spent diving for 3-4 hours or sitting hunched over a bucket of urchins, we would motor over to Santa Cruz Island, where we dropped anchor in Prisoner’s Bay for the night. Every evening, a different person on the KFM team cooked dinner for the group as the rest of us sat down and talked about the day. There was always a little bit of data processing and discussion to be done before work was officially over and dinner was served. Life aboard the Sea Ranger II was similar to that of the MV Fort Jeff out at Dry Tortugas National Park. 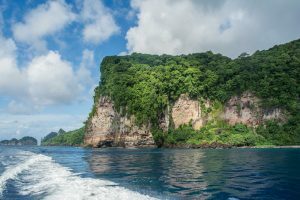 While most people might find the cramped spaces or the lack of certain amenities like cell phone service or internet hard to handle, I had really come to enjoy life aboard a dive boat. Something about the daily schedule of dive, eat, sleep, repeat really clicks with me! 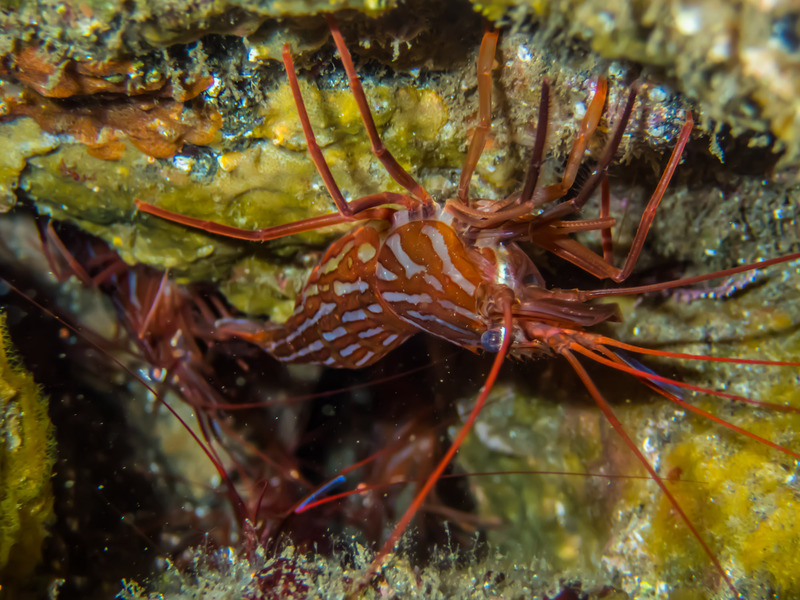 On Thursday evening, after spending the day surveying Scorpion Anchorage off of Santa Cruz Island, we had a visit from a surprise guest. The infamous Pike Spector, last year’s OWUSS NPS Intern, just happened to be spending his last week before heading back to grad school on Santa Cruz Island and came out to say hi to the KFM team. It was awesome to get to meet Pike and chat about his experience last year and the cool things he is doing now after his internship. 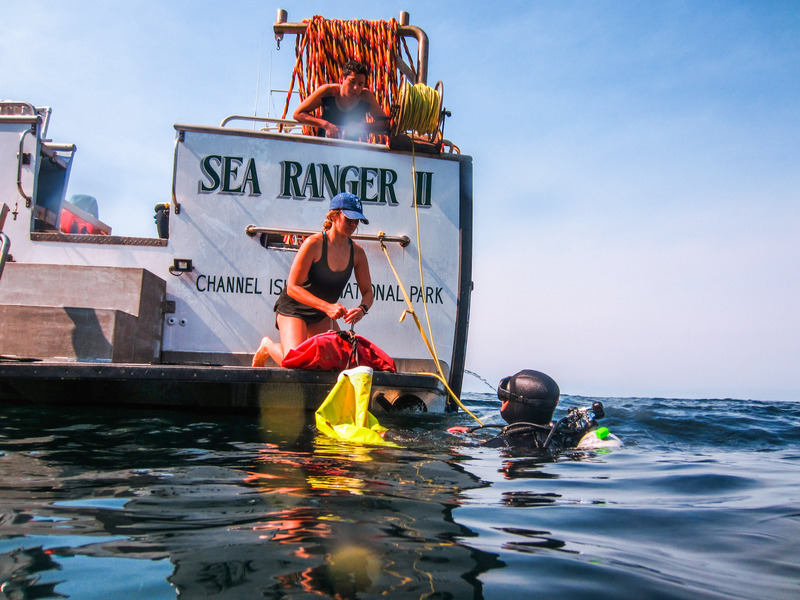 2015 OWUSS NPS intern, Pike Spector, paddles out to say hi to the Sea Ranger II and the KFM team. 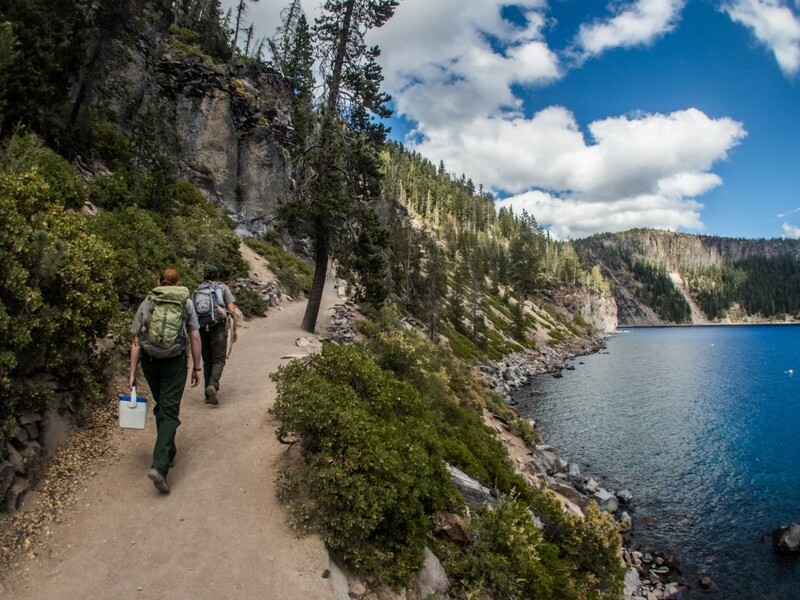 Thursday, August 25th, also marked the official date of the NPS Centennial. I could not think of a better to celebrate the Centennial than by spending the day diving in the kelp forests of Channel Islands National Park, all while taking part in the longest established monitoring program in the National Park Service! 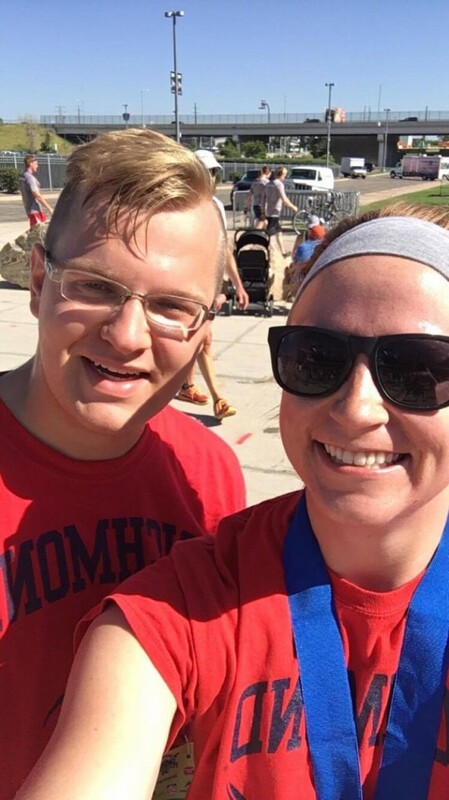 So while parks around the country were celebrating the Centennial with big parties and special events, we celebrated the best we could…by baking cookies! 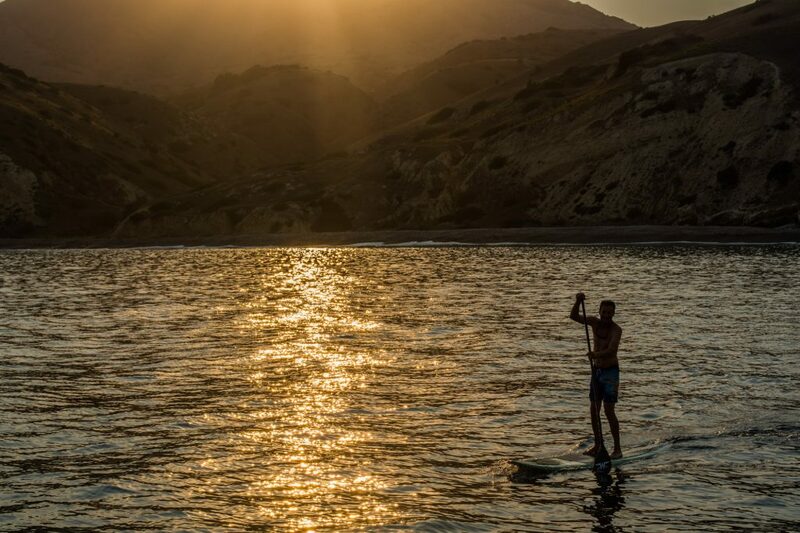 Captain Keith jumps ship for a sunset SUP session. Friday came all too quickly. Unfortunately, I had to sit out of the last day of diving because I was flying out of LA the following morning. 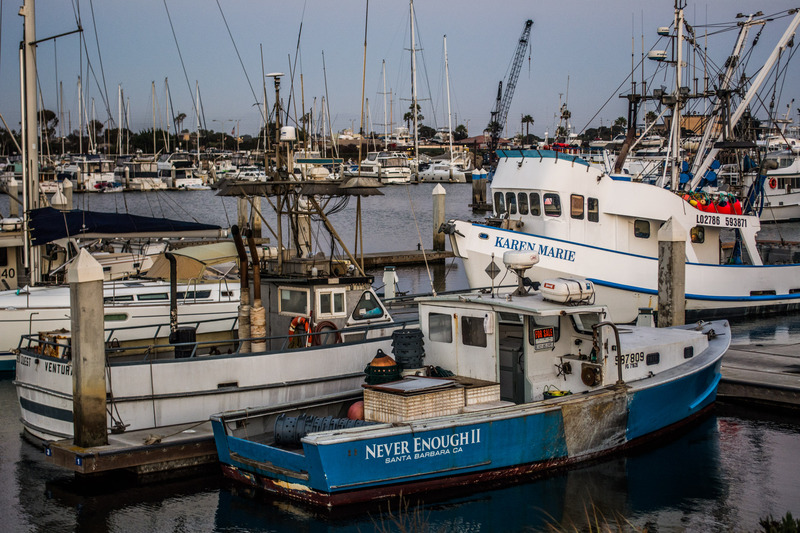 That afternoon, we made our way back to Ventura Harbor and unpacked the boat from long week in the field. After saying goodbye to the KFM crew, I stayed overnight on the boat before catching an early morning shuttle to begin my weekend of travel to my next destination: Kalaupapa! All packed up and ready to head back to the harbor. I had an absolute blast diving with the KFM crew and living on board the Sea Ranger II! I really have to commend the crew for the commitment they show for their work. I have to admit that that one week exhausted me. And to think they do it dozens of times in a summer season! I also want to extend the sincerest of thanks to the entire crew for welcoming me into your family for the week and for incorporating me into such an important monitoring program! Another huge thanks goes out to Parker and Josh, who let me borrow their cameras when I flooded mine. (Without them, this would have been a pretty borring blog.) I had such a fantastic time! I’ll definitely be back! 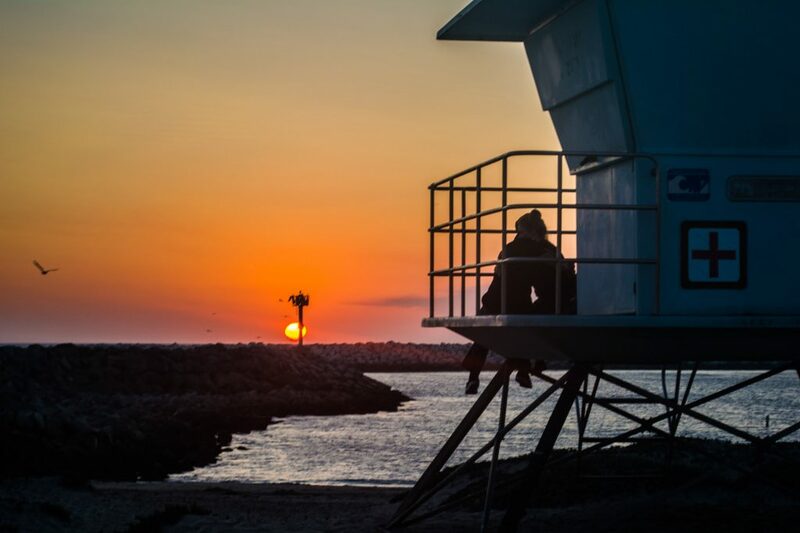 Sunset on the beach in Ventura Harbor. This entry was posted in 2016 National Park Service, Current Internships on October 9, 2016 by Garrett Fundakowski. When I landed in Honolulu on the night of Friday, August 12, it was great to be greeted by the familiar face of SRC Archaeologist Jessica Keller. As we drove to where we’d be staying, Jess and I had a chance to catch up on how things had been going for the past two months. 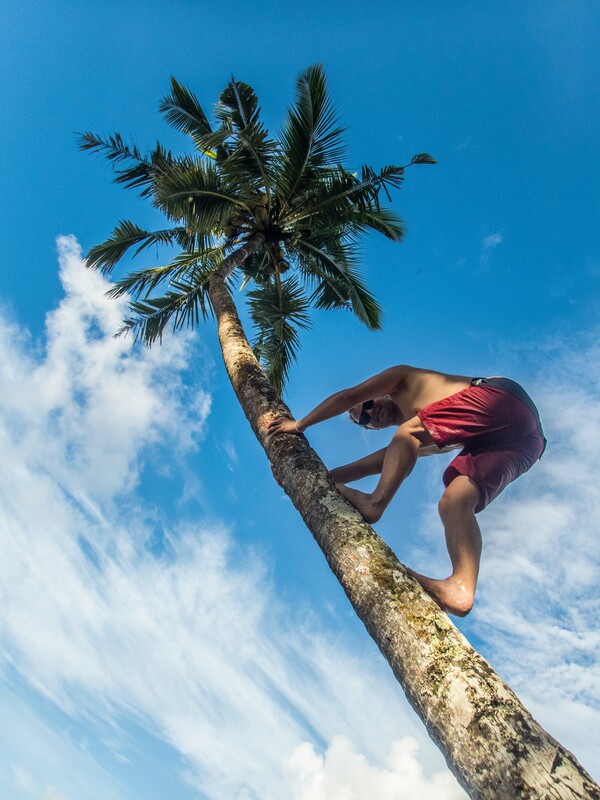 It was clear that I hadn’t been the only one having fun traveling the country and diving. 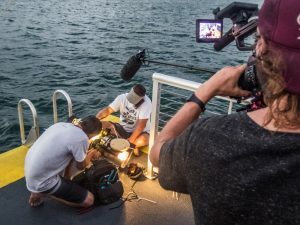 After working with minority youth in Biscayne National Park to document a shipwreck with the Youth Diving With a Purpose program and a trip up to Grand Teton National Park for her EMT-B refresher course, she arrived in Oahu last week to help Brett out with a documentary filming project on the USS Arizona Memorial. 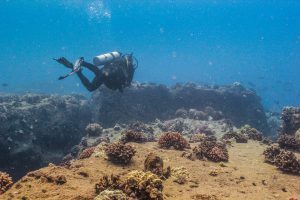 When prompted about how her first dive went on the shipwreck that sparked her interest in marine archaeology, she struggled to find the words to describe the experience. Her response made me that much more eager for the week ahead! The following day, Brett, Jess, and I headed over to Pearl Harbor to get some underwater filming done, but first we needed tanks. As I am not a federal employee, I couldn’t get on to the joint Navy-Air Fore Base where the park gets their tanks, so they dropped me off at the Pearl Harbor Visitor Center to wander the museum exhibits and displays. Outside, missiles, bombs, anti-aircraft artillery, and other artifacts were on display along an interpretative walking tour route that paralleled the harbor. I stopped at the Waterfront Submarine Memorial and walked past the anchor from the USS Arizona on my way to the galleries, Road to War and Attack. Timelines and newspaper clippings pieced together the events that lead up to the Attack on Pearl Harbor, while personal possessions, hand-written letters, and other artifacts brought life to those that were there that day and dioramas, photographs, and audio-visual recordings evoked a series of emotions from those of us not present on December 7, 1941. I am really glad that I got the opportunity to walk through the galleries prior to my time out on the memorial in order to gain a deeper understanding of the significance of the work we would be doing that week. 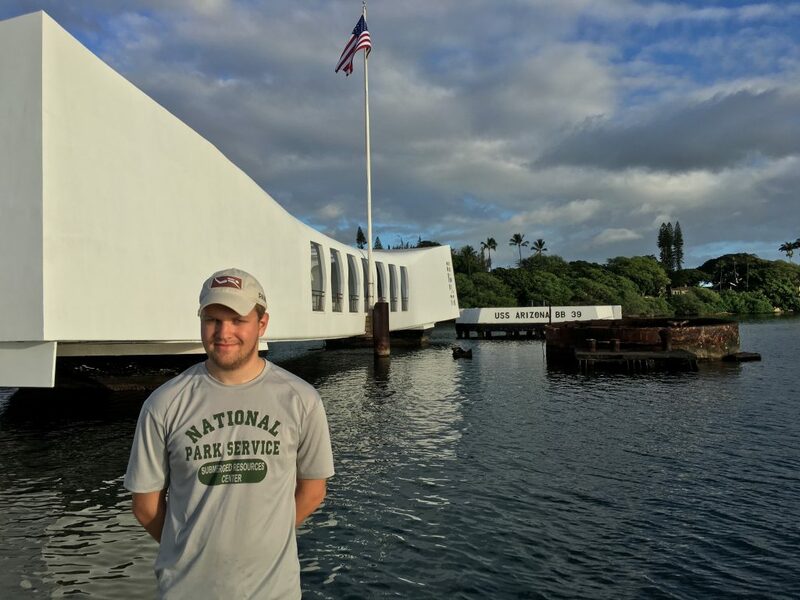 When Brett and Jess arrived with tanks, we met up with Scott Pawlowski, Chief of Cultural and Natural Resources for the monument, and headed over to the USS Arizona Memorial. As we approached the memorial, the American flag fluttered in the wind. 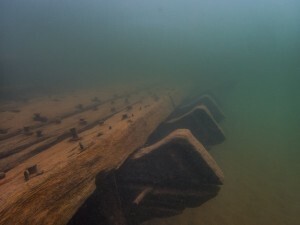 Pieces of the ship were visible protruding from the surface of the water. 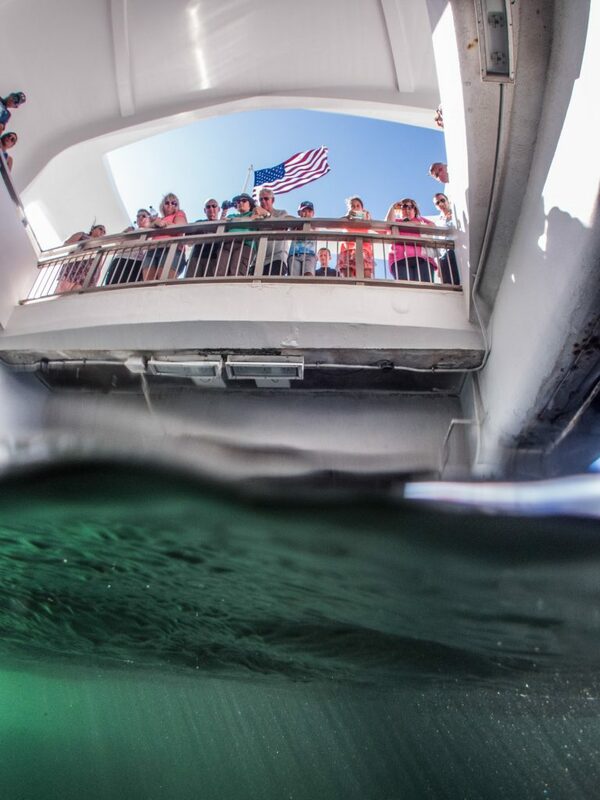 The modern memorial straddled the mid-deck of the USS Arizona, like a bridge, connecting the past with the present. 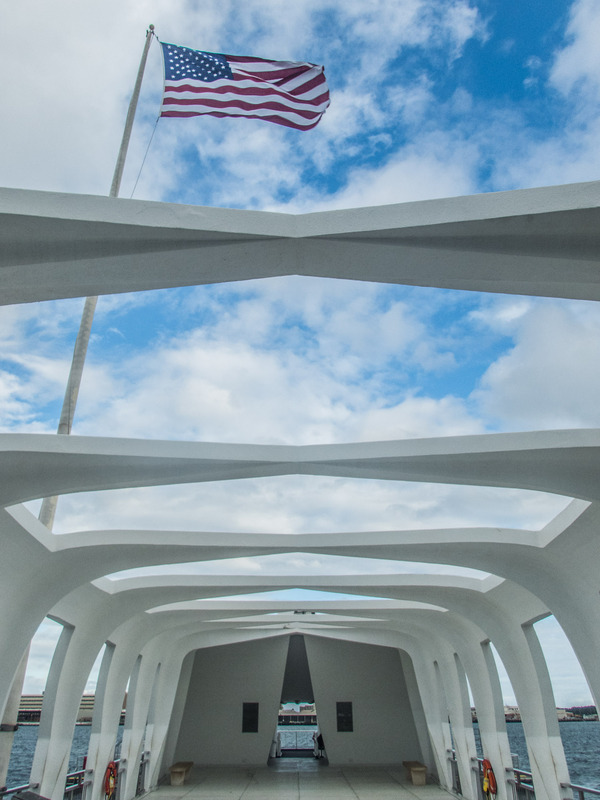 Its sleek white design gave the memorial an air of serenity while still demanding solemn respect. The USS Arizona Memorial straddles the mid-deck of the ship. Inside, the entry opened up to the assembly room with a series of seven windows on either side, reminding visitors of the date of the attack, and allowing viewers to look out toward the bow or the stern. 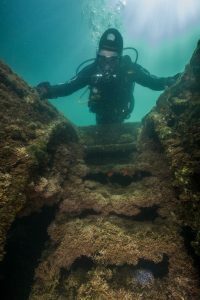 A viewing well cut through the floor offering a view of the sunken decks that sit just below the surface. 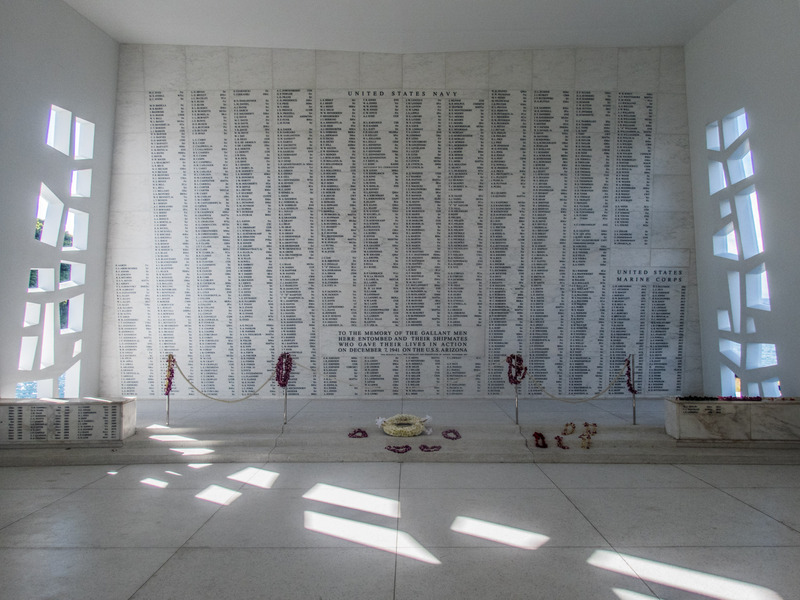 At the far end, a marble wall bore the names of the 1,177 sailors and marines who lost their lives on the USS Arizona during the Japanese surprise attack on Pearl Harbor. Leis and flower arrangements lined the floor, placed by visitors and family members to offer their respects for the fallen. With nothing to give, I sat on the floor of the shrine and read off each individual name engraved on the wall as my way of paying tribute to the men who lost their lives that day. The United States flag flies high over the memorial. 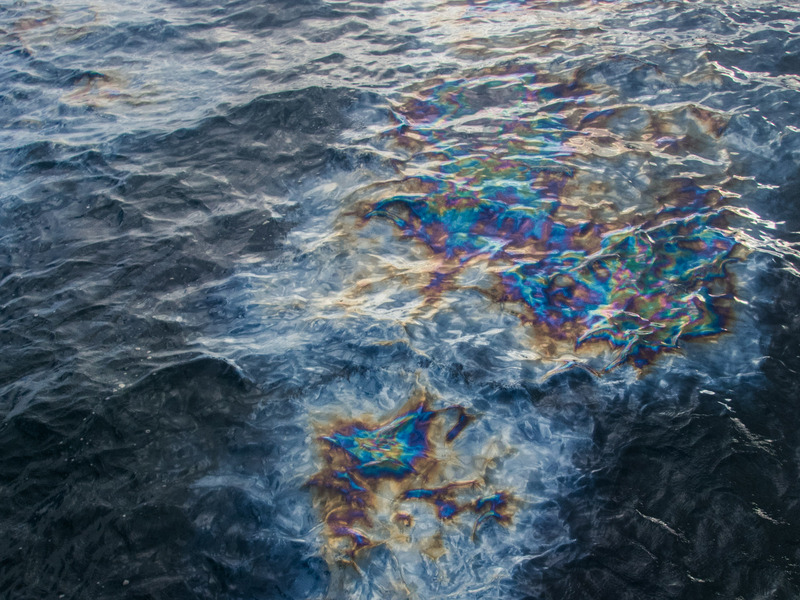 Drops of oil, considered the tears of the fallen, continue to trickle out of the vessel and leave a colorful slick on the surface under the memorial. Back on the dock, we geared up for our dives. Brett and Jess were going to dive the stern of the ship to film some video clips, while Scott was going to lead me around the ship on an orientation dive. With a full-face mask communications system, Scott was able to talk to me as we swam around the ship’s main deck. Below the surface, the water was murky and the visibility was barely 10 feet. 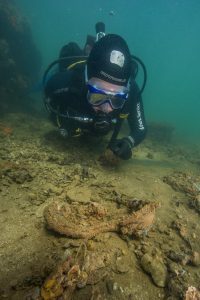 When the ship finally emerged into view, I was filled with a reverent sense of awe at seeing the famous vessel up close and underwater, a perspective few people get to experience. Brett follows Jess as they head to the stern of the ship, disappearing into the murky water. Bowls, light bulbs, Coca-Cola bottles, a shoe, and a cooking pot were scattered across the deck. Once used by those who called this vessel home, they sit there today in the same place they have been sitting for 75 years, now overgrown by algae and coral. We peeked into the open portholes, into the rooms of admirals and first class officers, into the past. I could visualize a sailor in his room – the rotary phone on the desk, the open dresser, the mirrored vanity cabinet above the sink – but a thick layer of sediment covered the floor and a fish swam casually in the cabin. An old shoe sits untouched on the mid-deck, recalling the past lives of the crew of the USS Arizona. Peering down into an open hatch, it’s easy to imagine the hustle and bustle of the men who called this ship home. Brett peeks into a porthole, illuminating the former sleeping quarters for one of the crew members. Corals and various algae have overgrown the old wiring on the deck. 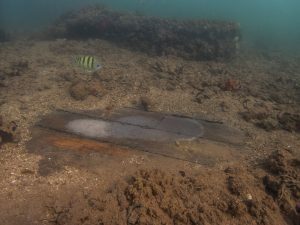 In some places the floorboards of the deck are still visible, offering a glimpse into the ship’s former condition. 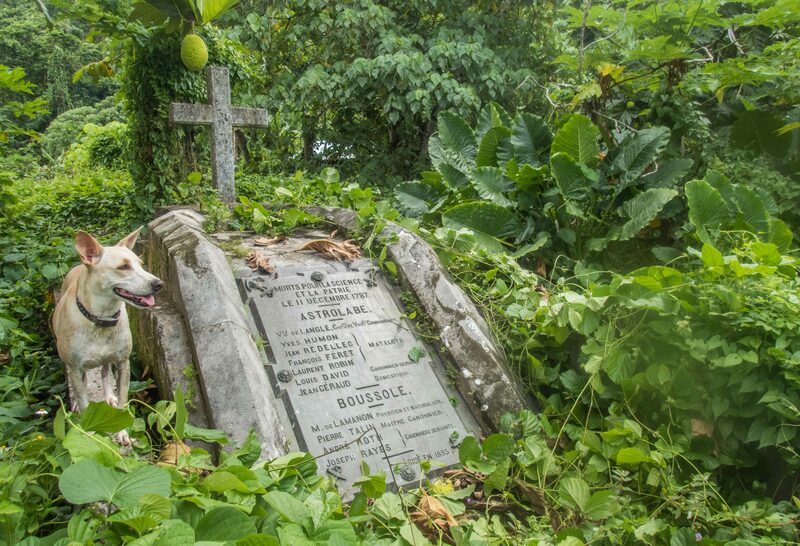 One can’t help but notice the remarkable juxtaposition between life and death. 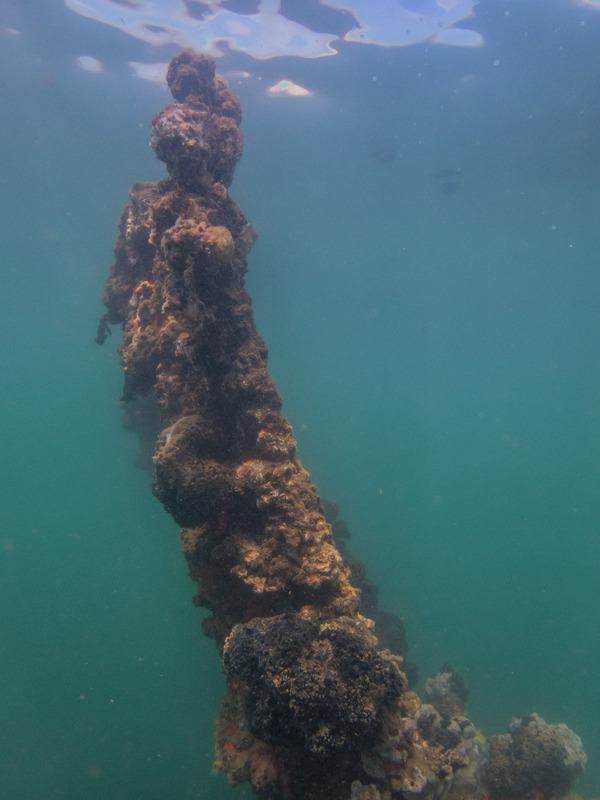 Home to a plethora of marine life, the USS Arizona has become a part of the natural ecosystem. 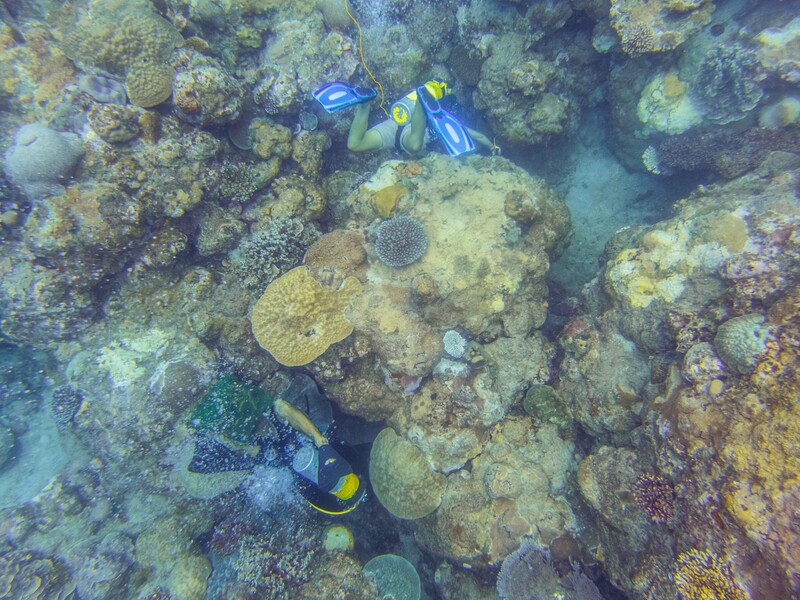 Fish swam amongst the corals. 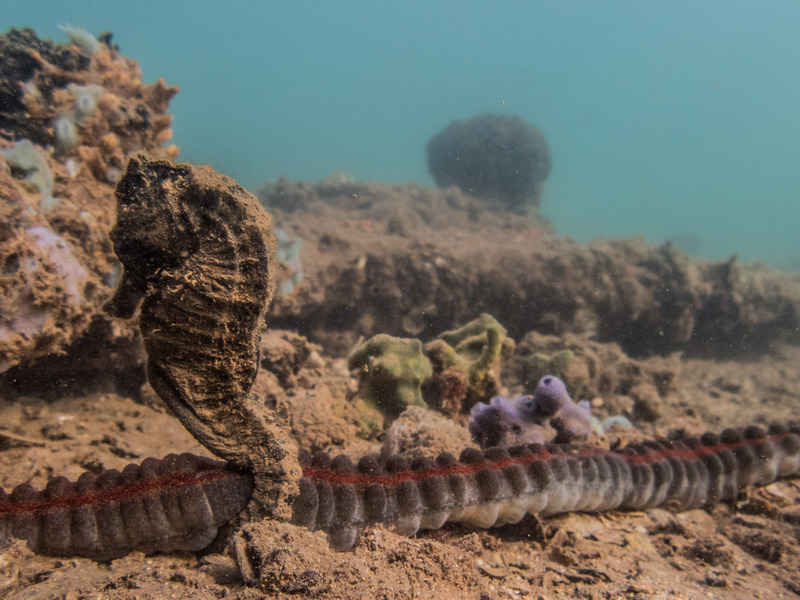 A seahorse hung on to a sea cucumber for support. Sponges and feather duster worms lined most metal surfaces. As we continued to make our way towards the bow of the ship, the forward guns from turret No. I began to materialize. Staring down the three 60-foot barrels as they disappeared back into the muddy water offered a glimpse of the formidable capability of these powerful machines. Further forward, the deck suddenly dropped out and the steel hull peeled back like a banana. Known as the blast peel, this was where the bomb pierced the battleship within the first few minutes of the surprise Japanese air raid. I couldn’t begin to imagine the devastating power it took to rip apart inches of solid steel like paper, but seeing the chasm in the body of the ship and the scattered shrapnel made the tragic events of December 7 more tangible. Scott swims through the blast zone. Despite this, I came up from the dive renewed. 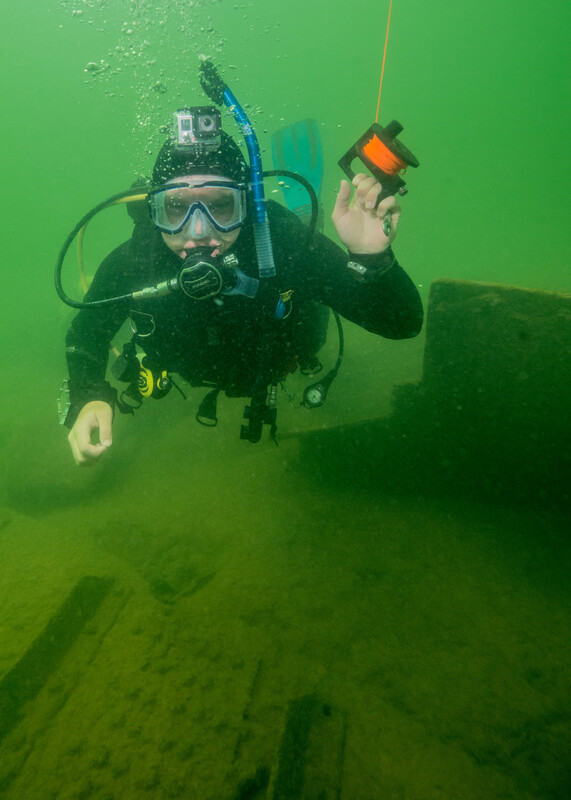 I felt honored to have been given the opportunity to dive on such an important piece of American history and I was filled with a sense of excitement for the work week ahead. My first dive on the USS Arizona! Over the course of the week, I got to be a part of the large-scale collaborative research operation coordinated by Brett and Scott. Collectively, they brought together an extremely qualified international team of engineers and scientists and hundreds of thousands of dollars of equipment in an effort to learn more about the USS Arizona. With the goal of evaluating the condition of the shipwreck, the operation had several components. Early in the week, eTrac Inc. came out to the memorial in order to map the exterior of the ship. 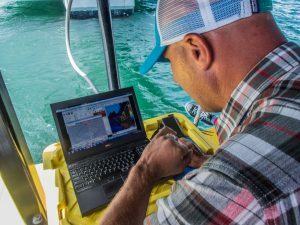 Specializing in hydrographic surveys, Mike and Greg of eTrac Inc. brought out a Remotely Operated Vehicle (ROV) with onboard multibeam and sidescan sonar systems to do the job. 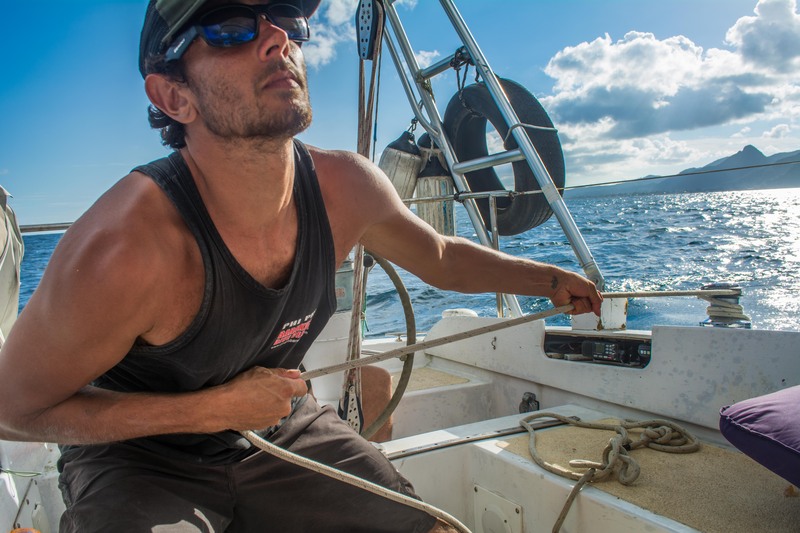 From land, Greg maneuvered the small inflatable catamaran with a remote controlled motor. Watching the live feed of the sonar data appear on his computer, Mike guided Greg as he made his passes over the shipwreck, making sure there were no sections of the vessel left unscanned. After post-processing the data, to account for wave action, wind speed, etc., the generated data will be compared to the data from a previous scan in order to see if there have been any major changes in exterior structure of the wreck. 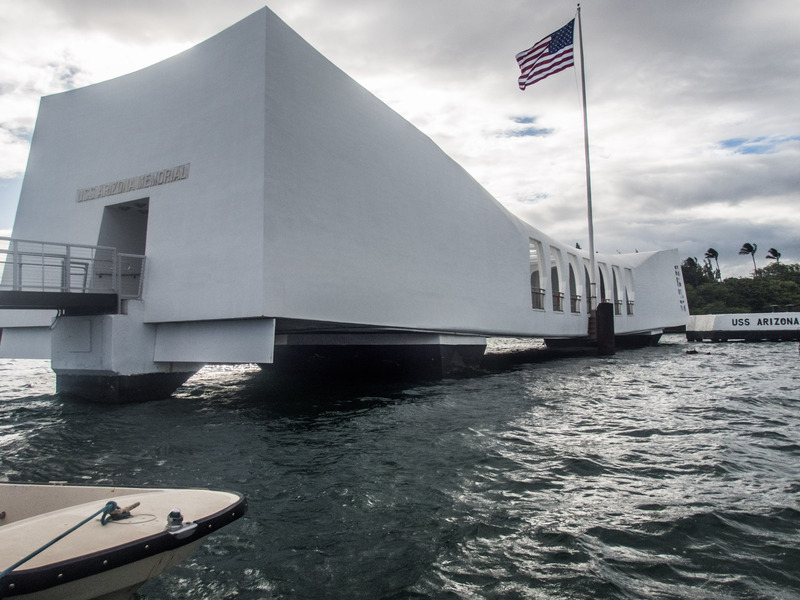 While, no visible structural collapses have occurred, the USS Arizona has a slight tilt to port and any change over the last few years could be calculated by comparing the data sets and would be pertinent to know for maintaining the structure and memorial. 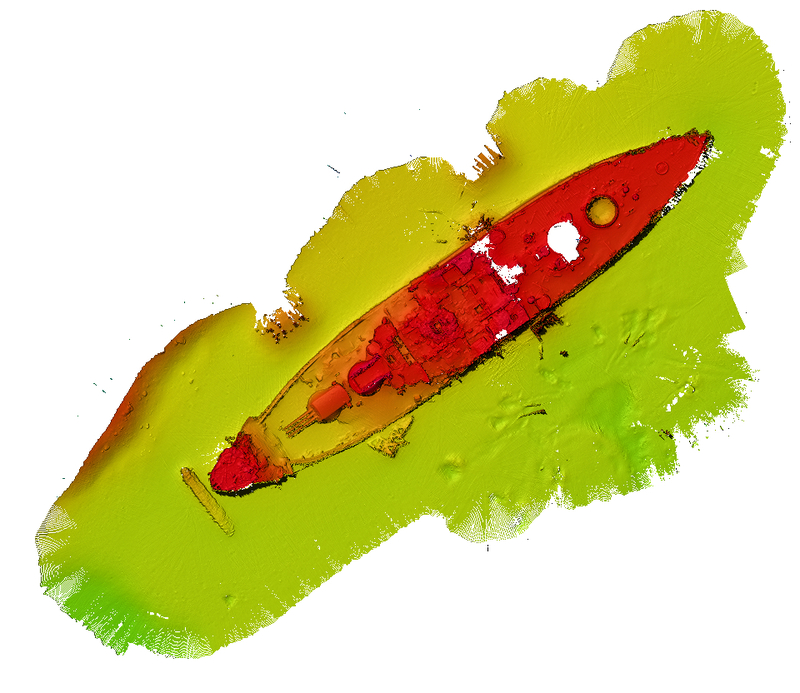 Preliminary image following post-processing the sonar data. This gives you a great view of the layout of the ship (bow is bottom left). The light yellow area below the red of the forward guns of the No. I turret is approximately where the bomb impacted the ship, exploded, and brought it down. 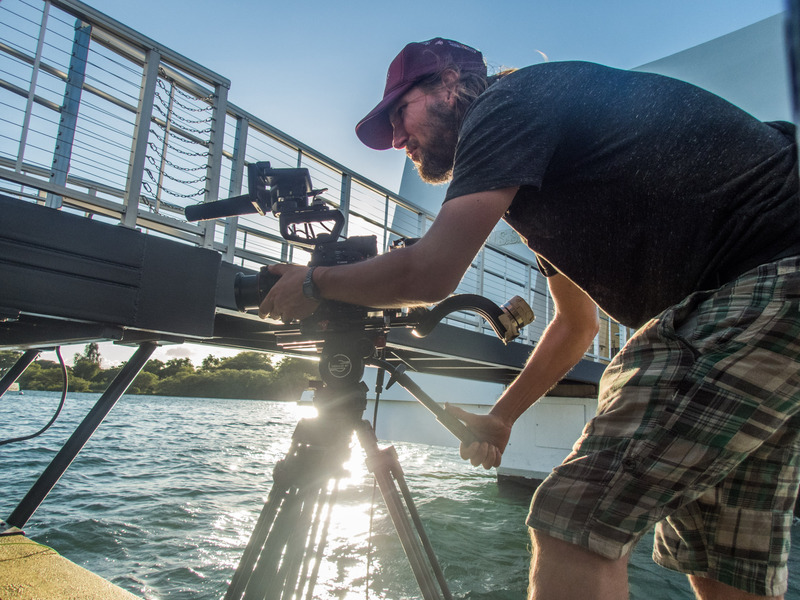 Mike and Greg operate a catamaran that carries the sonar equipment with a remote control while Brett films. 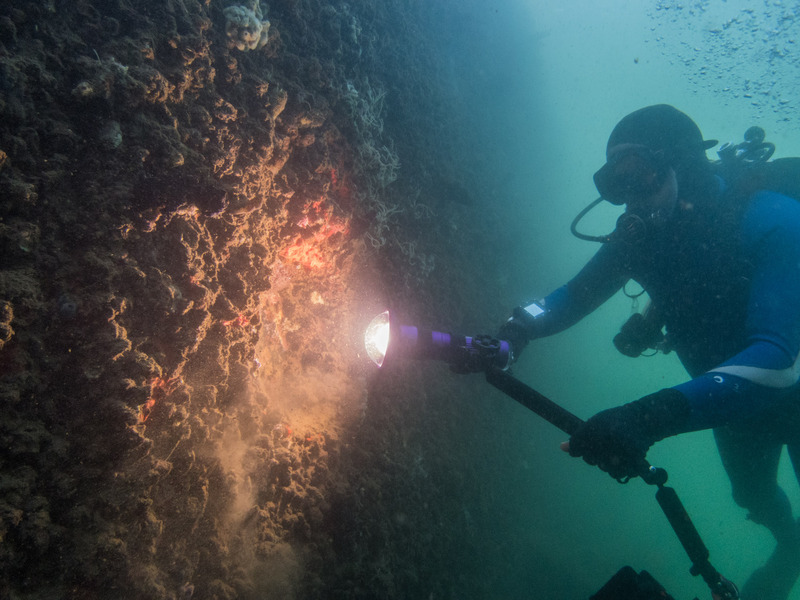 Mike looks at the data collected from the preliminary pass of the shipwreck. Multiple passes are required for the most accurate data. Dave Conlin flew into town on Wednesday and brought with him two water quality sondes for some sampling both inside and outside the wreck. 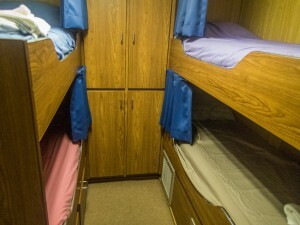 With significantly different conditions, such as decreased light levels and reduced water flow, the interior of the ship would be expected to have different water chemistry than the exterior of the ship. From this data, underwater archaeologists like Dave and Jess, could estimate the corrosion rate of the structure as a whole as well as note any differences between the interior and the exterior structures. 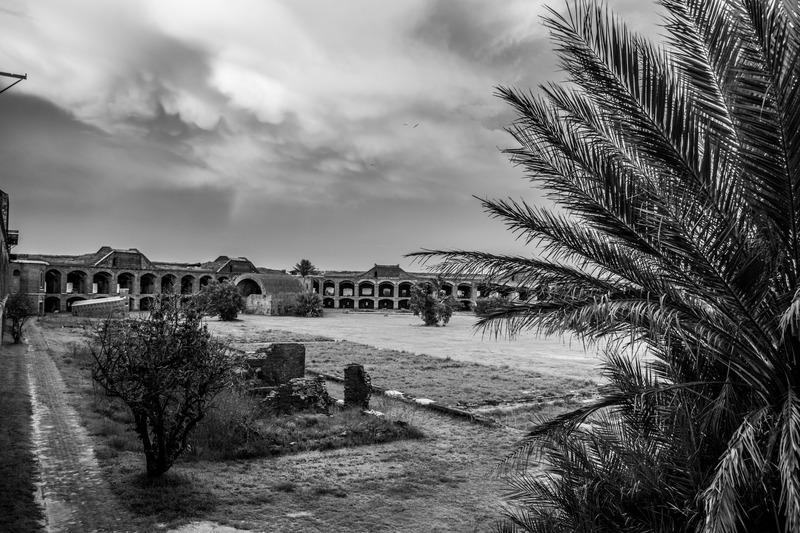 This data is extremely important for the protection of this historic place and will provide information on how best to preserve it so that future generations can continue to visit and pay their respects. However, in order to first get the sonde inside the ship, Dave enlisted the assistance of Amanda and Sam from Deep Trekker and their portable ROV. About the size of a basketball, Deep Trekker’s ROV could easily fit in some of the open hatches on the main deck. From the dock, Dave and I watched over Sam’s shoulder as she directed the ROV, equipped with a 270-degree camera, towards the shipwreck via a handheld remote control. After a few tries, she managed to maneuver the ROV and sonde down the hatch to the 3rd and a few meters into a passageway. The sonde was then left to collect data for a few days, along with the one on the exterior. 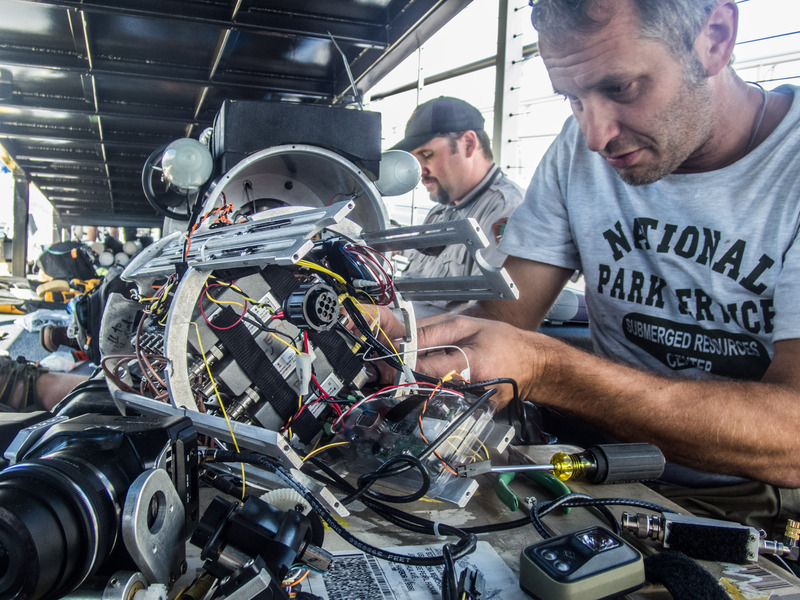 Together, Dave Conlin with the NPS and Sam with Deep Trekker launch an ROV. 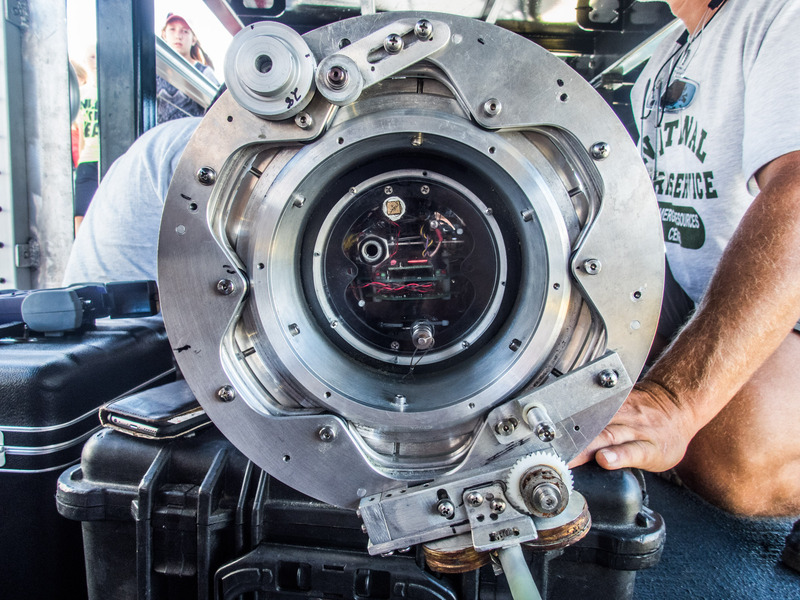 Deep Trekker’s ROV examines the hatch before descending. The next day, Scott brought USS Arizona survivor Don Stratton and his wife out to the memorial. He is one of the 5 living survivors remaining. Before he walked onto the memorial, he stopped and saluted his fallen crew. Then the crowd parted, let him pass, and erupted in applause. He continued making his way to the shrine room, stopping to salute the ship every few feet. When he entered the shrine room, the memorial fell silent. He scanned the wall of 1,177 names. These names meant more to him than to any of us in the room. They were his crew, his friends, his family. 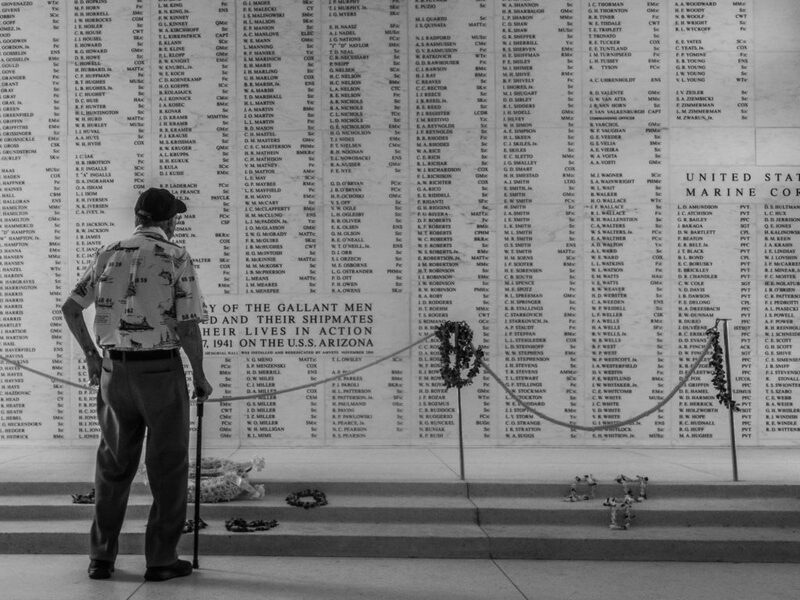 Don Stratton, 94, stands alongside the 1,177 names of his shipmates from the USS Arizona who died on Dec. 7, 1941 during the attack on Pearl Harbor. When he stepped away, we escorted him back to the Ranger Room where he and his wife took a seat and talked for a bit with Brett and I. We talked about the weather, the flight, his kids and grandkids. I described how it felt to dive on his ship and he told me the story of how he survived, climbing hand over hand across a length of rope suspended over the fire to a nearby ship, his body covered in burns. Before he left, Brett explained to him the project the NPS was working on and invited him to come and watch when we were going to send the ROV into the USS Arizona. He was excited for the opportunity to get to see his ship again. 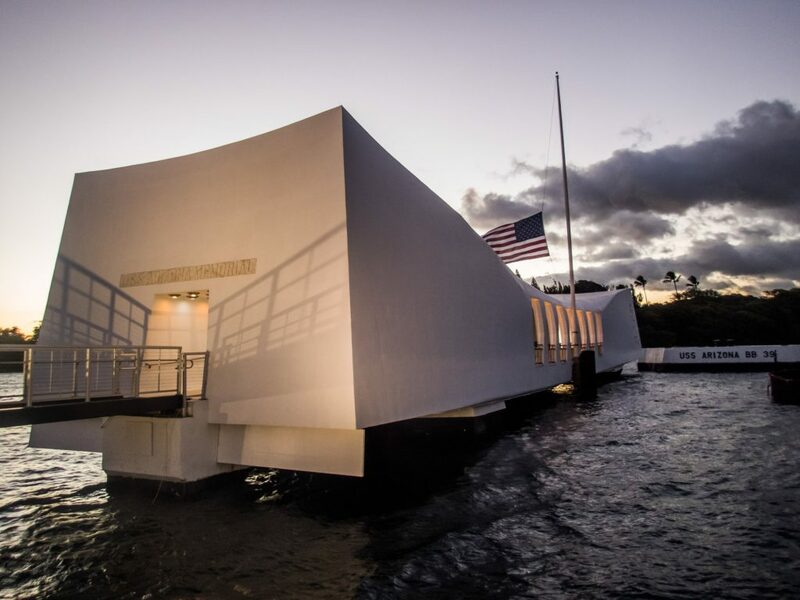 As we shook hands, a solemn feeling of honor rushed over me as it finally set in who he was and what the USS Arizona and December 7 means to him. It was absolutely delightful to meet and talk with Don. 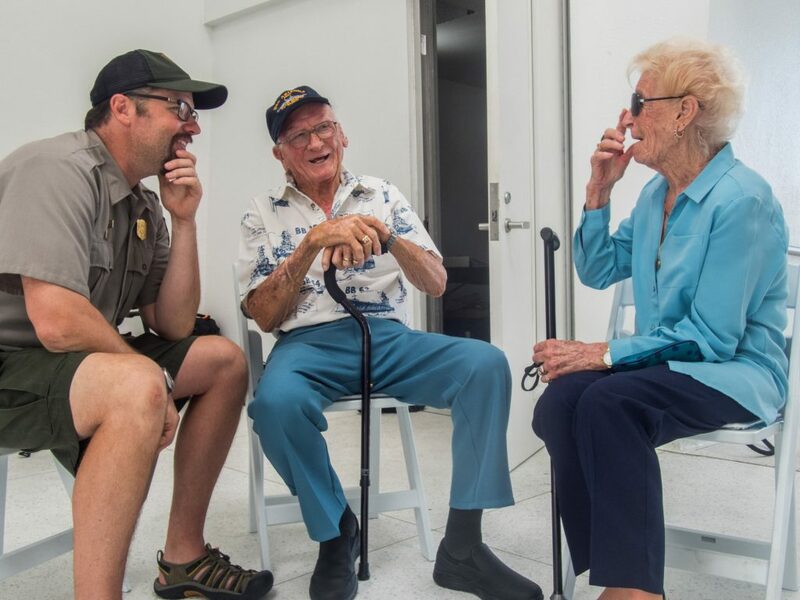 Brett converses with Don Stratton and his wife about the work the NPS is doing here at the USS Arizona. On Friday, the main attraction arrived to the dock. 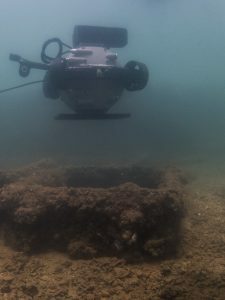 Specifically for this project, Brett had commissioned the Woods Hole Oceanographic Institute (WHOI) and Marine Imaging Technology (MITech) team of Evan, Marianne, Billy, and Mike to build a custom ROV to penetrate the USS Arizona. Previous expeditions into the battleship with ROVs had been limited because of the problem that arose from pulling a tether (the wires and cables required for operation) behind the ROV. Imagine walking around your house with the garden hose. Inevitably you have to yank on the hose because it gets caught on the corner of the house. Similar scenario here, other than the yanking can damage the tether and the shipwreck itself. 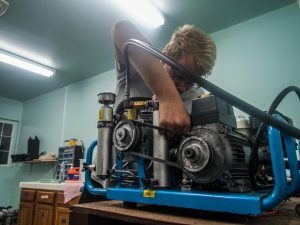 To avoid this issue, the WHOI team designed the first ever self-spooling ROV – meaning an ROV that can carry its tether with it and drop it as it goes, much like a trail of breadcrumbs. 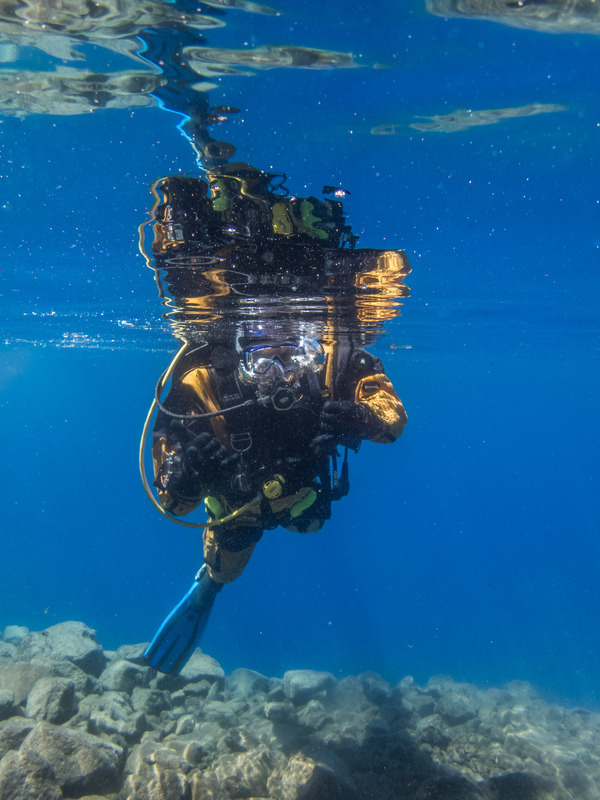 The custom-built ROV was designed to be self-spooling in the hopes of allowing it to penetrate further into the shipwreck than anyone has ever been or seen before. Unfortunately, during the in-water test, various technical difficulties presented themselves. Quick fixes on the deck would correct one problem but cause another. The cameras didn’t rotate, the lights didn’t turn on, the thruster wasn’t working, and the buoyancy was not quite right. Finally, after a few rebuilds and more in-water tests, it appeared that the WHOI team would be spending all night attempting to locate and fix the problem. 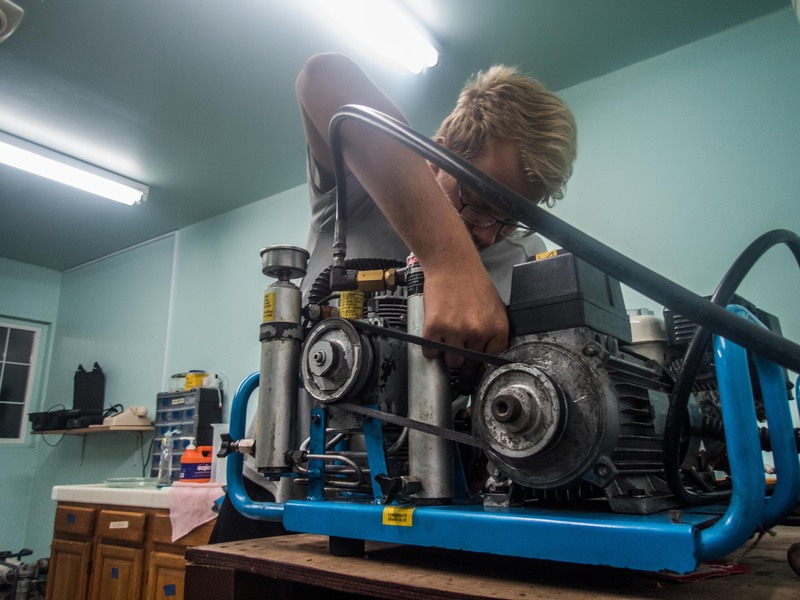 Evan rewires the ROV to fix the problem encountered during the first float test. Evan and the WHOI / MITech team prepare for the second float test with Brett in the water filming. As you can see, the research operation was quite complex. 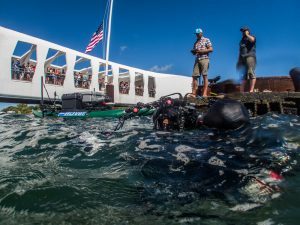 To add icing to the cake, a production team from Story House Media Group was filming all of the week’s proceedings for a PBS documentary they will be producing for the 75th Anniversary of the Attack on Pearl Harbor which will air on November 23. Storyhouse Media Group filming the Park’s research operation for an upcoming PBS documentary. 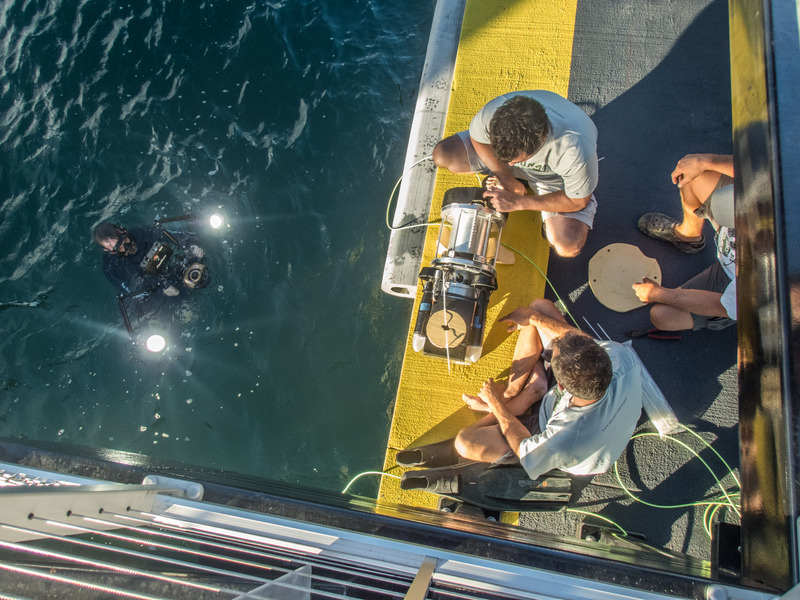 Filming the WHOI / MITech team troubleshooting the ROV after the failed float test. 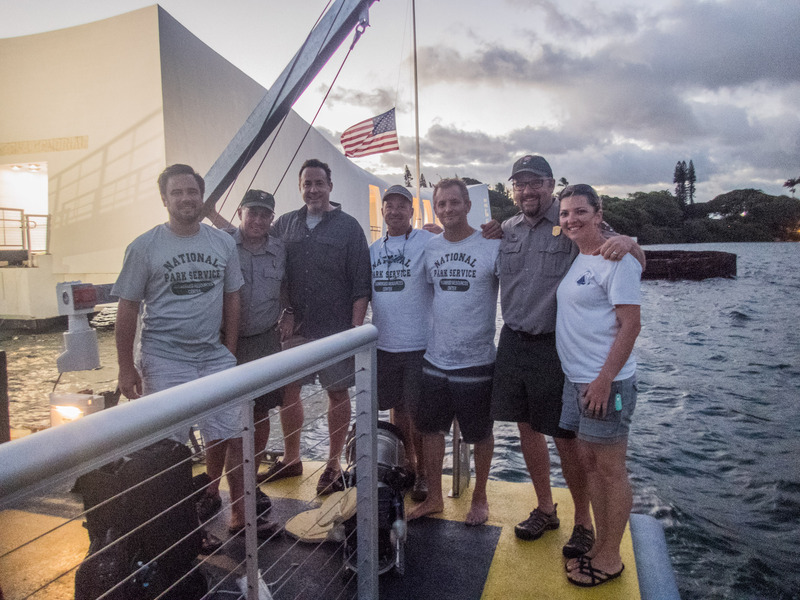 I would really like to thank my SRC family – Brett, Jess, and Dave – and Scott Pawlowski for diving with me and sharing with me your passion for the history of the USS Arizona. Thank you also to Brett’s wife, Elizabeth, and their kids, Chase and Cameron, for keeping me updated on all the Olympics happenings I missed while we were at work. And a big thank you to WHOI, eTrac, Deep Trekker, and Story House crews who welcomed my inquiries and got me involved in the entire production. This was truly a unique experience! Brett, Dave and the WHOI / MITech team. 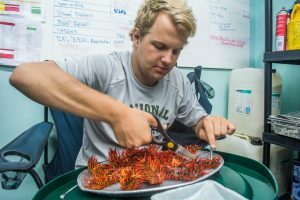 This entry was posted in 2016 National Park Service, Internship Journeys on September 29, 2016 by Garrett Fundakowski. Brett and I made it back to Denver on Friday, July 29th. 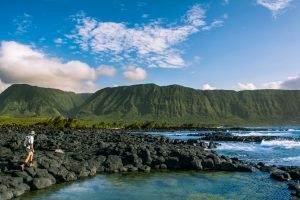 In Wisconsin, plans had changed and my visit to Kalaupapa had been pushed back, leaving an opening in my schedule for the following two weeks. Graciously, the Conlin’s and their ever-energetic dog Luc agreed to house me while we sorted things out in the meantime. Luc and I pose for a picture on our hike at Silver Dollar Lake with Dave and Michelle and their friends. 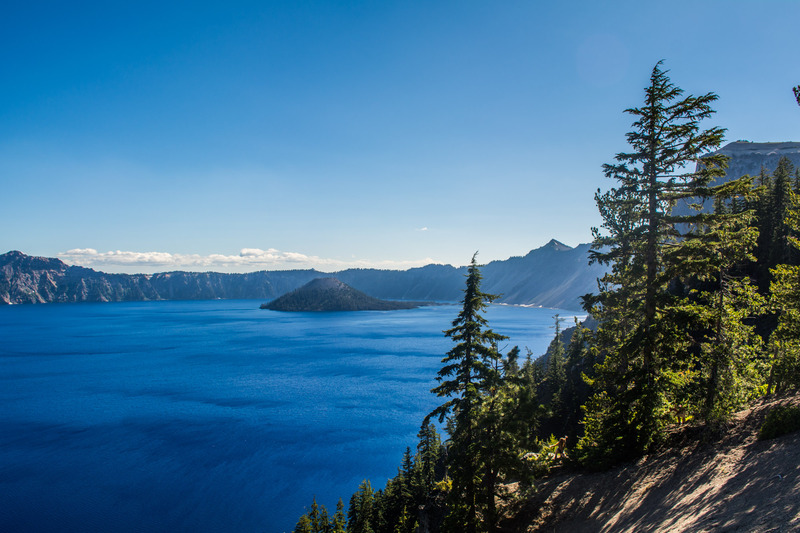 Brett reached out to a few parks and fortunately Crater Lake National Park (CRLA) had a monitoring project they could plug me into for that time. 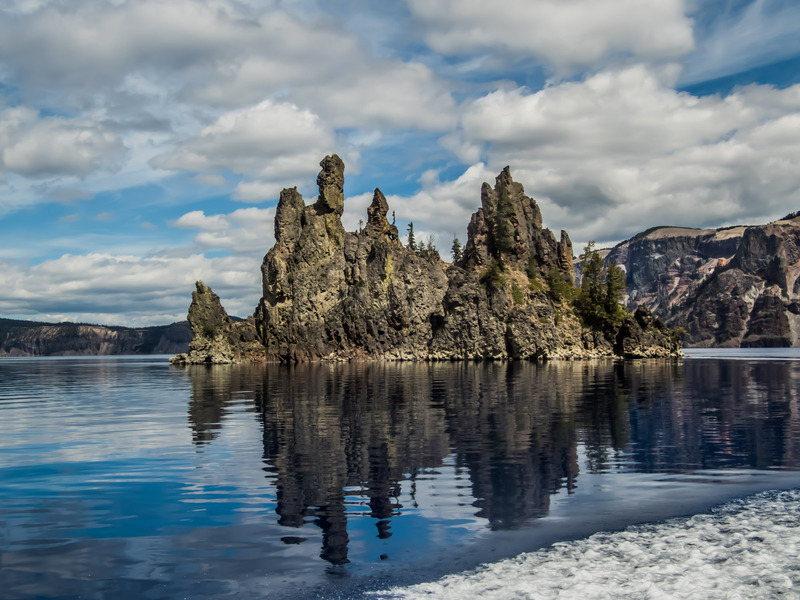 Only problem was that diving in Crater Lake necessitated the use of a dry suit, as water temperatures can get into the low 50’s/high 40’s. 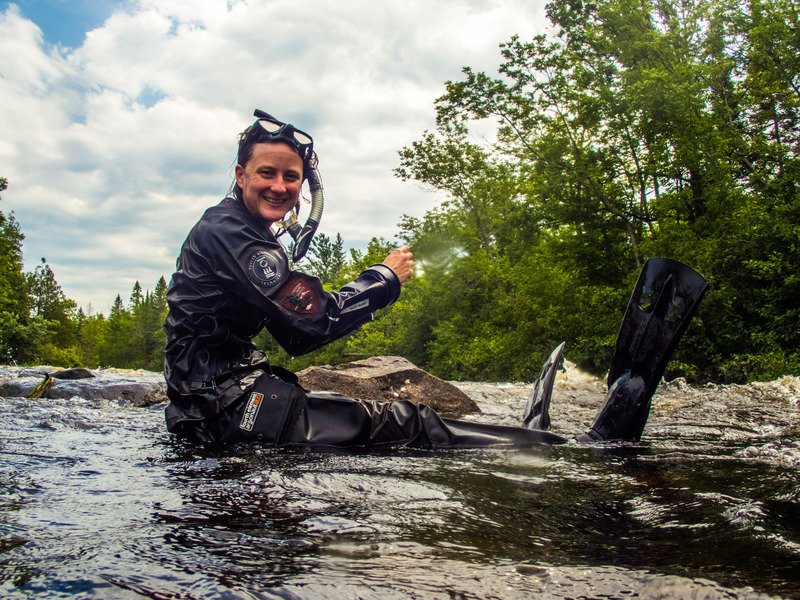 For my non-diver readers, a dry suit is different than a wet suit in that it maintains a pocket of air inside the suit with its tight wrist and neck seals, allowing the diver to remain dry and stay warm. However, this adds an additional pocket of air for a diver to worry about throughout the dive and thus requires additional training to use. 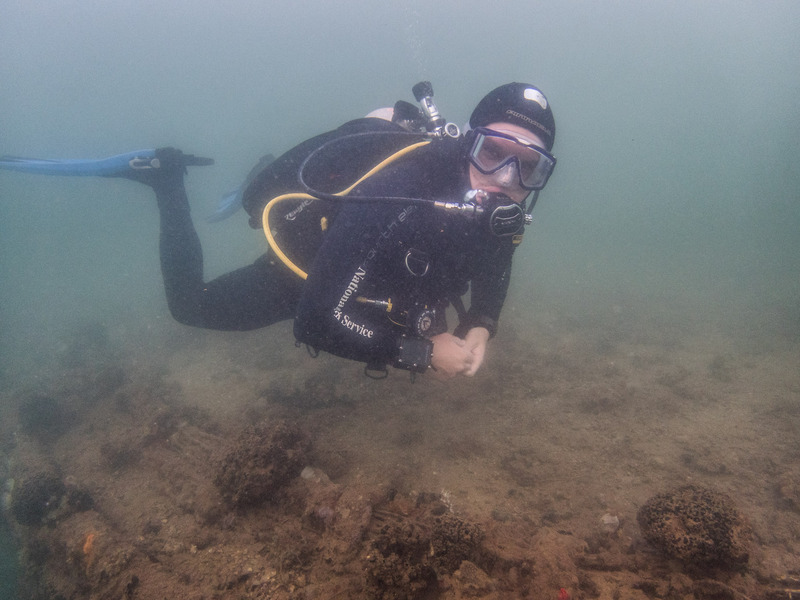 Since I have never used a dry suit before, I spent two days with Dave learning about the intricacies of diving dry and practicing the new skills in the local pool. 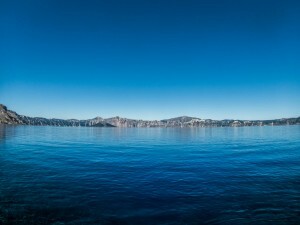 Dave said I picked it up quickly and looked great in the water, clearing me to dive dry at Crater Lake. That Wednesday, I caught a flight out of Denver to Medford, Oregon. After figuring out my first-ever car rental and stopping at the grocery store to pick up some food for the upcoming week, I got on the road and made my way to CRLA. 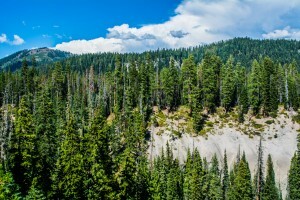 On both sides tall conifers towered overhead, intermittently opening up to spectacular views of neighbouring cliff faces and distant mountains. 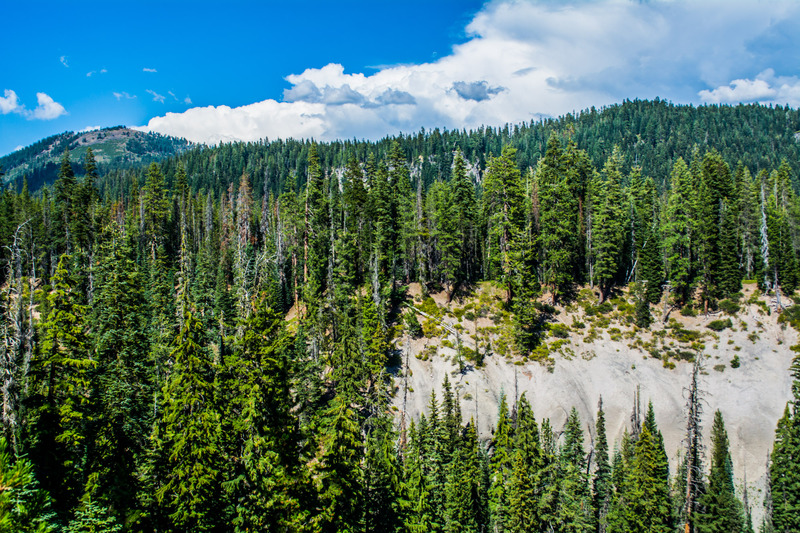 I had never been to the Pacific Northwest so I was reveling in the new eye-catching landscape surrounding me. After pulling over at every lookout on the highway to stop and gawk at the majestic scenery, I finally made it to the Crater Lake Science and Learning Center. There I met up with David Morris who gave me a quick tour around the facilities and showed me the nearby residence where I would be staying for my time at CRLA. 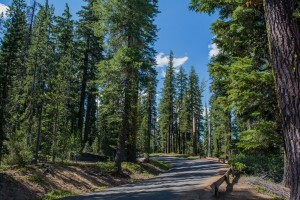 He also informed me about the Bybee Fire that was burning on the west side of the park, closing the West Rim Drive and a portion of the Pacific Crest Trail. While Park Headquarters had been placed under a Level 1 Fire Evacuation Notice, he told me that it merely meant “Be Ready” for a potential evacuation and that if an evacuation was necessary we would have plenty of notice. With that, I unpacked my bags and settled in. The following day, I made my way down to the Ranger Station to find Aquatic Ecologists Scott Girdner and Mark Buktenica. 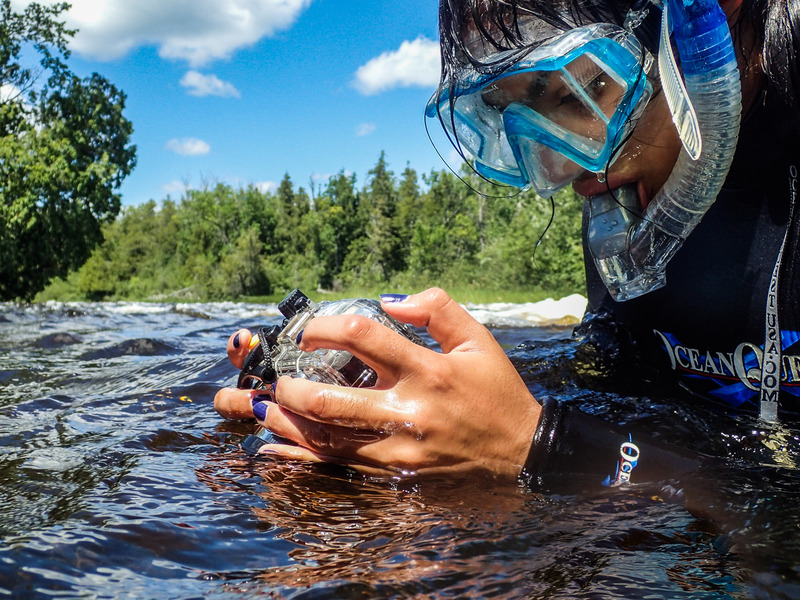 As we were going over the plan for my time in the park, we realized that my gear had most recently been used in Lake Superior, another body of freshwater, and were thus worried about the potential for the introduction of invasive species. That being said, my dive gear had to be decontaminated to kill any little organisms trying to hitch a ride to Crater Lake. Unfortunately, that put me out of diving for the day, but that didn’t stop me from joining them out on the water. With my gear soaking in a salt bath, Mark, Scott, and I, along with seasonals Kristin Beam and Sarah Moffit, set out for a busy day on the lake. The Lake crew has possibly one of the best commutes to work on the planet. Leaving from the office, we took a 40-minute drive along the East Rim. At the first bend in the road, I let out an audible gasp as the lake emerged from a gap in the trees. Tucked away at the base of the caldera, a large crater formed by the collapse of a volcano, sat a serenely smooth body of water. The lake was nothing like I could have imagined. It was so resplendent, so vast; yet in an instant it disappeared behind the rock face. In a wild game of hide-and-seek, the lake would come in and out of view as we made our way to the Cleetwood trailhead. 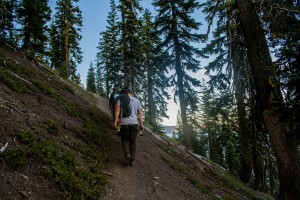 This mile-long trail serves as the only route to access the shore of the lake. So with our bags in tow, we hiked down, each switchback more picturesque than the last, until we had descended 1,000 feet and reached the water. Then we all hopped aboard the Nueston, the park’s primary research vessel, and motored over to the boathouse on Wizard Island to gas up and grab the dive gear. 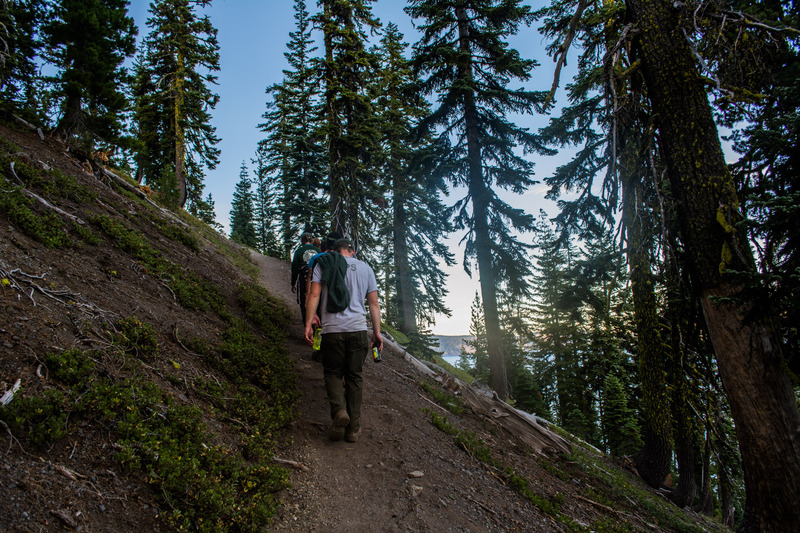 Hiking Cleetwood Trail is the last leg of the Lake Crew’s scenic daily commute. 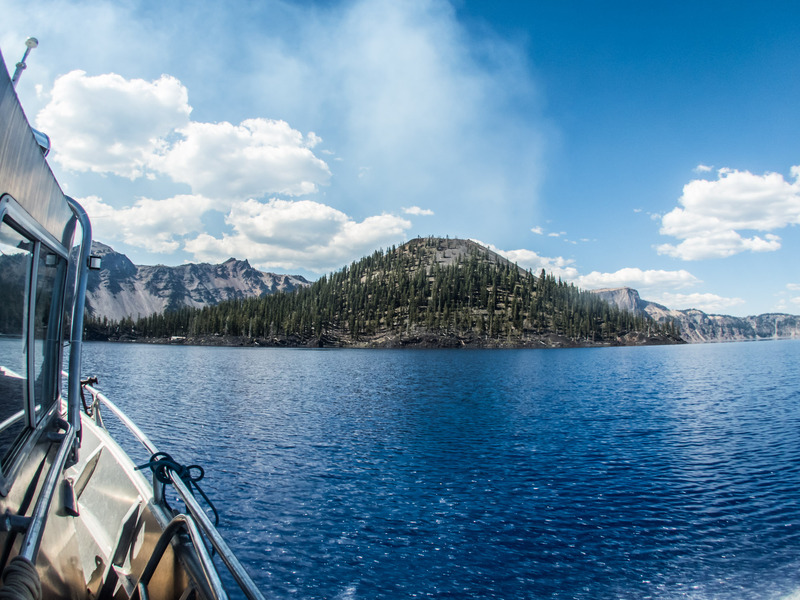 We pass by Phantom Ship, the smaller of the two islands in Crater Lake on our way to the boathouse on Wizard Island. The smoke from the Bybee Creek Fire appears to be coming out of the top of Wizard Island. 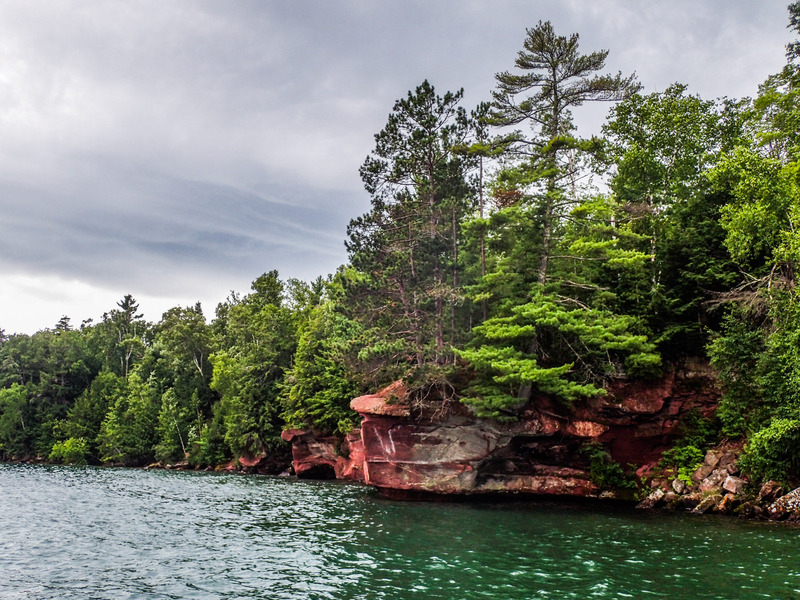 Out on the water, I could not stop marveling at the lake’s deep sapphire color. Soon the running joke of the trip became my dumbfounded response to “What do you think of the lake?” All I could mutter was “It’s just so blue.” The color comes in part due to the fact that there is very little particulate matter suspended in the water. 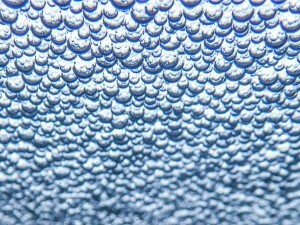 Isolated from any surrounding rivers or streams, the lake’s primary input is precipitation. 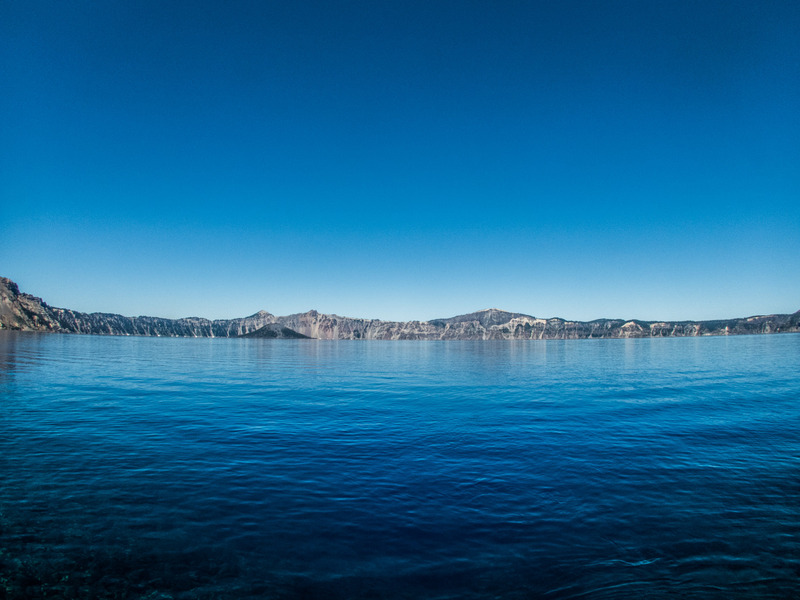 With no incoming streams to bring in sediments, organic materials, or chemical pollutants, Crater Lake is known for it’s exceptional clarity. With an average Secchi disk clarity reading of 30 meters or about 100 feet, it is by far the best visibility in any of the parks I have visited or will visit for my internship. In fact, the water is so clear and so clean that you can drink it. Anytime you wanted water, you would just dip your Nalgene into the lake and take a sip. It’s quite tasty too! 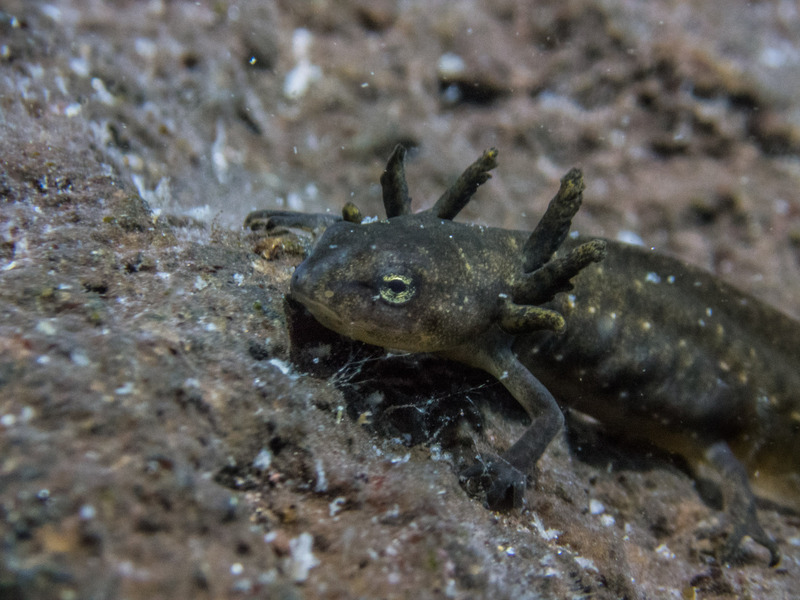 Even though my dive gear was being decontaminated back at the office, we stuck to the plan and began the benthic surveys to look for newts and crayfish in the lake. The surveys were 10-minute time-constrained surveys in which one would swim along, turn over rocks, and count the number of each species. 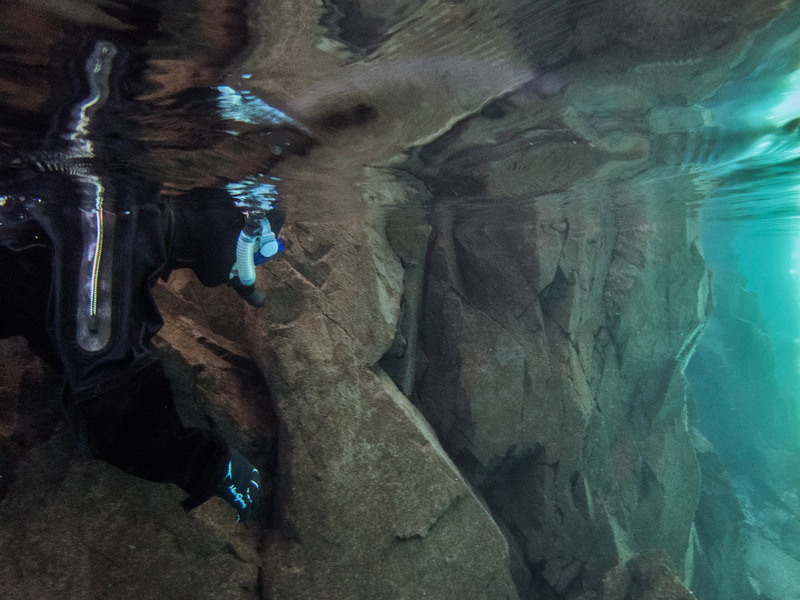 Mark and Kristin were up first, diving in to do their surveys at 60 feet. Obviously feeling bummed by having to sit the day out and extremely eager to get in the water, I jumped in anyway with just my bathing suit to see what it was like. Though, initially quite shocking, it was tolerable for a few minutes. But after my toes starting going numb, I hopped out. While we waited for them to complete their dive, Scott and Sarah filled me in on the background on Crater Lake’s unique aquatic ecosystem. Back in the early 1900’s, in order to bring greater recreation to the lake, six species of fish were stocked in the lake. 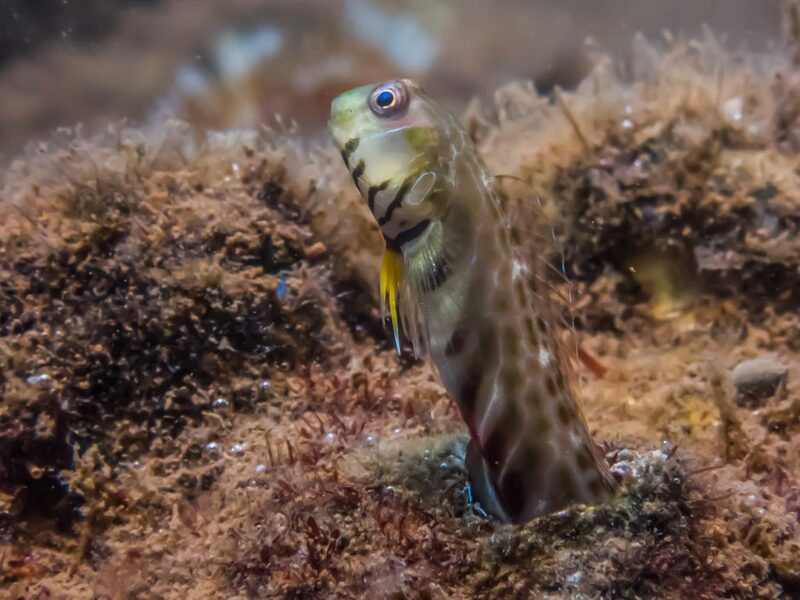 However, the fish populations soon crashed due to a lack of prey. 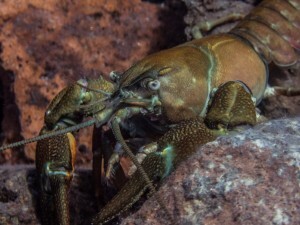 Thus, the signal crayfish (Pacifastacus leniusculus) was introduced in 1914 as food for the stocked fish. 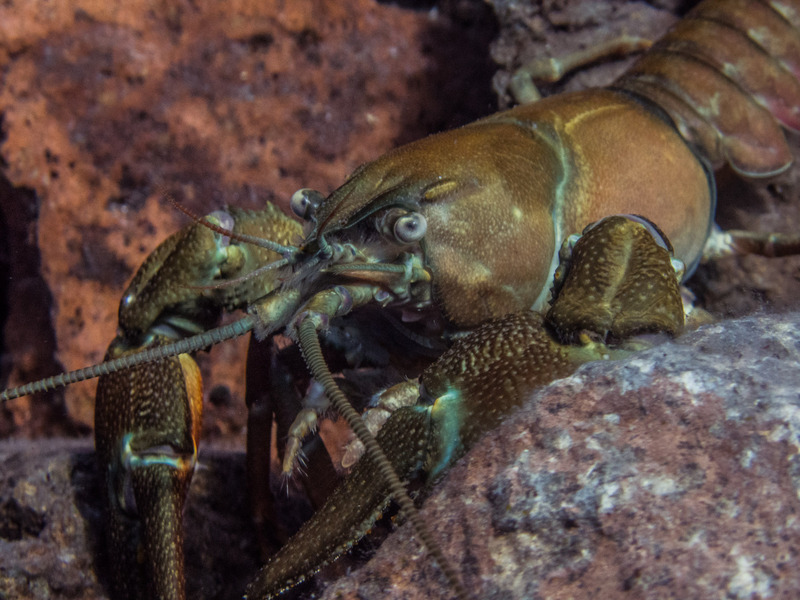 Nowadays, almost 100 years later, crayfish populations are booming and they have drastically expanded their territory along the shoreline. Unfortunately for the native Mozama newt (Taricha granulosa mazamae), a subspecies of rough-skinned newt only found in Crater Lake, the crayfish have proven to be aggressive competitors for both habitat and food. 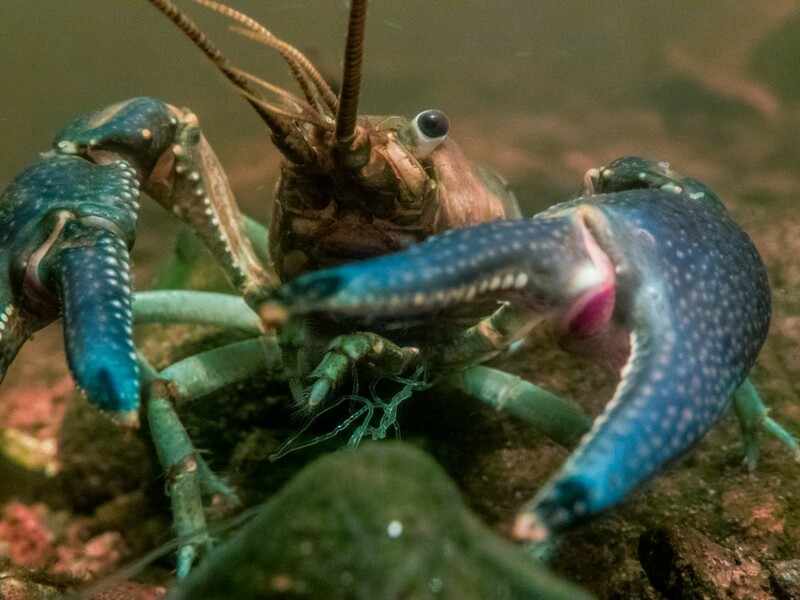 In fact, in areas of the lake were crayfish are present, the densities of benthic invertebrates, like the aquatic insects that compose the majority of the newts’ diet, have been found to be reduced by as much 80%. Additionally, in a series of experiments performed by the Park Service, crayfish were observed directly preying on the newts. 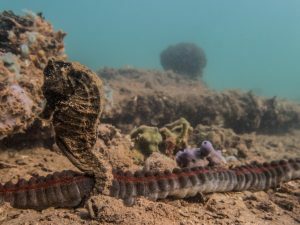 So every year for the past ten years, the Lake crew has performed these surveys to monitor the distribution and relative population dynamics of these two species. 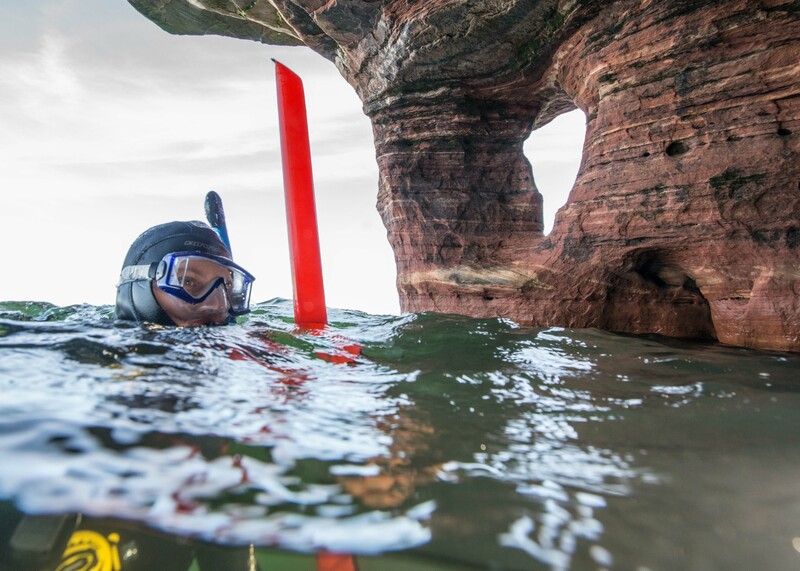 In addition to the depth surveys Mark and Kristin completed that first day, the Lake crew also does surface snorkel surveys every half-mile along the shoreline and we would be starting that the following week. 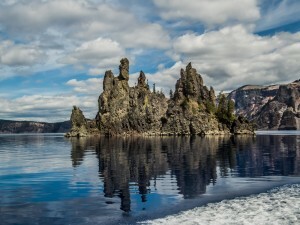 A view of Wizard Island and Crater Lake from the Rim Drive. With the weekend off, one of the first where I wasn’t either working or travelling, I decided to spend some time getting to know Oregon. I spent Saturday exploring the park, driving the rim, stopping at the overlooks, and going on a few hikes. On Sunday, I went on a leisurely three-hour drive through beautiful Oregon up to Eugene to visit my friend Pat Lyons, my professor from my semester abroad in the Caribbean where I studied tropical marine biology. It was amazing to get to catch up with him and hear about his next move to a college down in LA and tell him all about my internship and what I’ve been up to. It was great to catch up with my mentor and friend, Pat Lyons! On Monday, Mark and Scott were stuck in the office doing paper work, but Kristin, Sarah, and I spent the day out on the lake. Up first we had to check the crayfish traps. Another component to the Lake crew’s crayfish monitoring efforts is a tagging program. Every week a trap full of crayfish is pulled up from a depth of 50 meters and each is tagged with a fluorescent tag. 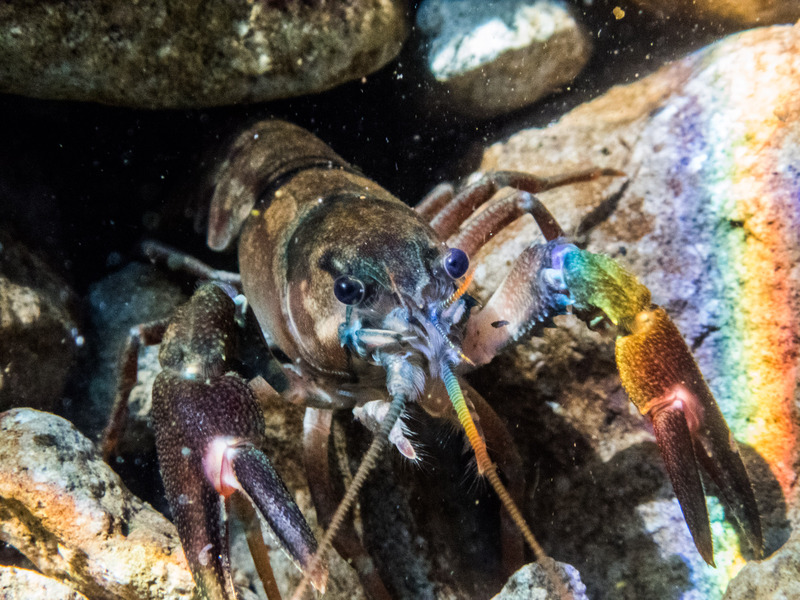 The crayfish are re-released at depth and at the end of the summer a multi-depth trapping effort will be made to see how the crayfish move along the lake bottom. 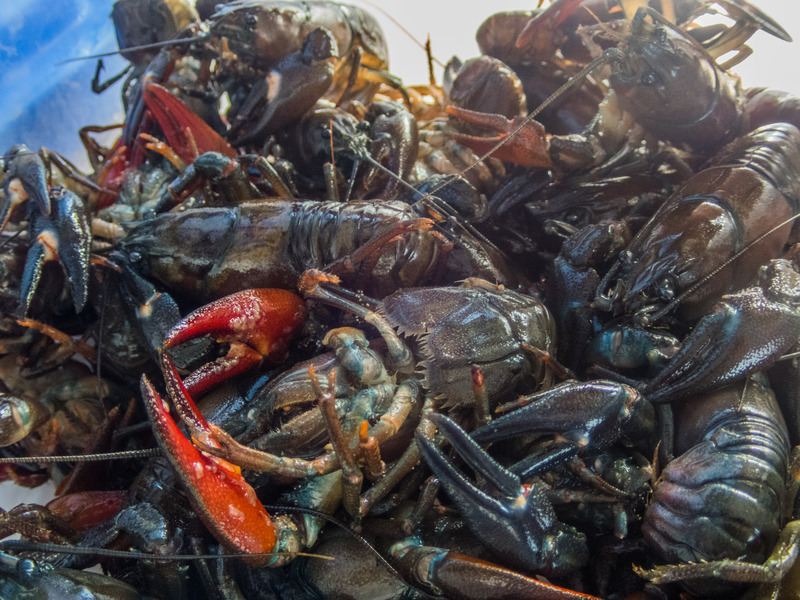 When we pulled up the trap, we counted a season record of 63 crayfish! Two of them had previously been tagged earlier in the year, but the remaining crayfish were injected with the pink elastomer tag. I even got to inject a few dozen myself! 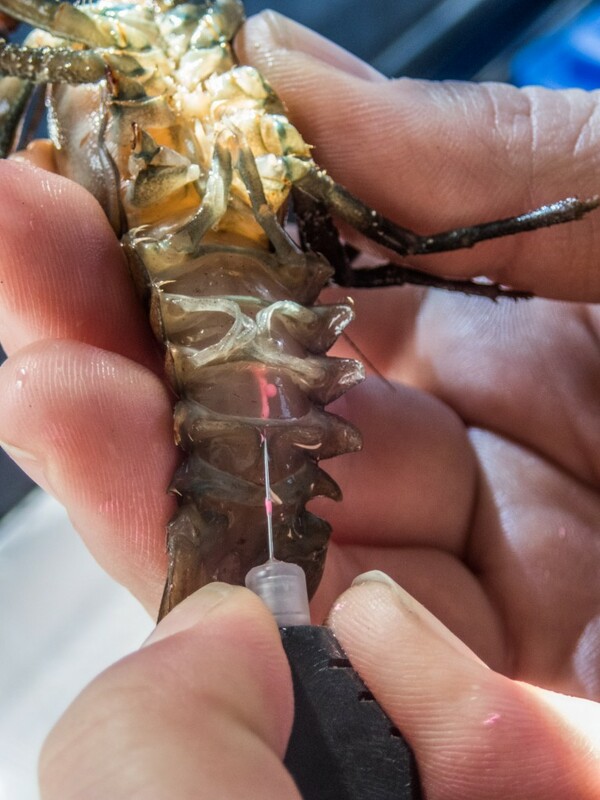 The fluorescent pink elastomer injection allows the Lake crew to tag the crayfish as a part of their long-term capture-recapture study. Getting my hands dirty injecting the pink elastomer tag into a few dozen of the crayfish we trapped. 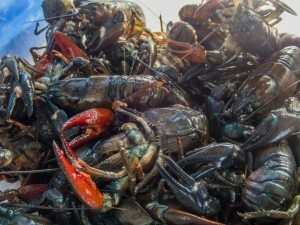 Pulled up from a depth of 50m, this bucket full of crayfish are just waiting for their tag. 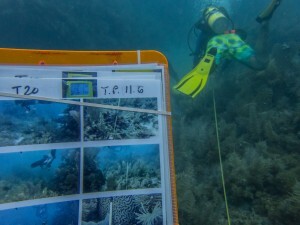 In the afternoon, we began the surface snorkel surveys. Wearing a dry suit (and a thick onesie underneath) made the water much more tolerable. On the first site, maybe 20 rocks in, I saw my first one. A newt. With a few more newt sightings and zero crayfish, I was feeling happy after the first site. The second site was the same. Go newts! I thought. But by the third site, the handful of newts had disappeared completely, and dozens of crayfish took their place. The next five sites, each had more crayfish than the last. We were only eights sites in and I was beginning to see how severe and how dismal the outcome was looking for the newts. Kristin and Scott call us in after our 10 minute surface snorkel survey. The next day, we recruited the likes of Fish Biologist Dave Herring and his seasonal Bull Trout Crew, consisting of Ian Ralston, Kevin Howells, and Joe Lemanski, as well as Botanist Jesse Sikora. With a total of 10 people, we were able to split up into two boats and divide the sites up to get them done quicker. A majority of the sites were even worse in terms of crayfish than the day before. 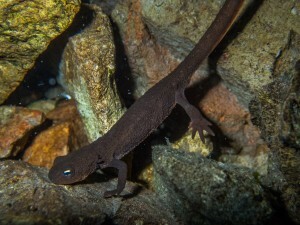 Numbers were often in the hundreds and newts were few and far between. Occasionally, there would be a site here and there that would have none of either, but while it did mean less counting, it was by no means a good sign. 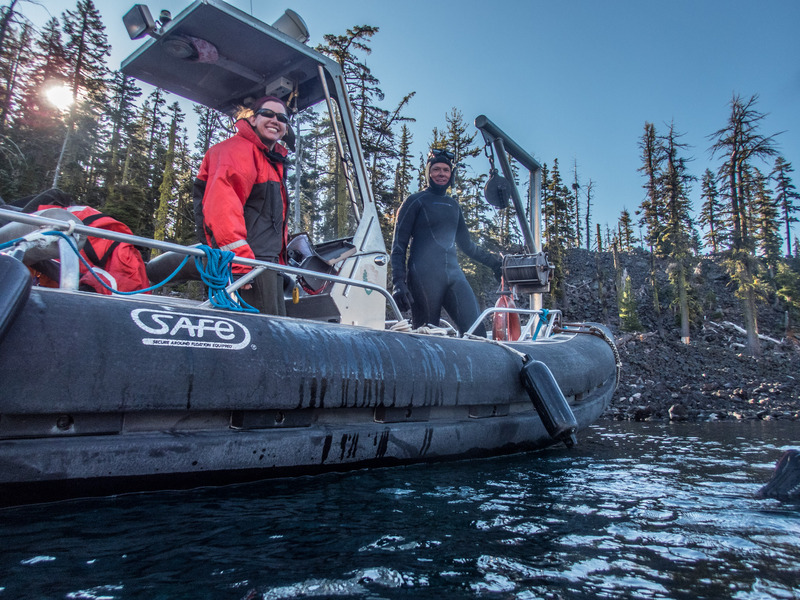 After dropping Dave and Jesse off at Cleetwood trail to head back home for the night, we met up with the other boat and learned they had had a similar experience. Ian flips over a rock during the surface snorkel survey. Ian scans the cliff face looking for any exposed newts or crayfish as he swims along during the survey. 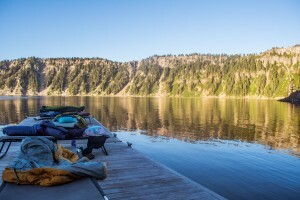 That night, the Bull Trout and Lake crews joined up for a campout on Wizard Island. Scott, Mark, and Sarah prepared a delicious elk stir-fry for us to enjoy as we sat on the docks laughing in good company. As the sun began to set, some of us hiked up to the top to get a better view. 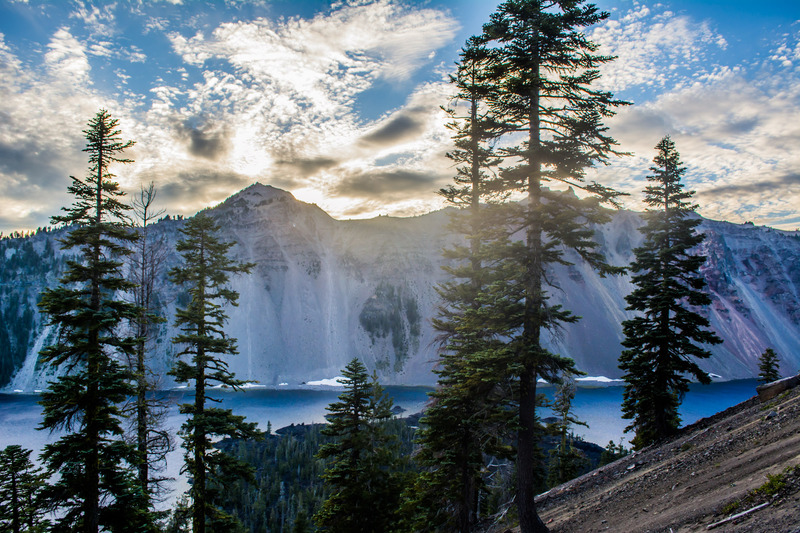 All I can say is Crater Lake did not disappoint. Our sleeping arrangements for our campout on Wizard Island. Hiking up Wizard Island in time for the sunset. But perhaps the best view came after the sun went down and the moon came out. With barely any light pollution, the stars at CRLA were beyond breathtaking. 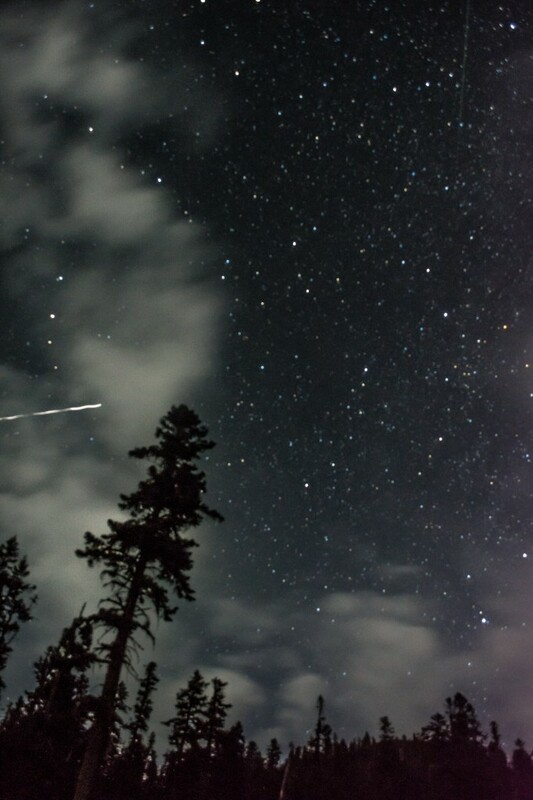 Yet to add icing to the cake, it just so happened that the Perseid meteor shower was beginning to pick up. 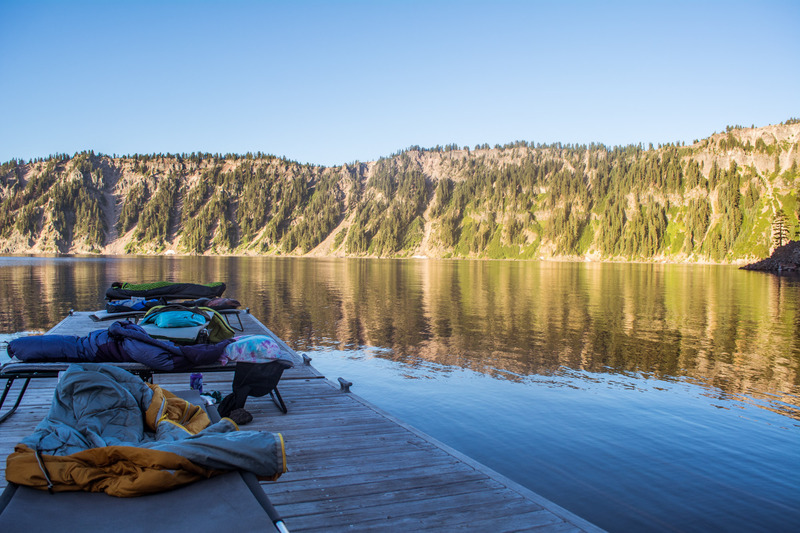 So as we lay in our sleeping bags on the dock listening to the quiet lapping of the water with hundreds of stars shining overhead, a few meteors streaked across the night sky. I watched for hours before finally falling asleep. The following day, it only took us an hour to crank out the last seven sites of the surface snorkel surveys. After finishing them up, we decided, since we spent all that time decontaminating my gear, to do another set of diving surveys. So I joined Scott and Mark to document the surveying process and just enjoy my dive in Crater Lake. At the site, we saw both newts and crayfish. In fact, we saw a newt in the claws of a crayfish. We swooped in just in time to save the little guy! 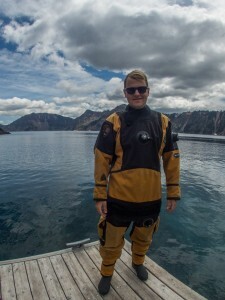 Suiting up for my dive in Crater Lake. Survived my first dry suit dive! At 45 feet, Mark and Scott kick up sediment as they turn over rocks looking for newts and crayfish. Mark saves the newt being attacked by the crayfish. 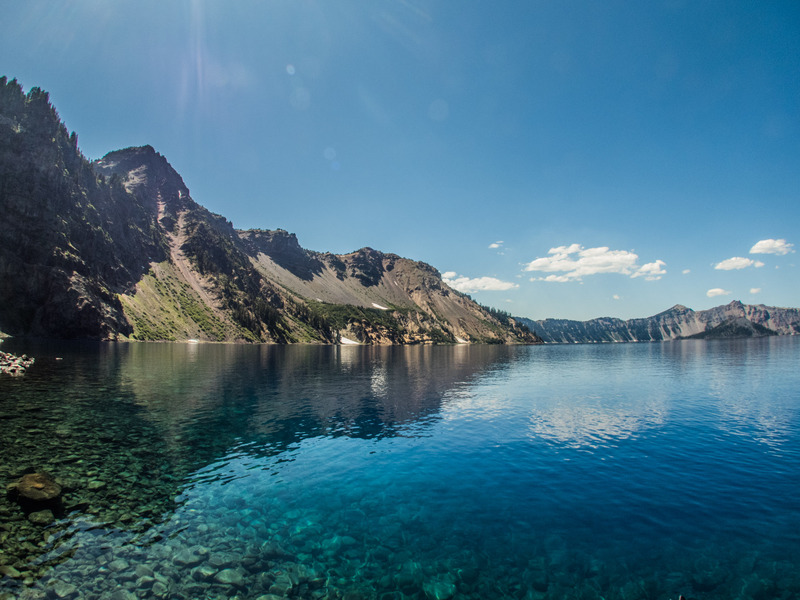 Diving is always a whole other world for me, but I must say diving in Crater Lake was on a completely new indescribable level. Thank you to Mark and Scott for inviting me into your diving operations and giving me the diving experience of a lifetime. And thank you to the entire Lake crew team for sharing with me the magic of Crater Lake! This entry was posted in 2016 National Park Service, Current Internships, Internship Journeys on September 6, 2016 by Garrett Fundakowski. I landed in Denver the night of July 22nd. Susanna Pershern, the SRC’s Audio/Visual Specialist, graciously picked me up after my late flight and offered to put me up for the night. The next morning, Brett, Susanna, and I packed up the Suburban and the trailer with tanks, dive gear, cameras galore, and enough snack food for a cross-country road trip and headed out on our 15-hour drive to Wisconsin. We left the majestic Rocky Mountains of Colorado behind as they slowly turned into rolling hills before completely fading away to the flat plains of Nebraska. Since I hadn’t seen either of them in a month, the first few hours were full of conversation as we exchanged stories of our travels over the last few weeks. Somewhere along the freeway in Nebraska, we decided to listen to the book Wake of the Perdido Star by actor Gene Hackman and Dan Lenihan, the founding chief of the SRC. As the sun set, I drifted in and out of sleep to visions of sailing ships, fighting pirates, and a little old town in Massachusetts. We split the trip up by staying a night in Lincoln. But we started the second day of the trip right where we left off with cow pastures out our window and the discovery of treasure on a Caribbean island. The hours passed as the cornfields of Iowa transitioned into the wooded areas and lakes of Wisconsin. By nightfall we had made it to our hotel in Siren, Wisconsin. The reason Brett, Susanna, and I drove to Wisconsin was to spend a few days working with the kids of Northwest Passage. Northwest Passage offers a variety of services including a comprehensive assessment center as well as intensive residential treatment for children and adolescents struggling with their mental health. Over the past 40 years, Northwest Passage has developed an innovative program that combines both traditional mental health treatments with multiple experiential therapies. 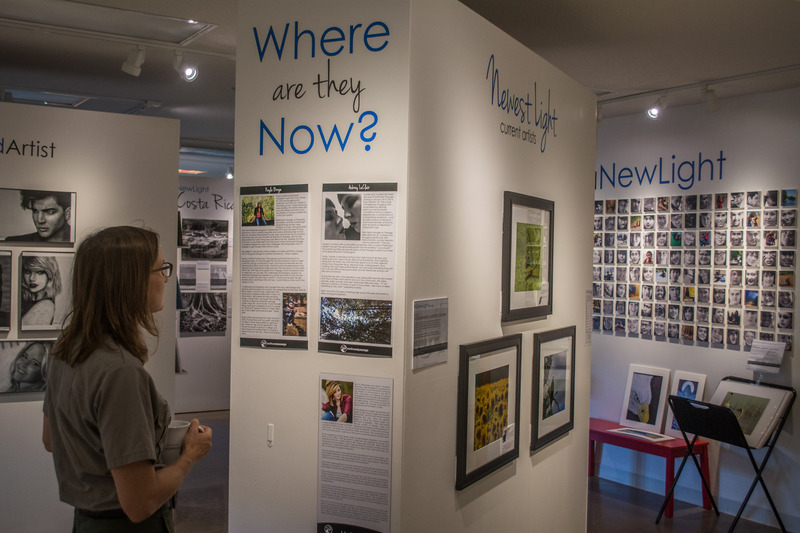 One such experiential therapy program is In a New Light, a therapeutic nature photography program aimed at empowering marginalized youth by encouraging artistic expression in tandem with outdoor exploration. 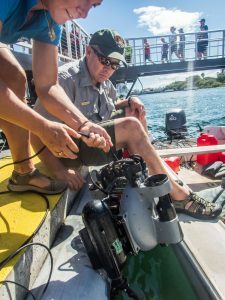 For the past few years, the National Park Service and the SRC have helped fund In a New Light via small grants. However, until this year, no one from the SRC had made it out to visit the Northwest Passage kids. But when Brett first explained to me what it was, I knew I had to jump on the opportunity to see the program for myself, interact with the kids, and experience the transformation. Having grown up with many of my friends struggling with their own mental health issues, I found the goal and mission of Northwest Passage to be remarkable and one that was close to my heart. I fell asleep excited; I looking forward to being a part, however small, of the healing process of these kids. On our first morning, we met up with Ben Thwaits, director of the program, at the In a New Light gallery. Created with the intention of providing a venue to proudly display the work produced by the kids, the public gallery is impressive to say the least. Inside, breathtaking work from Passage graduates adorned the walls in various collections from different trips they have taken over the years. I was shocked by the quality of work that was hanging on the walls. I found myself wishing I were as good of a photographer so that I could capture moments so perfectly. Along the back wall hung an exhibition entitled “Under the Surface”. 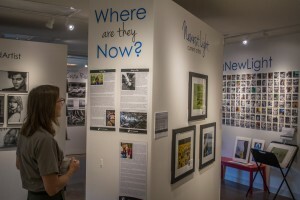 The stunning collection was comprised entirely of shots taken by the kids using underwater cameras in the local rivers and lakes. 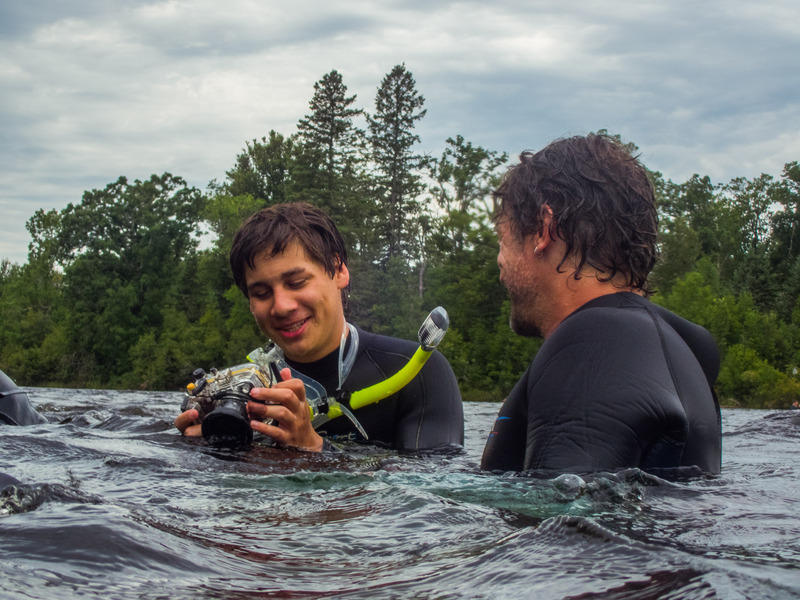 In fact, over the next two days, we would be joining both the boys’ and girls’ field trips to the local Saint Croix Riverway in order to explore the river and take some underwater pictures with them. 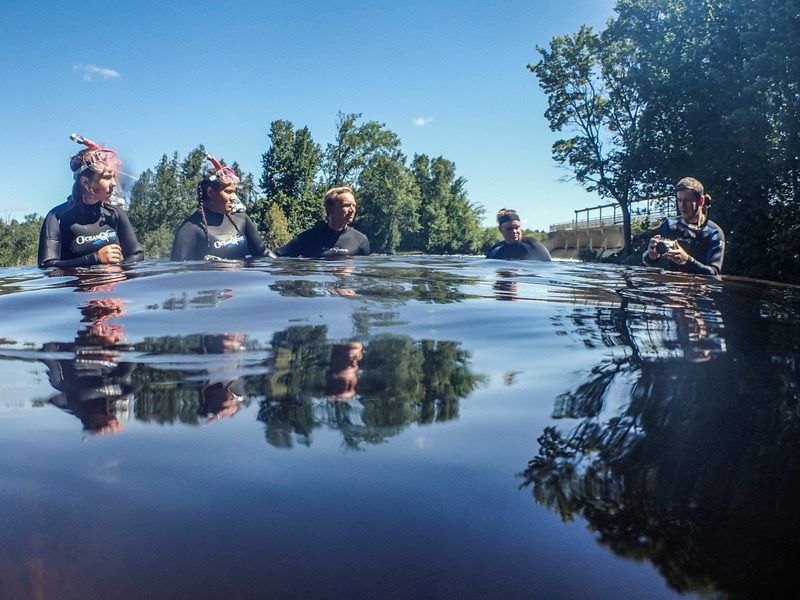 Later that morning, Ben took us to the Gordon dam on the St. Croix River where we met up with the Passage girls, their teachers Kelly and Ian, and Toben Lafrancois, a biologist and co-founder and director of the New Light Under the Surface program. 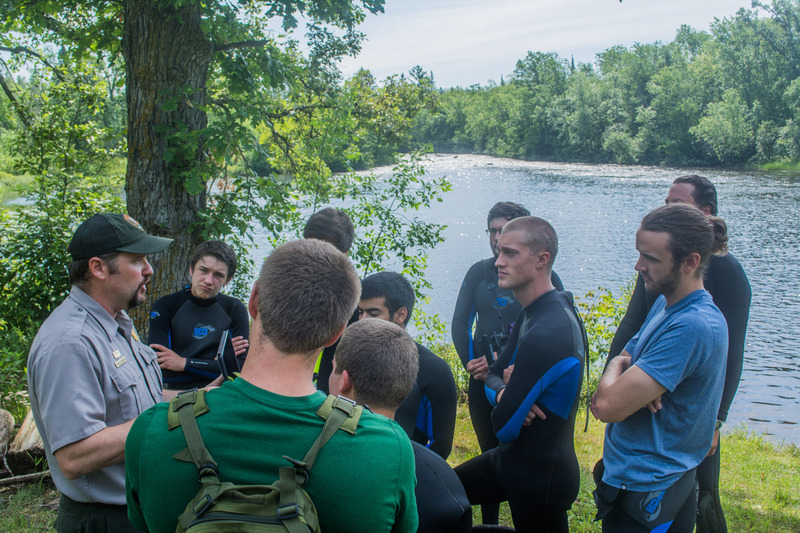 After donning our gear, Ben and Toben gathered everyone around for introductions and a safety orientation. Due to recent heavy rains and flooding along parts of the St. Croix, the water was moving faster than usual over the dam and everyone was asked to be cautious and stick with their buddies. As soon as Ben was done talking, they darted out into the river in pairs. Armed with only a camera and snorkel gear, the girls spent almost five hours in the water taking pictures of mussels, crawfish, freshwater sponges, snails, and the dam. It was amazing to watch the whole process. Some were constantly moving, flitting between subjects, exploring further downstream then back upstream, trying to take lots of pictures in a variety of habitats. Others girls were very patient and would stay in the same spot for a long time trying to get that perfect shot. They weren’t afraid to ask questions or help each other out by offering advice on how to shoot a certain subject. The next day, we took the boys out on the river, about a half-mile downstream, just at the end of some exciting rapids. Initially it seemed as if there weren’t as many typical subjects to photograph, and I was worried that the boys wouldn’t enjoy it as much, but they spent just as long out on the water getting some wonderful shots of fish, grasses, an old dock, and the rapids. The boys even managed to find a plethora of discarded items on the hard bottom including a fishing rod and a tackle box. Being out on the river with the kids was a blast. I loved working with them and watching them splash about and have fun with their friends while exploring the world, satisfying a curiosity, and building meaningful relationships, reminding me what it’s like to be a kid. And that was the beauty of it all. When they were in the water, they forgot about their issues; they were just kids. You couldn’t tell they were troubled at all. They were normal kids who just needed the time, tools, and encouragement to explore their world, develop relationships, and express themselves. And that is what Northwest Passage is doing for these kids. 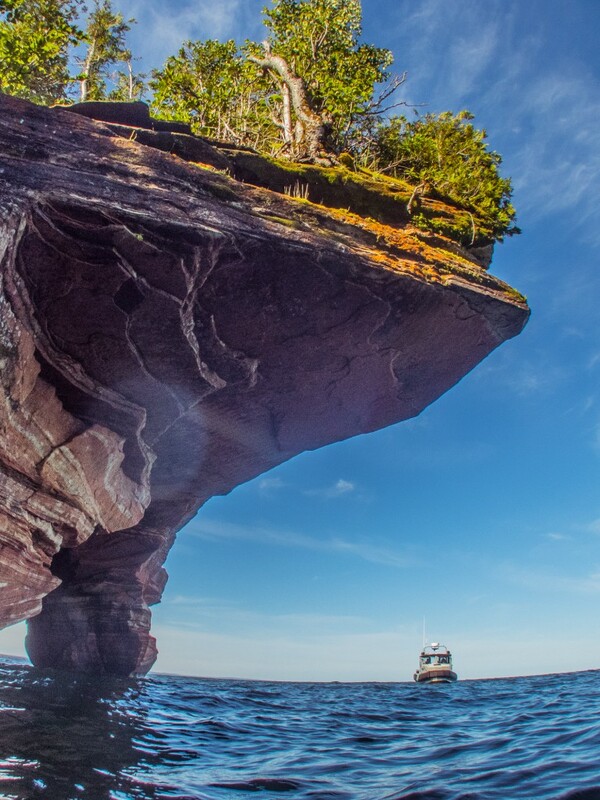 On Wednesday, we took three of the Passage guys a few hours north, up to Apostle Islands National Lakeshore on the southwestern shore of Lake Superior for the day. Lake Superior is known for its shipwrecks so Ben and Brett were hoping to get the guys snorkeling in a new environment with new subjects, maybe a shipwreck or two, to photograph. We were on our way to a wreck, but the Coast Guard had other plans for us. They had gotten a call for distressed kayakers and they needed all NPS vessels to head to the location to try to get eyes on the kayakers. By the time we got there, another boat had already sighted them and had started guiding them into shore. As we started heading back out for our planned day on the water, the Coast Guard showed up to take control of the situation. We spent the afternoon snorkeling in a bay next to some photogenic cliffs before heading over to two shipwrecks – the Ottawa and the H.D. Coffinberry. The guys really enjoyed exploring the two shipwrecks, so much so that we had to call them out of the water because it was getting late. When we got back to dock, I went to grab something out of the car when I overheard the three Passage guys gawking about how awesome the day was and that absolutely made my day. It may not seem like a lot, but to hear three young teenage boys say that to each other without being asked by an adult means that they must’ve had a fantastic time out on the water. Ben told me later on that on the drive home the guys could not stop talking about it and that one of the guys seemed really serious about joining the Coast Guard. It’s amazing to think that the events of one day could change a person’s life course and give them a new goal, a new dream to work toward. On our last day in town, Brett, Susanna, and I went out on Lake Superior with Toben and a Passage graduate to do some basic photographing of the park. 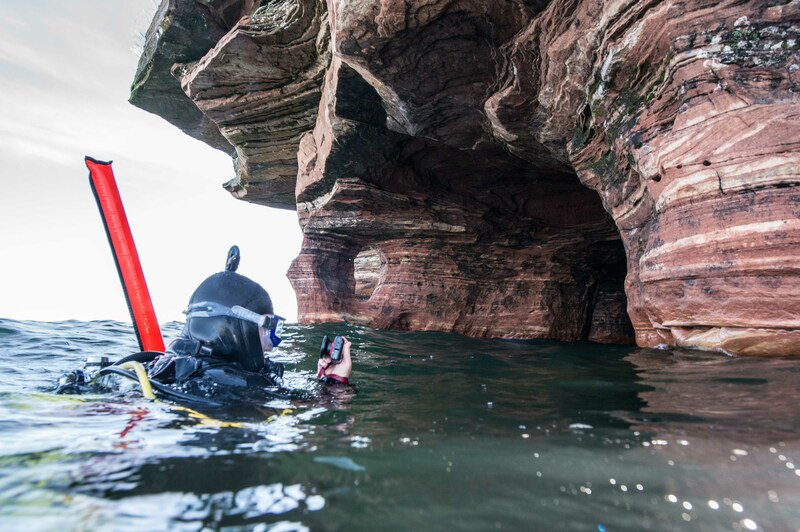 David Cooper, our boat operator, brought us to the backside of Devil’s Island where wave action over time has carved out sea caves in the rock face on the north side. We all dove in so that we could take pictures of this magnificent natural façade. 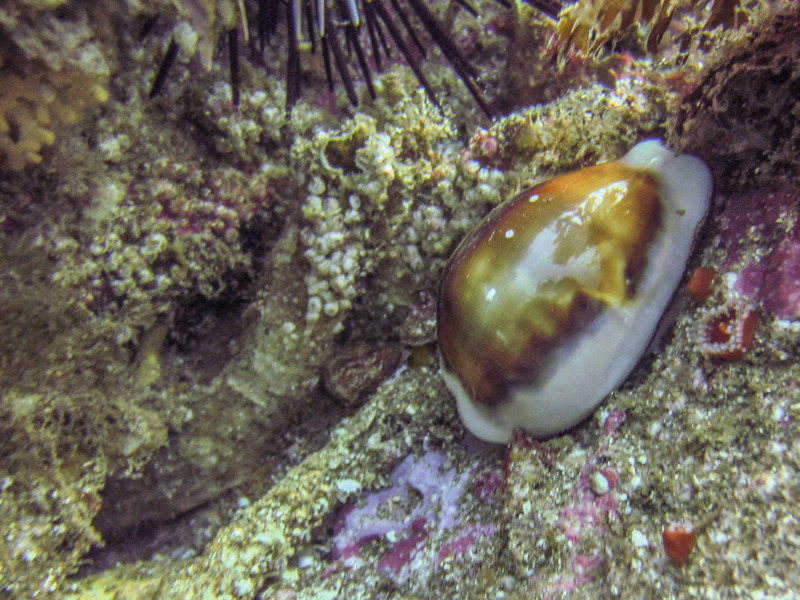 However, about halfway through the planned dive I realized the waterproof battery cover on my camera had opened. Susanna and I immediately called our dive and headed back to the boat to dry my camera. I remember panicking thinking about how I lost all of my pictures and how Brett was going to kill me, but I did everything I could to dry the camera as quickly as possible, so all that was left to do was wait. Thankfully, the following morning, as we were packing up the car to head back to Denver, I put the battery pack back in after leaving it out all night to dry and the camera was working fine. I definitely learned my lesson to upload my pictures every night! Thanks to Brett and Susanna for allowing me to come along on the road trip to Wisconsin and for taking me on my first cold water dive ever! Another thanks to Ben and Toben for doing what you do for the kids at Northwest Passage. You two are impacting the lives of these kids every day and helping them turn their lives around. It is just remarkable. Lastly, a special thanks goes out to the kids of Northwest Passage who impacted me in an indescribable way. 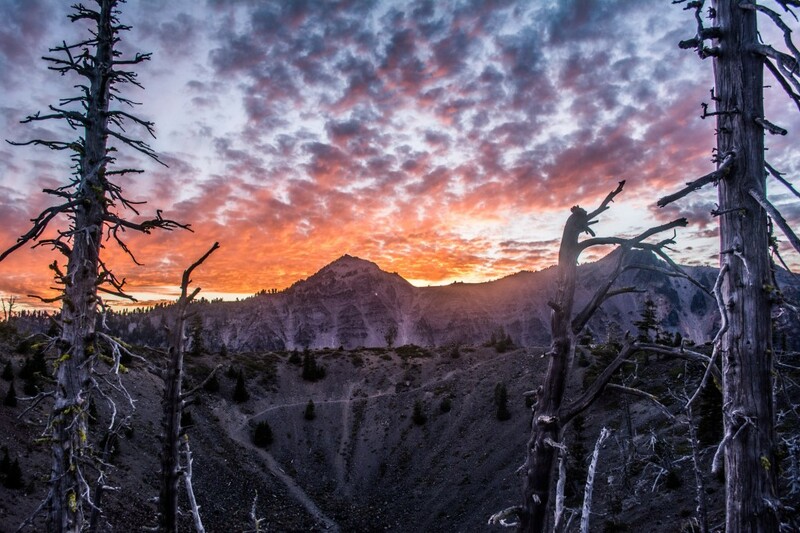 This entry was posted in 2016 National Park Service, Current Internships, Internship Journeys on August 25, 2016 by Brett Seymour. The morning of July 11th, I met up with Mike Feeley and Jeff Mills in Miami. With the 26-foot Twin Vee Catamaran in tow, we began making our way down to Key West. The drive down Overseas Highway is one of my favourite drives – 120 miles of palm trees and clear blue water out both windows. In fact, I just made this drive at the end of May with my undergraduate research lab. 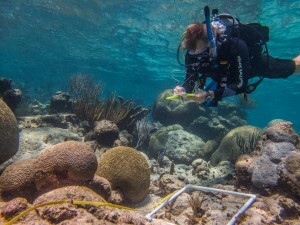 Every summer, Dr. Malcolm Hill’s lab at the University of Richmond travels down to Summerland Key to spend a week or two doing fieldwork with marine sponges. So I’ve made this drive for the past three summers and it’s come to be quite familiar. Mike and Jeff are two of the biologists working for the South Florida/Caribbean Network (SFCN) and this week I was joining their crew. SFCN is one of 32 NPS Inventory and Monitoring Networks across the country. 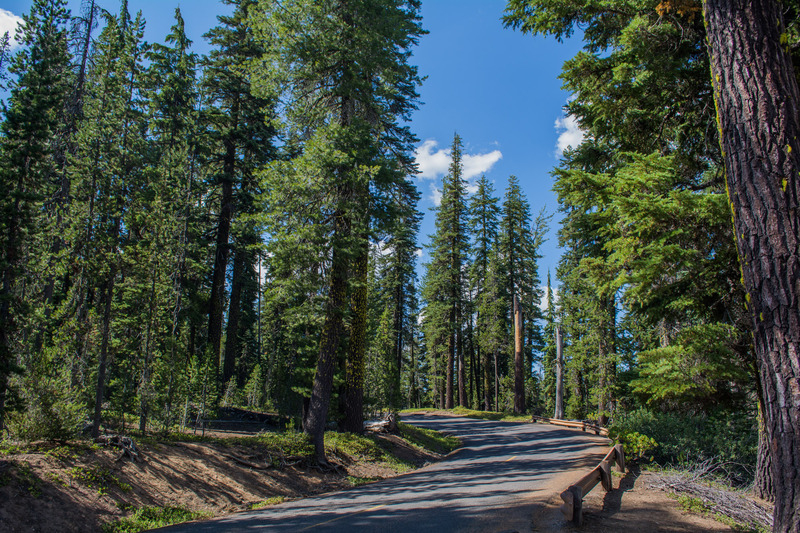 These I&M Networks are in charge of collecting and analyzing natural resource data for parks and then providing them with information that can be integrated into park planning and management strategies. 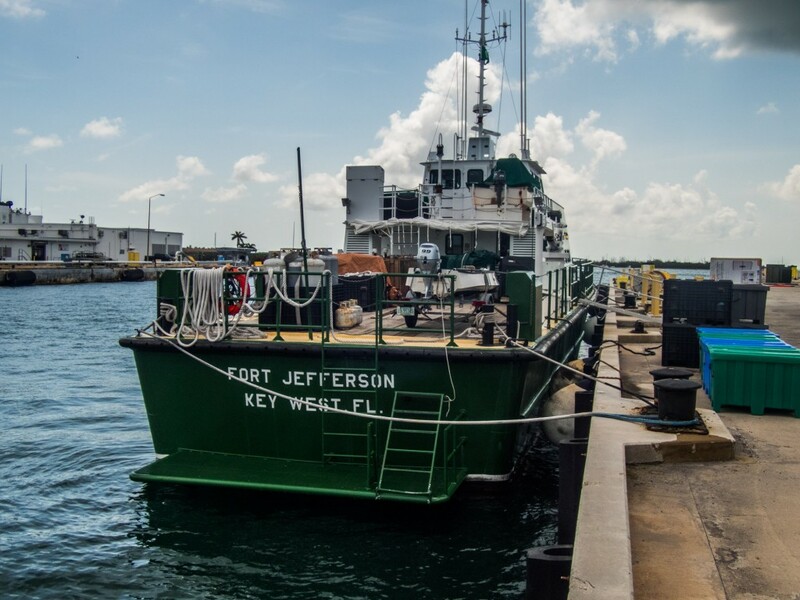 Specifically, on this trip to Dry Tortugas National Park (DRTO), we would be performing annual benthic surveys on sites that the SFCN has been monitoring for years. I was surprised when we pulled up to the Naval Air Station in Key West, but this was where we were meeting the Motor Vessel Fort Jefferson. The MV Fort Jeff is a supply vessel for DRTO owned and operated by the National Park Service that would serve both as our transportation to and from the park, in addition to our housing for the next 10 days. When we pulled up to the bulkhead where the MV Fort Jeff was docked, my eyes widened with excitement. I’ve never even seen a full-scale research vessel before (aside from on TV specials on the Discovery channel) and I was so eager to be spending my week on board. Shortly after we arrived, Rob Waara and Lee Richter, the other half of the SFCN staff, and interns Erin Nassif and Nicole Palma pulled up to the dock with a truck packed to the brim with supplies for the week. On their way down, they had gone grocery shopping to get food for the eight-person team for our 10-day voyage, a very important task. We spent the afternoon unloading the trucks, launching the Twin Vee, and double-checking we had everything we would need for the expedition before settling into our quarters. 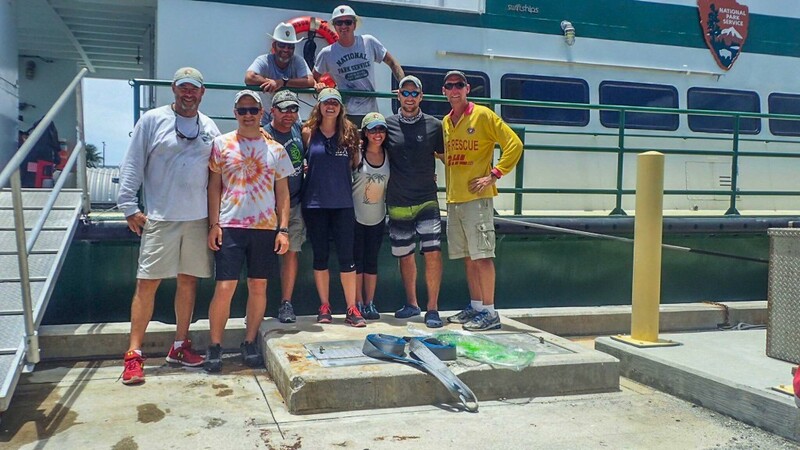 The next morning, it was all hands on deck as we helped Captain Tim, Brian, and Mikey push off out of Key West at 0700. Located about 70 miles west of Key West, the Dry Tortugas can only be reached by boat or seaplane. 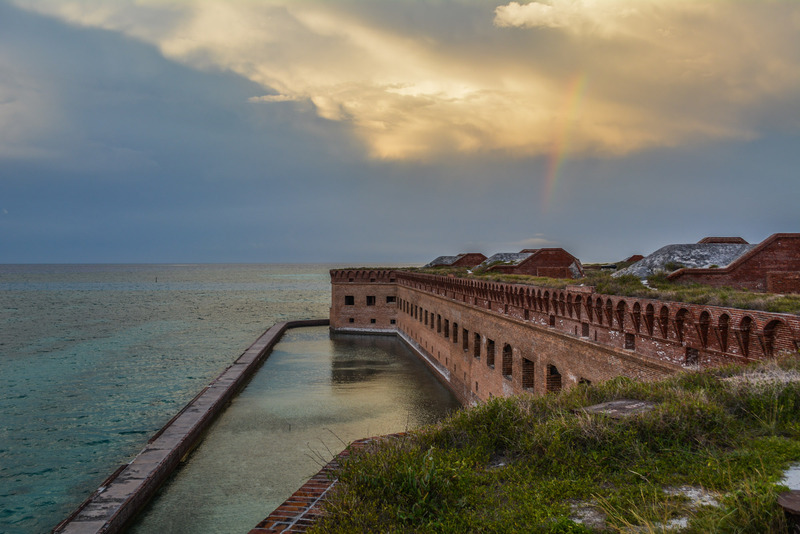 Ever since their discovery by Ponce de Leon in the early 16th century, the Dry Tortugas have had an incredibly rich history. 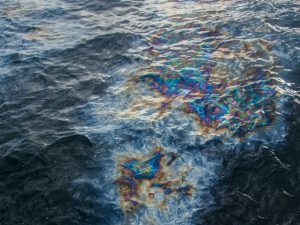 The location at the mouth of the Gulf of Mexico made them an incredibly important stop along shipping routes heading into or out of the Gulf. As such, a fort was commissioned to be built in the early 1800’s by the United States. During the Civil War it remained in Union hands as a naval base and later was used as a prison. 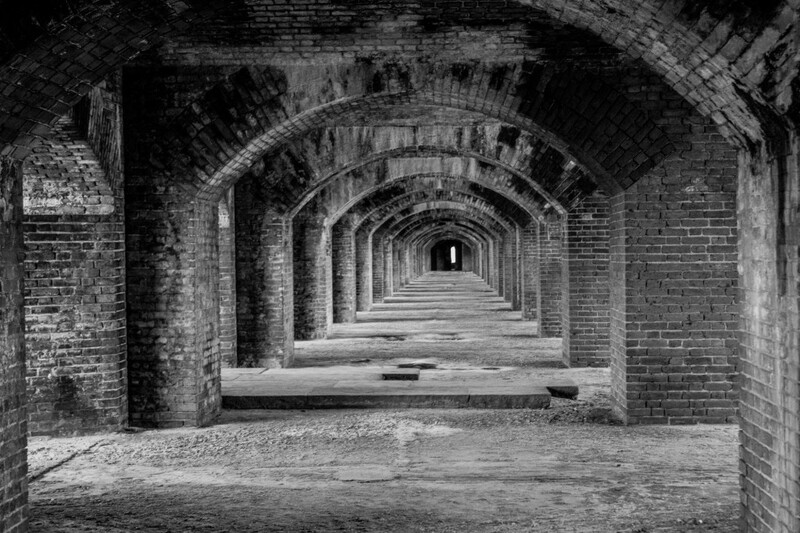 Though it was never technically completed, the Fort Jefferson stands as the largest masonry structure in the Americas, with 16 million bricks making up the imposing three-story, hexagonal fortress. Today, its casemates house National Park Service staff and thousands ofvisitors flock to the park to walk the parade grounds of this historic structure. 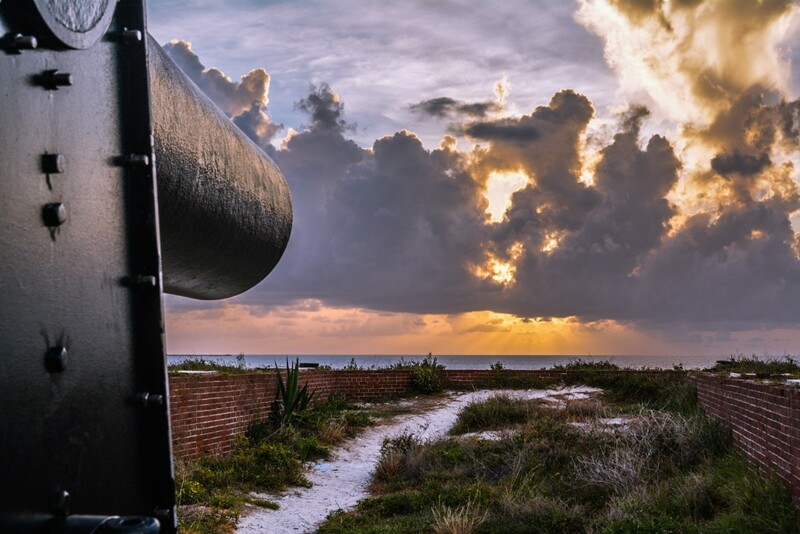 A view of the parade grounds of the Fort Jefferson. 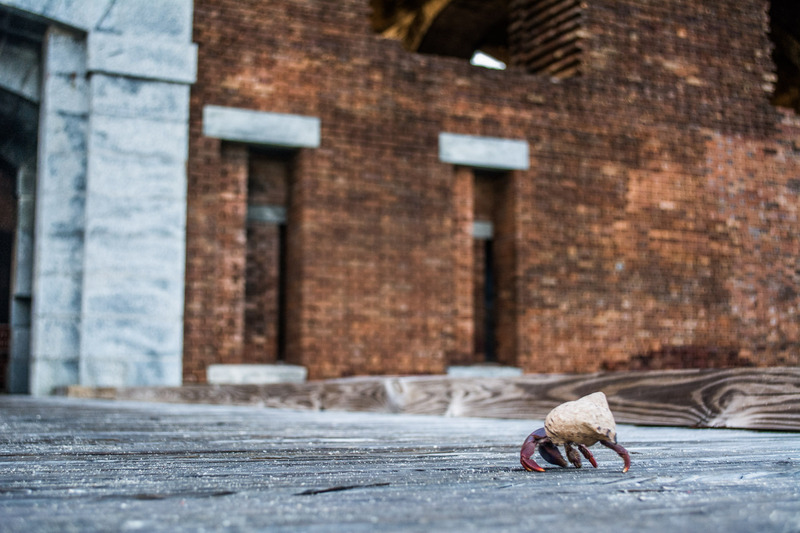 A hermit crab crosses the wooden bridge on his way to visit the Civil War fort. A look back in time at the casemates of former prisoners. After about 4 hours of cruising the open water, the Civil War fort appeared on the horizon. As we approached Garden Key and the bricks began to take on shape, I was taken aback. The fort, surrounded by a moat (which I discovered later had a crocodile living in it), looked like something out of a medieval fairytale. This and the 100-square miles of ocean surrounding the fort would be our stomping ground for the next 10 days. Surrounded by a moat, the Civil War fort seems like something from medieval times. That evening, we went over the game plan for the week. SFCN has been monitoring three sites at DRTO – Bird Key, Loggerhead Key, and Santa’s Village. Each site is comprised of multiple permanent 10-meter transects that are surveyed to monitor coral species, colony counts, and cases of disease. As the only things marking the permanent transects are metal pins fixed to the reef, the dive operations would be divided into two teams. The navigation team would dive first in order to locate the pins using compass bearings and distances and lay down the 10-meter transect tape between the two pins. The survey team would then drop, perform the survey, and collect the tapes. The next day we loaded the Twin Vee with all our dive gear, a water jug, and a lunch cooler and set out on our first day of surveys. As my coral identification is not as practiced as that of Mike and Jeff (who have been doing this for years now), I joined the navigation team. 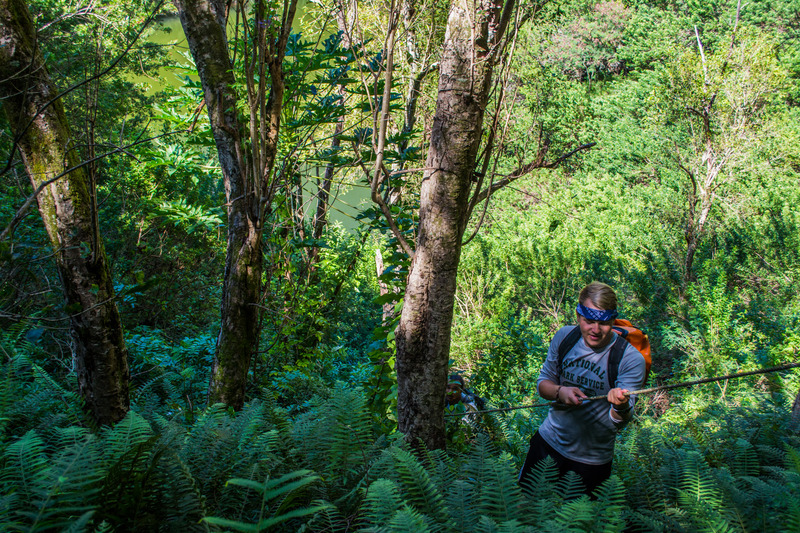 Equipped with a compass, transect tapes, and a slate with pictures of the site, Lee, Nicole and I splashed in to lay down the transects for the survey team. What I thought would be an easy task, turned out to be an exciting challenge. Distances and bearings were not always enough to find the pins. Oftentimes they were covered with algae, hidden at the base of a sea fan, or overgrown by a sponge. 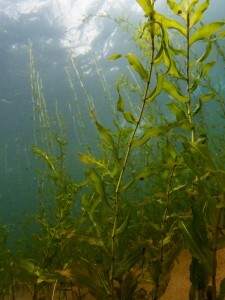 Most of the time we relied on the pictures of the site to locate the pins, sort of like an underwater game of “I spy…”. When we came up for our surface interval, the survey team would go down to work on the transects we set out. We repeated this process again before it was time to head back in to the MV Fort Jeff for dinner. Erin returns from tying the transect off to the end pin. Lee searches for the end pin of the transect. It was hidden underneath overgrowth of algae. Lee checks that the transect line is tight and follows a straight line. Rob and Jeff prepare for the transect survey. 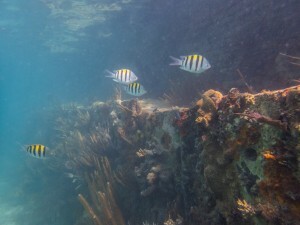 Even though I was on the navigation team, it was hard not to stare in awe as DRTO reefs were teeming with life. 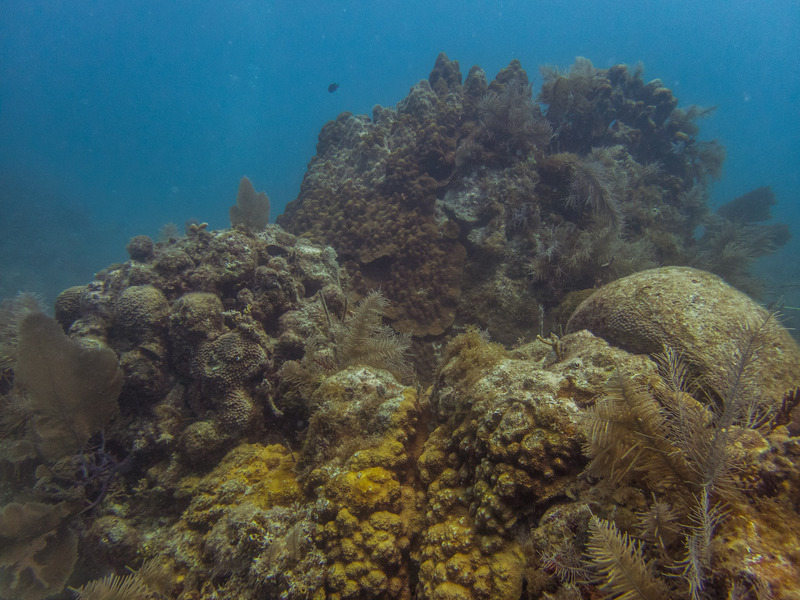 I’ve been told that the reefs here were what the reefs of the Keys used to look like decades ago. 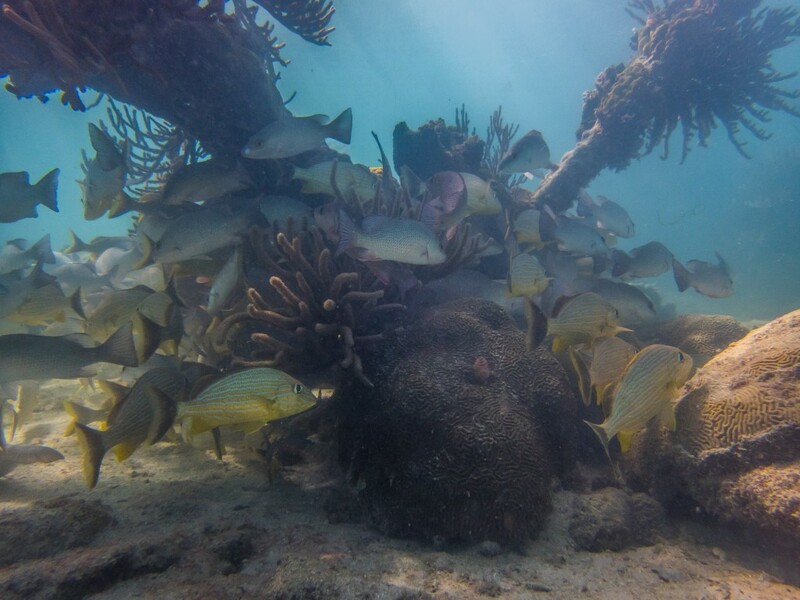 Large groupers and snappers, which have been fished off the reefs in the Keys, thrive in the park’s remote and protected waters. 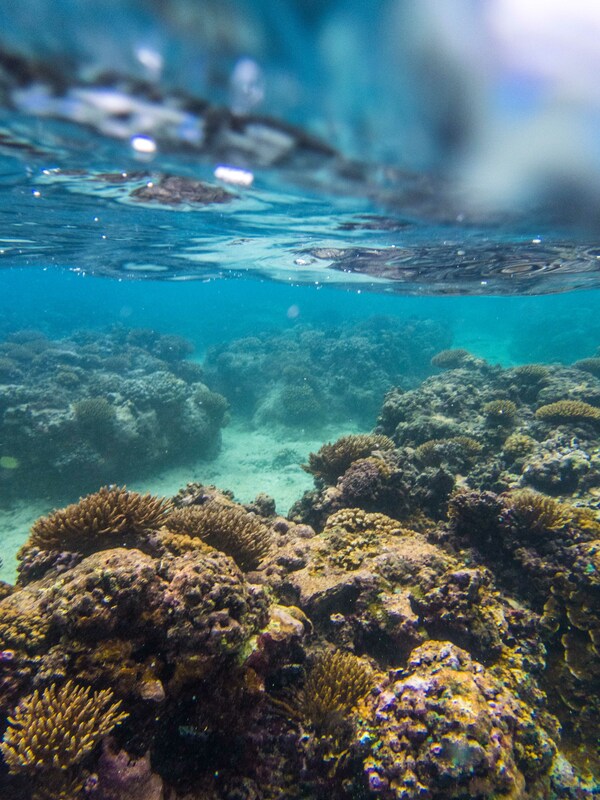 Large boulder brain corals and great star corals populate the reef’s hard bottom with soft corals and gorgonians swaying in the current. Despite this, algal growth and coral disease, often indicators of unhealthy or declining reefs, were also very prevalent. 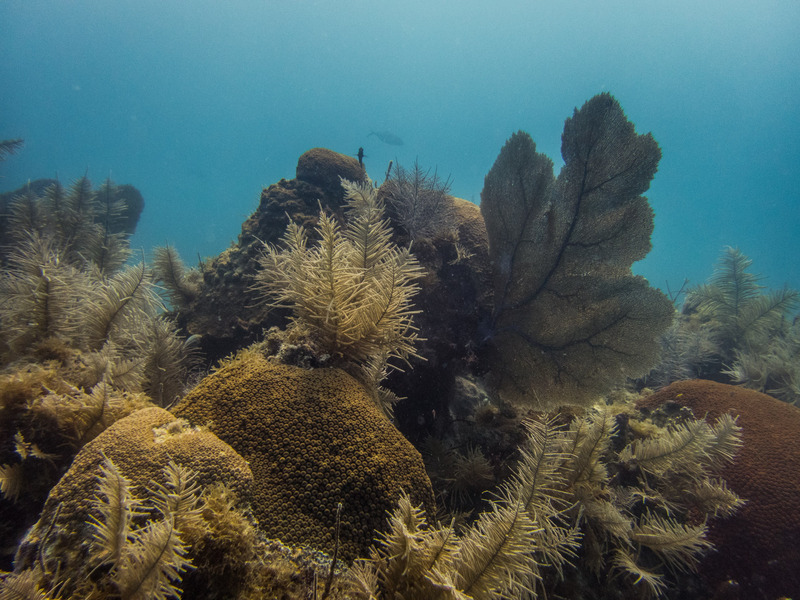 Sea fans and gorgonians surround large colonies of Great Star coral. Disease and algae are visible amongst the corals and gorgonians. 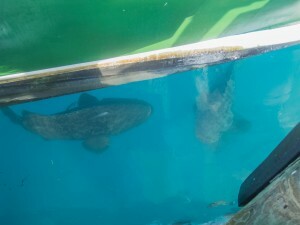 Goliath groupers hanging around underneath the MV Fort Jeff. It wasn’t long before we fell into a comfortable and efficient rhythm. We spent every day on the water. We picked up wherever we left off the day before and would motor over to the next site when we wrapped up the one we were working on. Four transects per dive with two dives a day allowed us to wrap up each site in two or three days, depending on the weather. After returning from the field, Nicole, Erin, and I would spend the evenings exploring the fort or snorkeling along its perimeter. 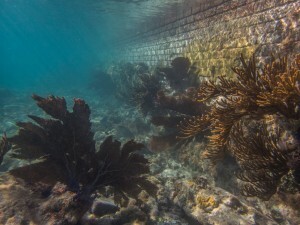 The moat wall surrounding the fort teems with corals. 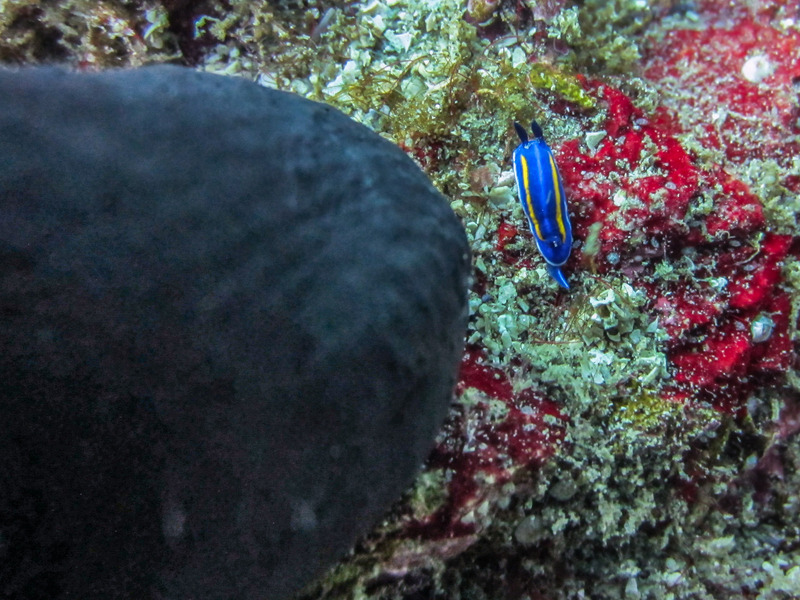 Sergeant major damselfish swim along the moat wall. Corals have colonized the old coal docks surrounding the fort. Grunts school around the old coal docks surrounding the fort. 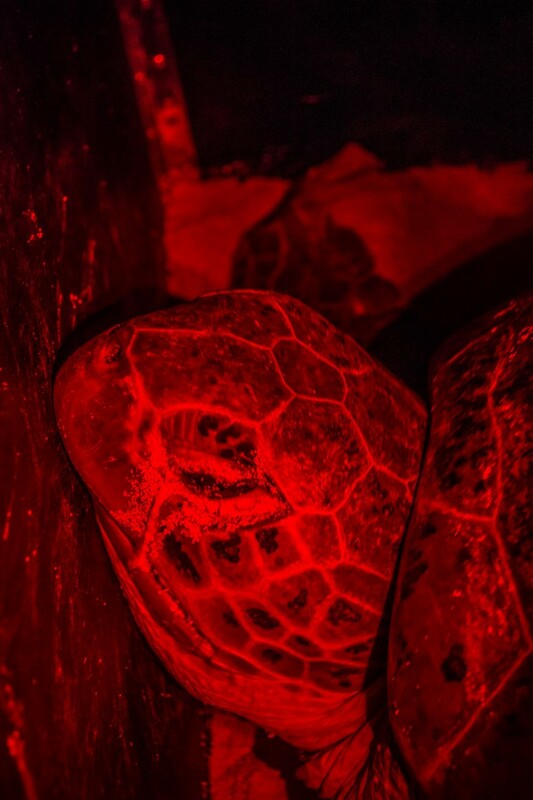 On the second-to-last evening, I had the opportunity to join the United States Geological Survey (USGS) crew on their nightly East Key turtle nesting monitoring. We motored the short distance over to the 100 by 200 meter island where we would be spending the night and set up camp before it got dark. Every half hour someone walked the shoreline to look for a nesting female. Luckily enough on the 2200 walk three turtles had come up to nest. I had never seen a turtle nesting before. It was miraculous to watch these 300-pound beasts lug themselves up on shore and sometimes go hundreds of feet before finding the perfect spot to dig their nest. Some even dig multiple holes until they find the right one to lay their clutch in. The whole nesting process took an hour or two to from start to finish. Sydney the Loggerhead turtle in the corral. Maria the Green turtle in the corral. We monitored each turtle’s nesting progress and once they had finished, before they returned to the ocean, we corralled them on the beach in order to gather data on them. We noted the species, took various measurements on size, collected a blood sample, and tagged any turtle that hadn’t already been worked up this year. We had two returners. 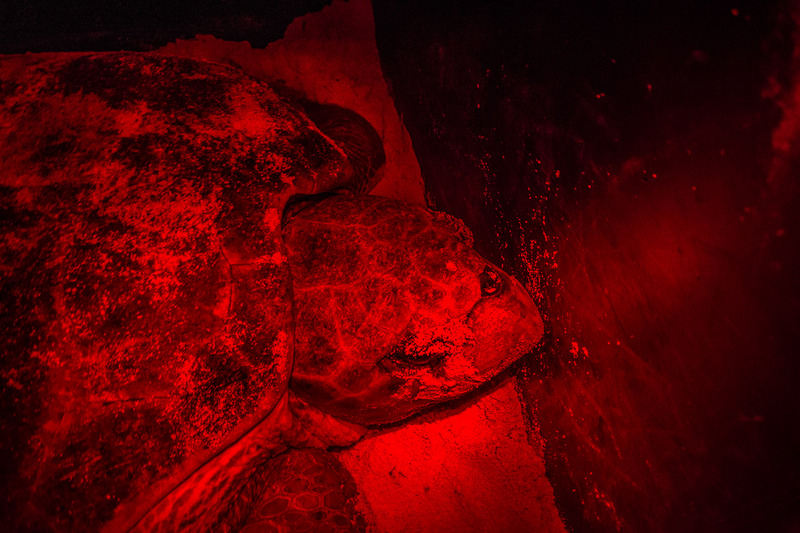 Esther was a Loggerhead who had nested and been worked up earlier that year and Maria was a Green who has nested in past years but hadn’t been seen in awhile. The third turtle was a new Loggerhead who I named Sydney. After finishing up with Sydney around 0100, the rest of the night was uneventful and I got some sleep under the light of the stars. We returned to the fort just in time to watch the sun rise. 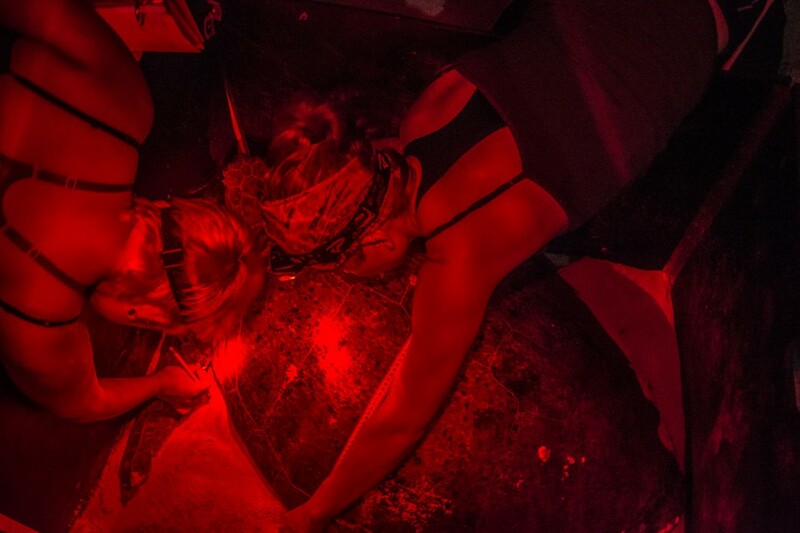 Sara and Devon take carapace measurements on Maria. 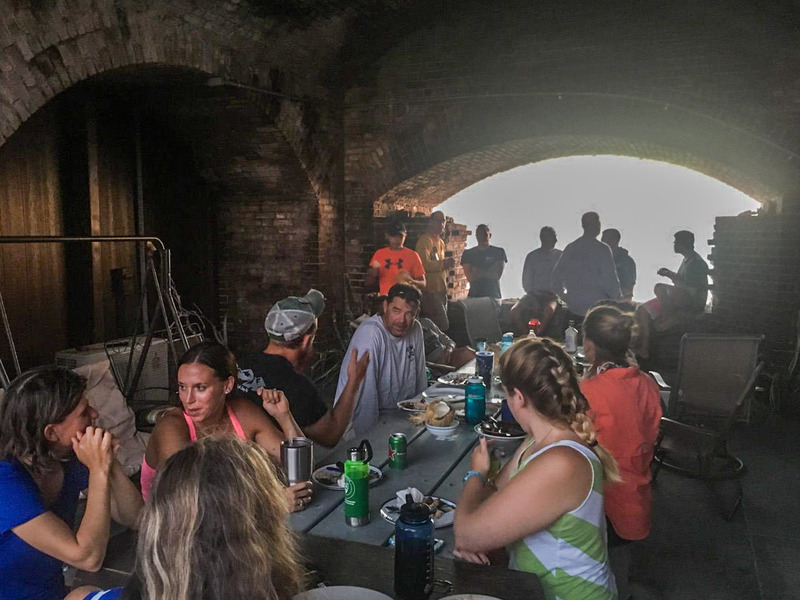 On our last night in the Dry Tortugas, the rangers called together a potluck. Everyone gathered in the crew quarters at the Fort as we laughed and shared stories of the week around delicious food. We talked well into the evening and even got to witness a green flash as the sun set over the cloudless horizon. Evening potluck with the DRTO staff at sunset. 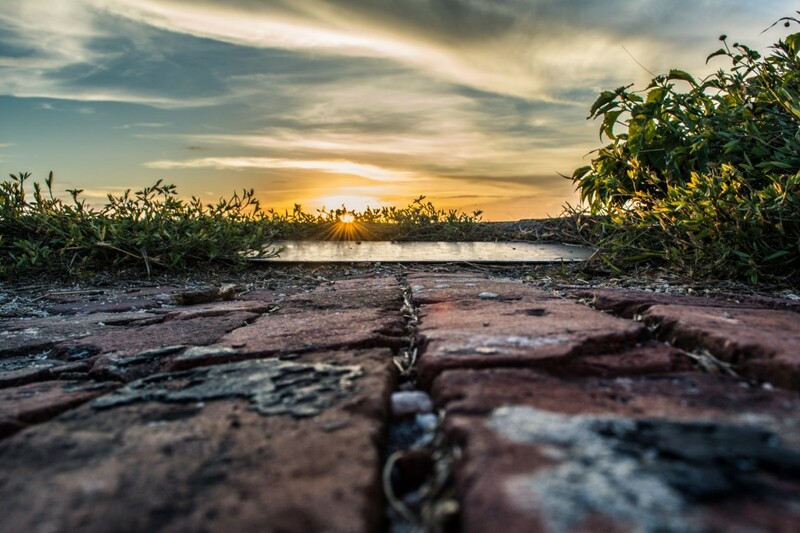 Sunset over the western bastion of Fort Jefferson. In the end, my time in DRTO was more than I could’ve imagined. The SFCN crew was friendly and warm and I was delighted to have lived and worked with such a passionate team of NPS staff. I’d really like to thank the entire SFCN team as well as the MV Fort Jeff crew for putting up with me during those 10 days and allowing me to join in on your annual monitoring effort. It was an incredible learning experience! This entry was posted in 2016 National Park Service, Current Internships, Internship Journeys on August 15, 2016 by Garrett Fundakowski. 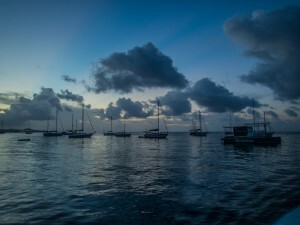 The first thing to greet me as I arrived in St. Croix was the light. Surrounded by the dark blackness of the ocean, a tiny island of light slowly came into view as the plane approached the airport. As the brightness grew in the night, so too did my excitement. This was it. The start of my adventures in the field for the National Park Service. So here I was in a new place, with an unfamiliar car, at night, slightly tired, learning to drive on the opposite side of the road. My what a challenge that was! Thankfully, I was just following Tessa’s car in front of me to Park Service housing, which helped me out tremendously. Even still, I managed to make a few turns to the wrong side of the road. Yet, I must say, by the end of the week, I was really starting to get the hang of and even enjoy driving on the left side of the road. Monday, July 4th, was a holiday so I had the day off. I made plans with my college friend who grew up on island, Cassandra, to see the Frederiksted fireworks. Beforehand, she excitedly invited me over to her house for a holiday barbeque her mom was hosting for friends and neighbors, as I was her first stateside friend to come visit her home and her island. Cassandra and her family are 9th generation Cruzans and I loved listening to their stories and learning about the culture and history of St. Croix from them. We all sat around the table talking and laughing, while enjoying a delicious buffet with citrus pasta salad, escabeche, baked macaroni and cheese, mahi mahi, and steak. That night, we ventured down to Frederiksted to watch the fireworks. In the square, local food vendors were set up along the street selling conch pates, fresh juices, and Johnny cakes (think a lighter, fluffier, more delicious donut). Unfortunately, just as we arrived, the weather turned for the worst and it began pouring rain. For a bit there, we all thought that the fireworks would be cancelled, but just as the rain stopped a loud crash echoed in the air. The reflections on the surface of the ocean and the sound of the waves took the display to a magical level. Perhaps my favourite fireworks display of all time! 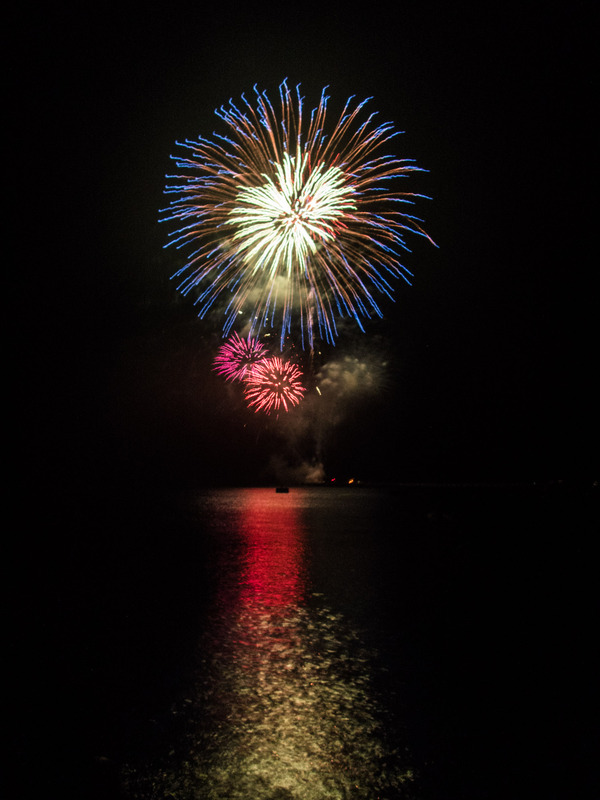 Fireworks reflect on the ocean waves on the 4th of July. The following morning I stopped by Park Headquarters to meet up with Zandy Hillis-Starr, Liz Whitcher, and Robby Fidler. Together, we all sat down to discuss our plans for the week with Zandy, Chief of Resources Management for the park. Liz is a graduate student from Florida Institute of Technology who is heading a study to assess coral accretion on the reef at Buck Island as part of a larger collaborative investigation with the NPS and the USGS. The plan for the week was that Liz, Robby, and I were going to be returning to sites to collect sediment traps and perform various transect surveys on the reef. 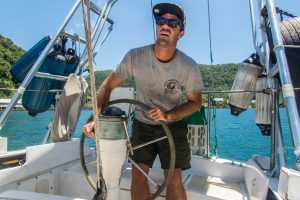 With the go-ahead from Zandy, we drove over to Green Cay Marina, where we met up with Jeff Gay, our boat operator for the week. After loading the boat with tanks and gear, we were out on the water on our way to Buck Island before 900. On our way over, Liz explained to Robby and I the exact plan for our dives. Each site consists of three sites – the fore reef, the reef crest, and the back reef. At each site of all 18 random locations, we needed to collect 6-month-old sediment traps and conduct five transect surveys – parrotfish (x2), sponge, urchin, and photographic. That’s a lot to do underwater! Each dive went the same. 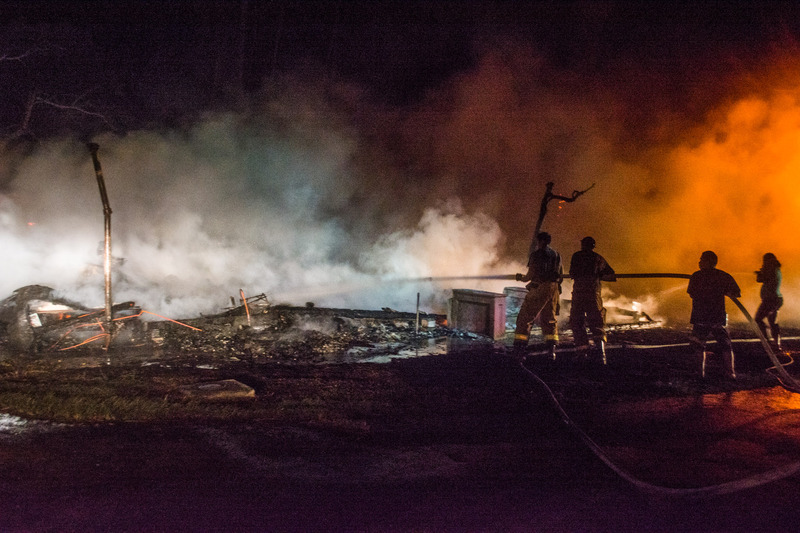 “80 feet…50…30, 20, 10.” The engines kicked into reverse before being shut off abruptly. “Go! Go! Go!” Jeff Gay shouted at us as we entered into the water for our dive. As the photographic and parrotfish surveys took longer and required advanced-level identification, my job was to perform the sponge and urchin surveys. 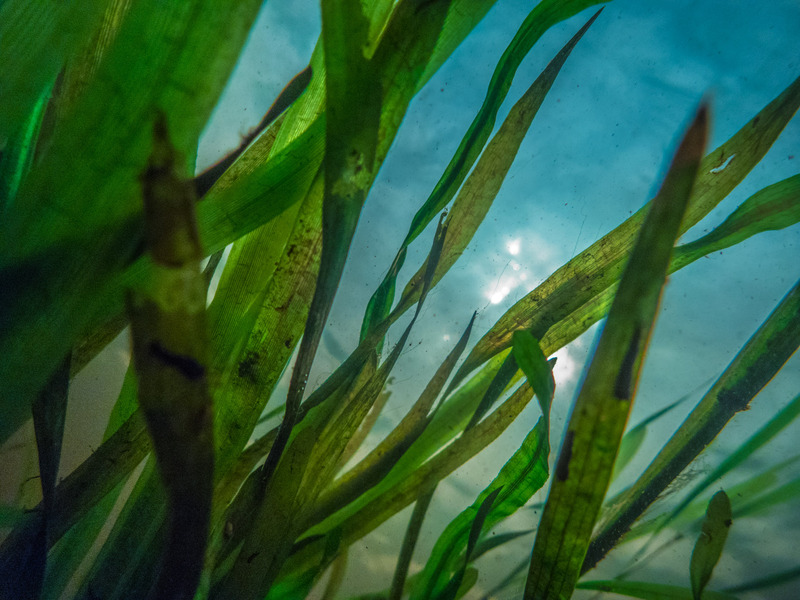 When we hit the bottom, each of us set up our transects and began our work. 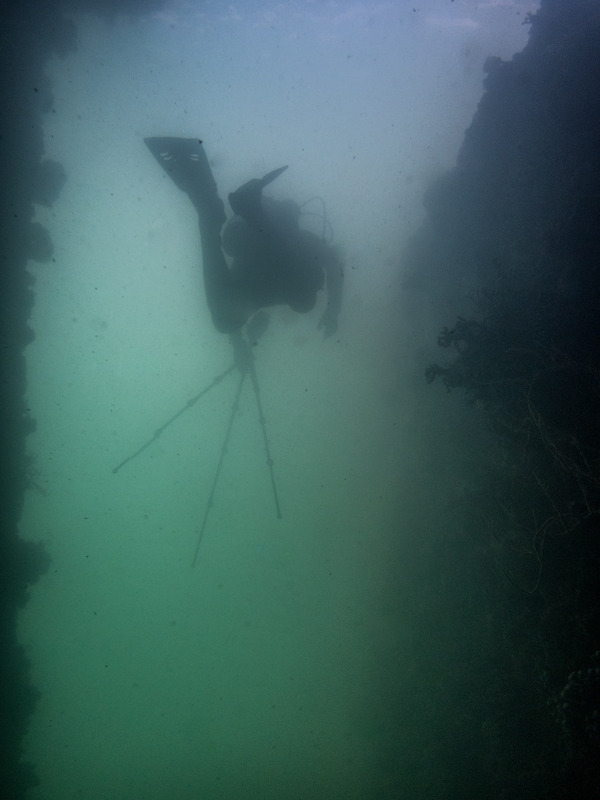 Hovering above the quadrat, I record the size and species of bioeroding sponges at multiple points along the transect. Swimming over a large colony of brain coral, Liz takes hundreds of pictures along the transect in order to produce a 3D photogrammetry model of the reef which can be used to get a more precise estimate of coral cover. 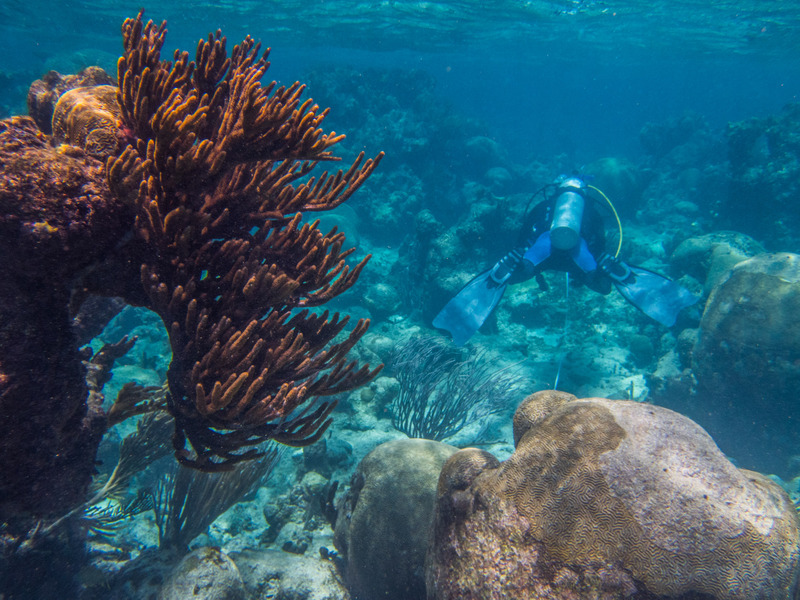 Robby swims away along his 30 meter transect to perform his parrotfish survey. 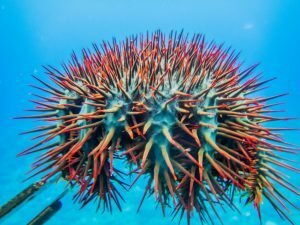 When I swam the 10 meters on the first pass, I would peek in, around, and under the coral heads in a game of reef “I spy” documenting the size and species of urchins. On the second pass, I held a half-by-half meter quadrat over the reef and estimated the surface area coverage of different bioeroding sponge species. I was shaky at first in my confidence of sponge identification, but I drew on my previous experience working with sponges in my undergraduate research lab and my comfort level with it grew as I the week went on. At first, the whole process took us just under an hour to complete at each site. The rough surf in less than 10 feet of water was new to me and definitely impacted the first few dives. 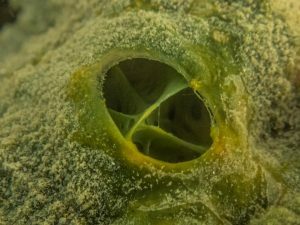 But as the week progressed, I grew more comfortable in the conditions and with my freshwater sponge identification, which allows us to accomplish two sites in one dive in the same time. After diving at 27 sites all around the island, most of which are closed off to diving by the public, I can say that the reef at Buck is gorgeous and diverse! 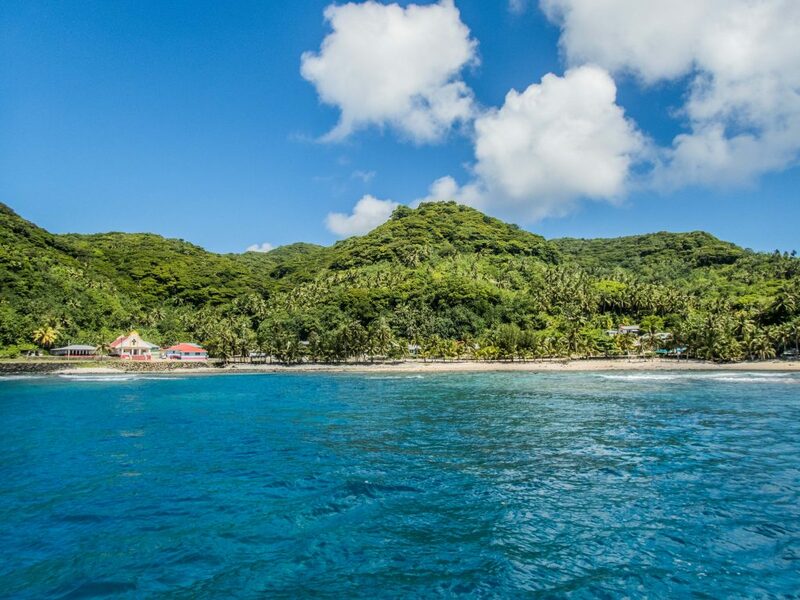 Buck Island is surrounded by a fringing reef with the reef crest about 500 feet from shore. 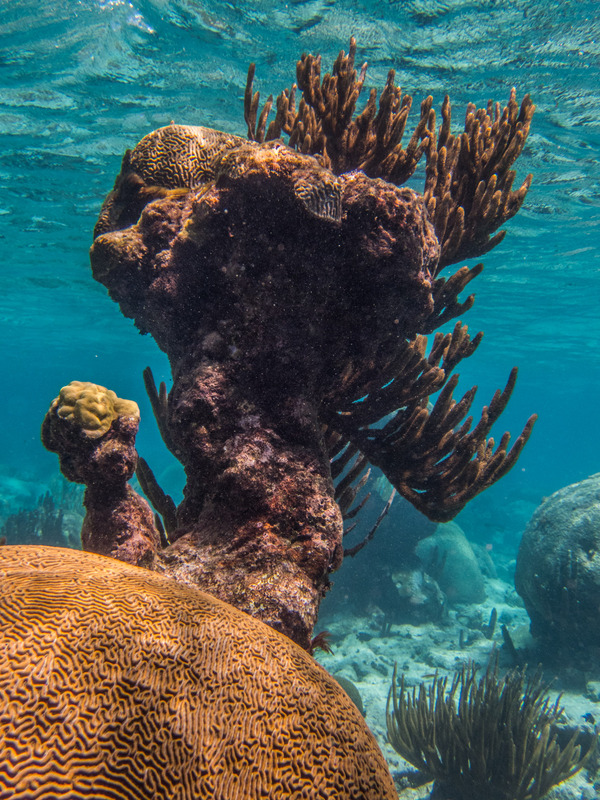 Beyond the reef slope, the north side of the island has these towering reef structures, aptly named haystacks, that emerge from the sandy bottom 30 feet below and sometimes break the surf. A soft coral attached to a dead structure, towers over a Symmetrical Brain Coral (Diplopia strigose) colony occasionally breaking the surface. While parts of the reef are laden with rubble, the reef is very much alive. Schools of blue tang often swam through our transects as a large barracuda would stalk us from a distance. Our tapes passed over giant colonies of brain coral a meter wide and sat next to large sea fans that swayed in the surf. 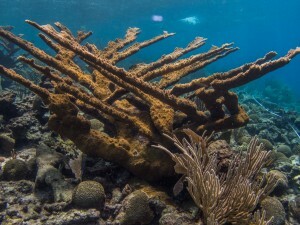 Perhaps the most striking thing about Buck was its abundance of Elkhorn coral (Acropora palmata). 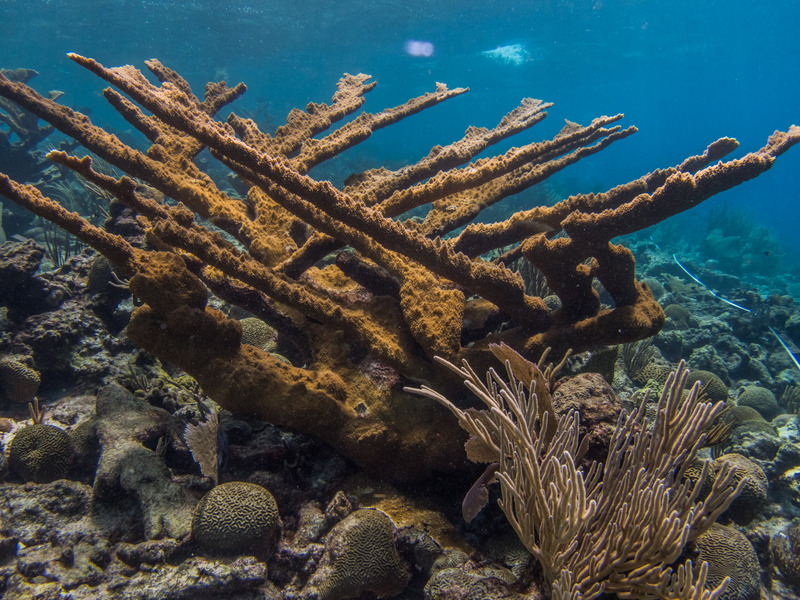 The two Caribbean species of Acropora are critically endangered and many places have seen massive die offs. Here, however, I was blown away by how big some of the stands were; they seem to be faring significantly better than other locations. An impressive Acropora palmata stands tall and healthy, towering over the rubble of dead colonies. Unfortunately, Liz and Robby had another week of surveys left and I had to head off to Florida to begin my next adventure. On my last night on island, Cassandra and her mom took me out for a sunset cruise on the Jolly Roger, a boat Cassandra used to work for in high school. While the sunset was less than photogenic, the laidback cruise was a relaxing way to end the week and offered Cassandra another opportunity to share her home with me. A relaxing ride on the sunset cruise. Cruzans are known for being particularly friendly and inviting, but none are more so than Cassandra and her mom. Thank you so much for welcoming me to the island and teaching me about your people and your home. Another huge thank you goes out to Liz, Robby, and Jeff for working long days out with me on Cara Cara and teaching me new things along the way. I wish I could have stayed longer to help you finish your surveys! 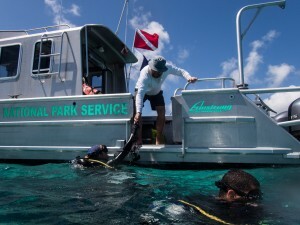 Jeff, our boat operator, grabs our gear and helps Liz, Robby, and I get out of the water after a dive. 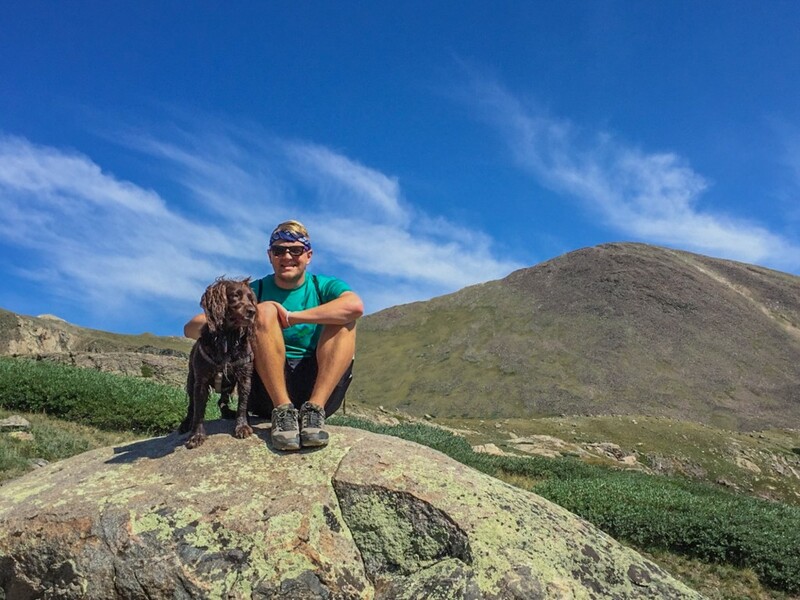 This entry was posted in 2016 National Park Service, Current Internships on July 29, 2016 by Garrett Fundakowski. Hi there! 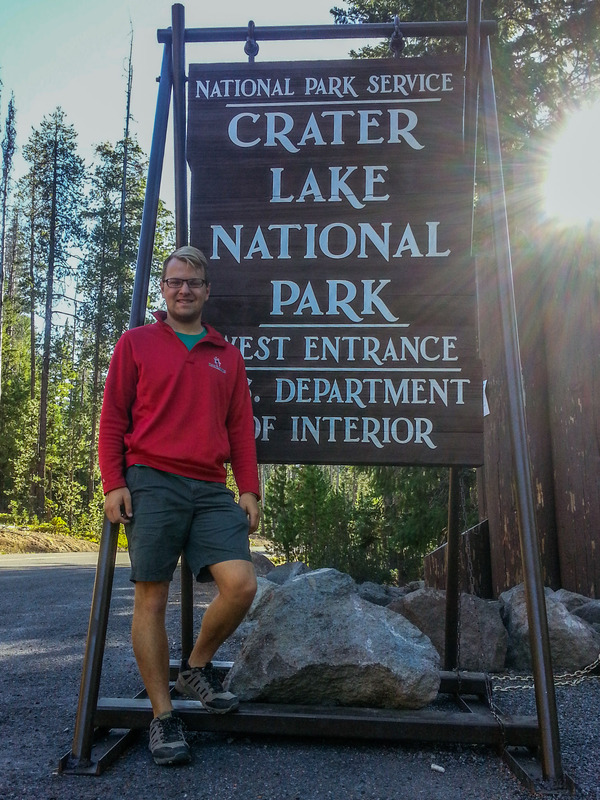 My name is Garrett Fundakowski and I am the 2016 Our World-Underwater Scholarship Society National Park Service Research Intern! 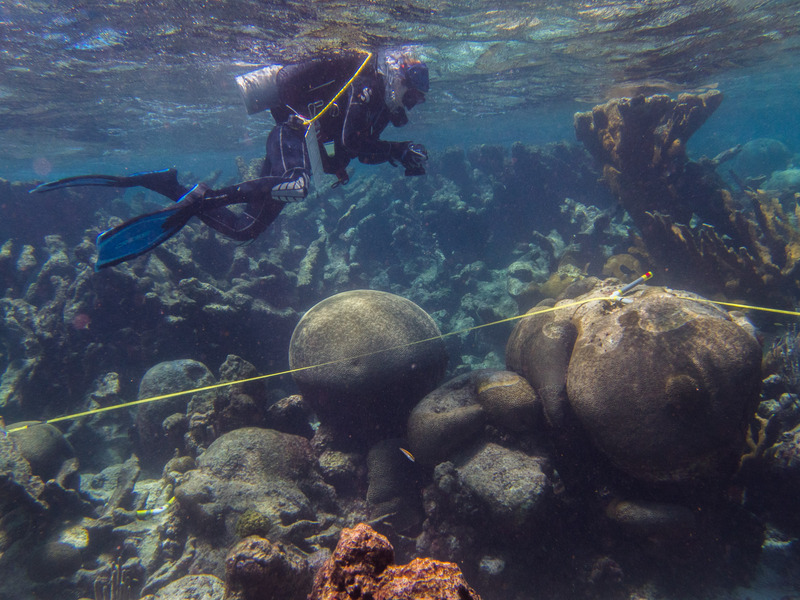 This summer I have been given the opportunity to travel the country to live, work, and dive alongside leading underwater archaeologists, photographers, and research scientists in our nation’s National Parks. 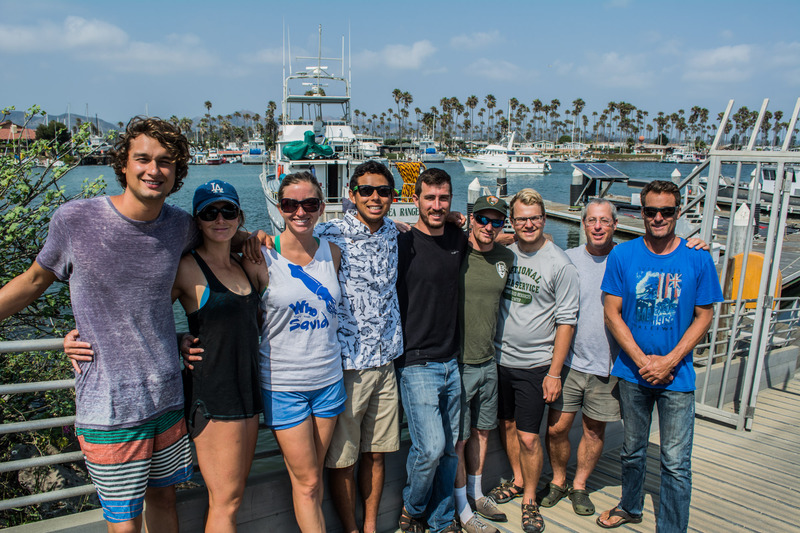 Thank you to both the Our World-Underwater Scholarship Society and the Submerged Resources Center for their overwhelming generosity in putting together and funding this once-in-a-lifetime experience. 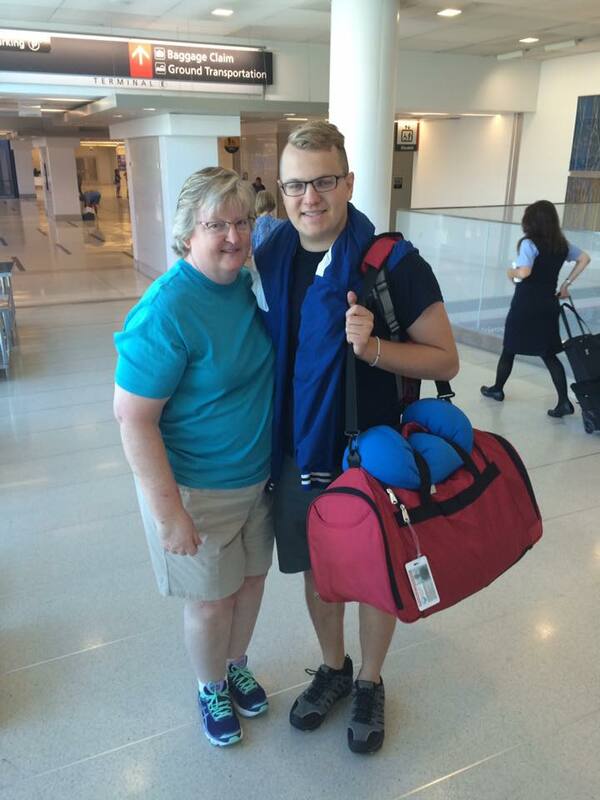 Last Saturday, following a late night filled with packing and repacking and triple-checking my lists, my parents dropped me off at the Philadelphia airport to send me on my way. I was both excited and nervous to start my journey! 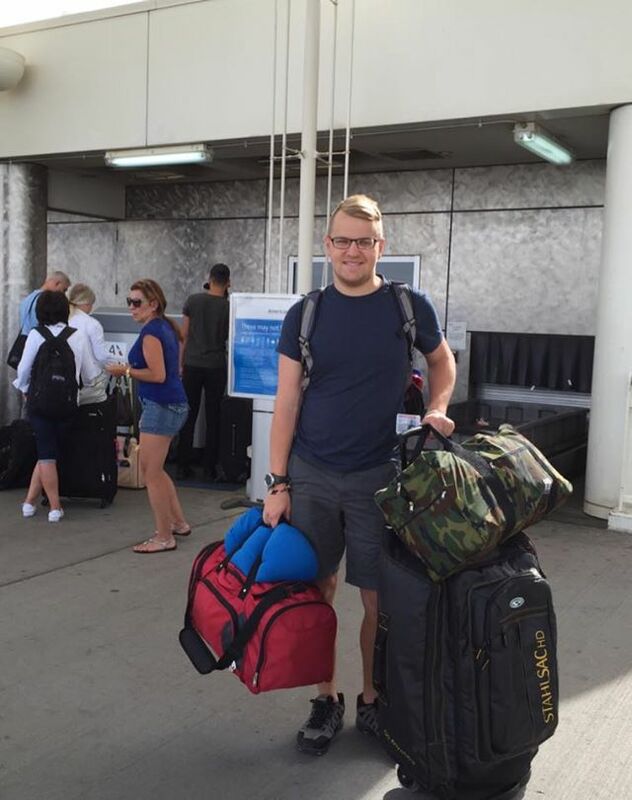 To kick off the non-stop summer of adventures, I spent my first week at the SRC office in Denver, Colorado. I landed in Denver Saturday evening and stayed the night with my friend Abby and her family. To make sure I really hit the ground running (pun intended), I joined Abby and her father for the Stadium Stampede 5K run along the Platte River in downtown Denver bright and early on Sunday morning before heading over to meet up with Jessica Keller, an Archaeologist for the SRC and my gracious host for the week. After settling in, Jessica and I quickly got acquainted and bonded as we watched the epic season finale of Game of Thrones. The next day we carpooled to the office, where I was given my visitor’s badge and a tour of the facility. As the remaining SRC crew entered the office, I was greeted with warm smiles and friendly faces; it wasn’t long before I was joking around with everyone else. Since everyone had just gotten back from various projects and this was one of the only times everyone would be in the same place all summer, Dave Conlin, Chief of the SRC, gathered the staff for a meeting to debrief the most recent projects and discuss the travel schedule for the group for the next few months. It was fascinating to see how the whole operation works from the inside. After the meeting, I sat down with Brett Seymour, Photographer and Deputy Chief of the SRC, and laid out my own schedule for the summer. 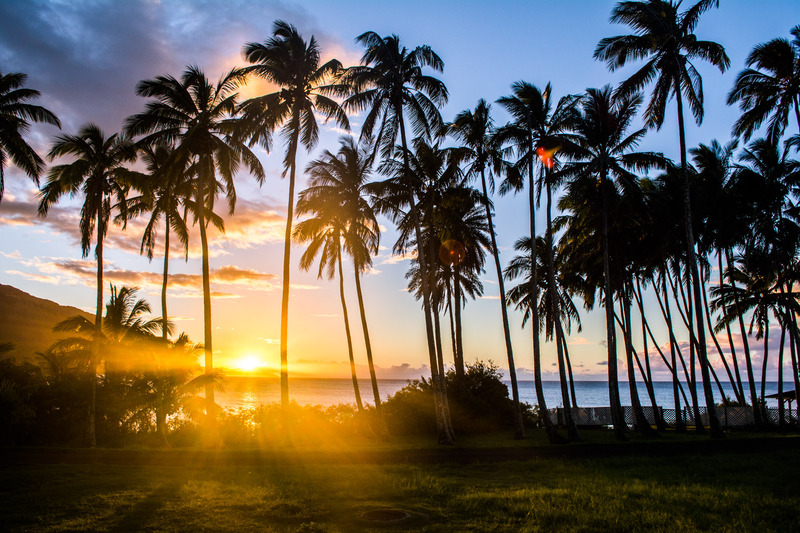 This summer, my travels will take me from St. Croix to Hawaii, Florida to California, and even as far out as American Samoa! Having only ever dove in the Caribbean, I am extremely excited to head out to the Pacific later this summer and be exposed to an entirely new ocean and its fauna. The following day, Jessica and I spent all morning at Presbyterian/St. Luke’s Hospital. In order to dive with the NPS, I need to acquire a Blue Card. The Blue Card is the NPS’s diving certification and it not only requires passing a written test and demonstrating physical fitness and diving skills in the water (which were scheduled for later in the week with Brett), but also visiting a hyperbaric doctor for a dive physical to ensure their divers are in tip-top shape before getting in the water. After squeezing me in for a last-minute appointment, Dr. Clem cleared me to dive barring my results from the required medical assessments were normal. I managed to get a chest x-ray, blood work, and an ECG done at P/SL in one day, with my audiology appointment scheduled for the following afternoon, earning myself the “record” for the fastest intern dive physical. 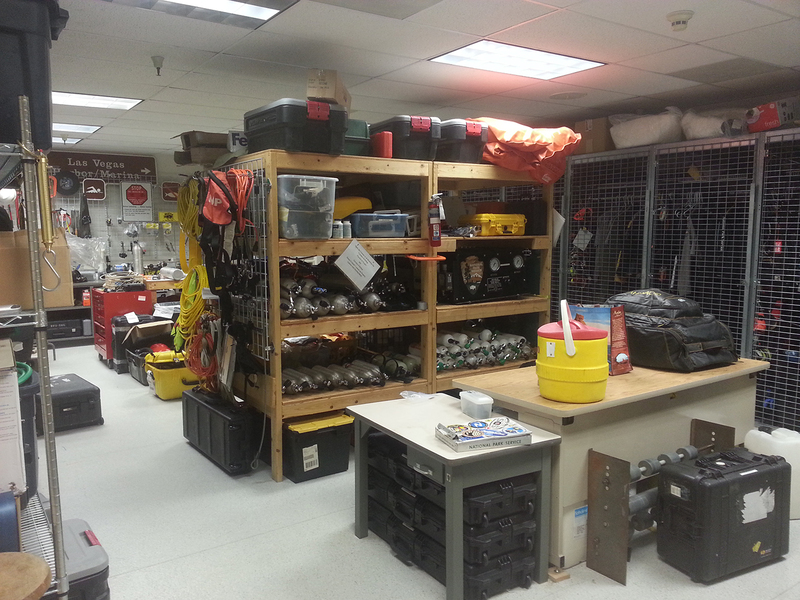 The remaining hours of the day were spent in the dive locker with Brett, pulling gear for my summer travels. In the past, some interns have visited places where colder waters necessitated packing a dry suit, but as I won’t be venturing too far north, I will only need a standard wetsuit. We fit me out with a wetsuit, a shortie, rashguards, booties, gloves, swim trunks, and a BCD, as well as a variety of SRC apparel that will serve as my uniform for the next few months. That night the SRC had their annual summer barbeque. Steve Sellers, the National Dive Safety Officer, and his family graciously had the entire office over for a delicious potluck dinner. Not even a little light shower could stop the SRC crew from firing up the grill and laughing around the table. Aside from that, the rest of the week went smoothly. 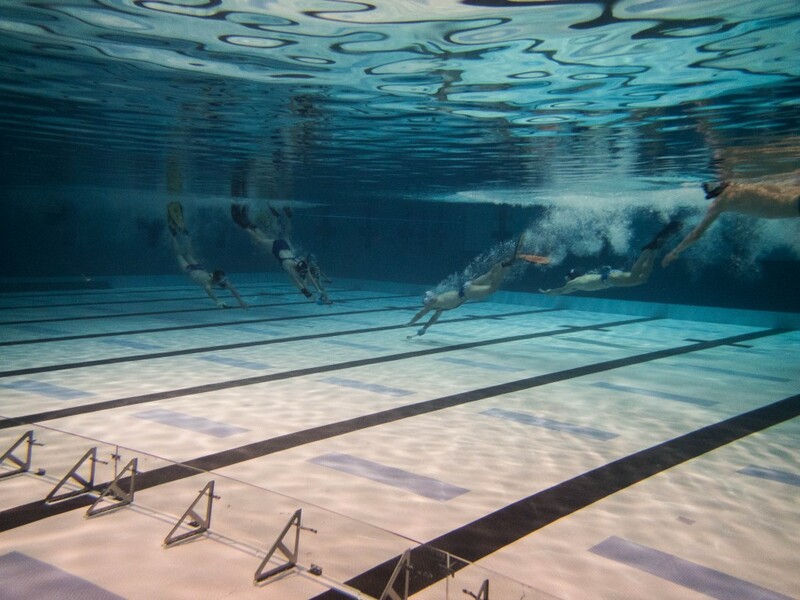 I was a bit nervous for the Blue Card test, but being a former swimmer of 13 years has given me a calm disposition in the water and helped me complete even the daunting “ditch-and-don” skill. 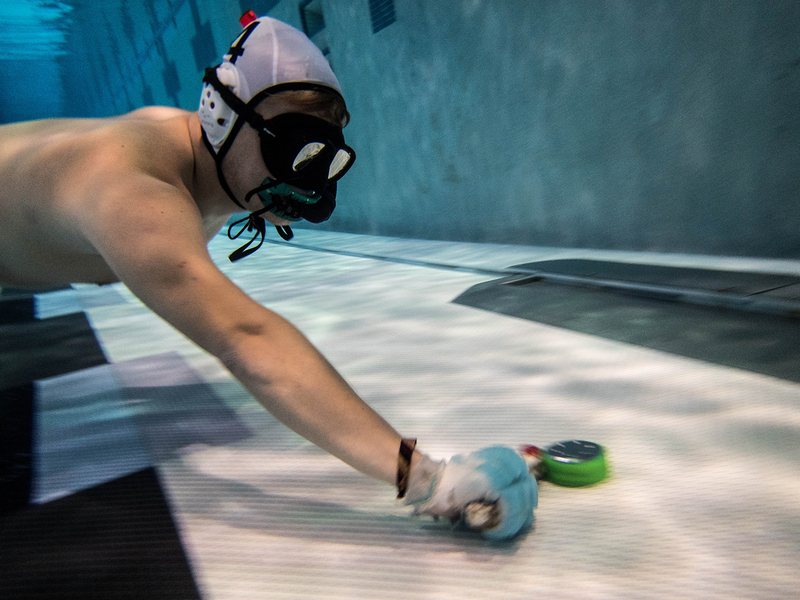 In fact, my previous swimming experience really came out when Jessica took me to Underwater Hockey practice. After a quick orientation to the rules and a couple rounds of observation, I joined in on the chaotic mess at the bottom of the pool. Admittedly I committed a couple fouls, but I managed to shimmy my way to the puck and score a few points by the end. And I was playing alongside some of the men and women who have competed for the National Team, so I consider it an accomplishment to have scored a goal or two. Overall, it was a ton of fun and I would definitely do it again! 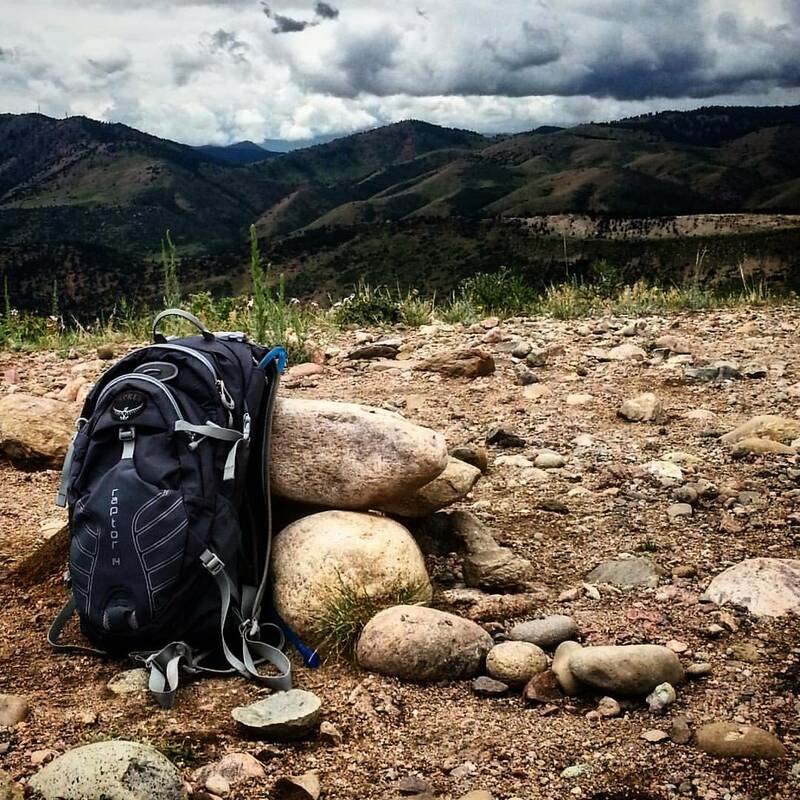 When Saturday finally rolled around, I had some time to explore the rolling hills of Colorado and go on a hike before my flight left the following morning. I hiked up Green Mountain just down the road from the SRC office and it provided a breathtaking view of the city in the distance. A spectacular way to end my stay in Denver! 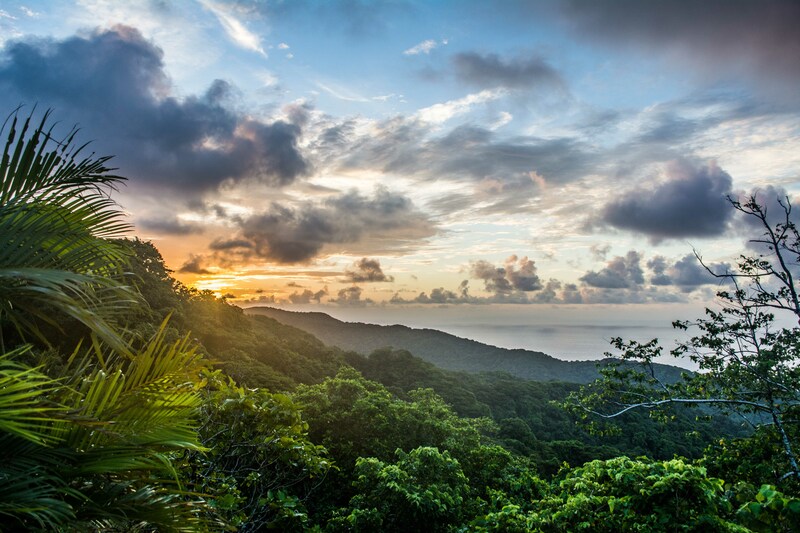 The next morning, Dave dropped me off at the airport and I was on my way to St. Croix in the US Virgin Islands to work at Buck Island National Monument! Thank you to the entire SRC staff for being so warm and welcoming! You invited me into your homes, let me stay on your couch, took time out of your day to teach me new software, had me over to join in on board game night, talked to me about my future career plans, introduced me to your family, assisted me in the process of arranging travel, and tailored my journey to fit my personal career goals. Without you, this internship would not be possible. Once again, I am thrilled to have been given this opportunity and am amazed at how willing each of you are to help me on my journey to discover my passion. I hope I make you all proud! 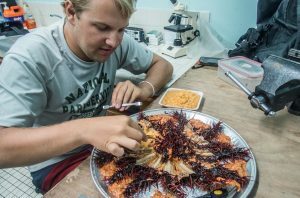 This entry was posted in 2016 National Park Service, Current Internships on July 12, 2016 by Brett Seymour.